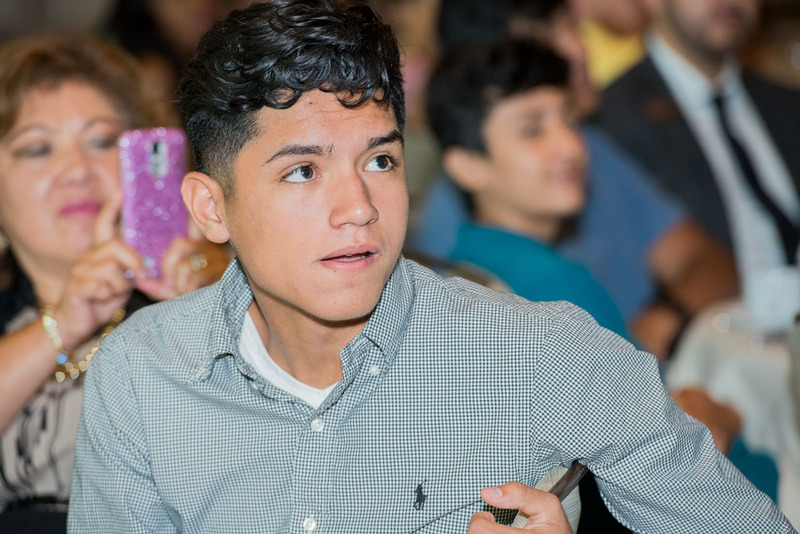 That was the goal. 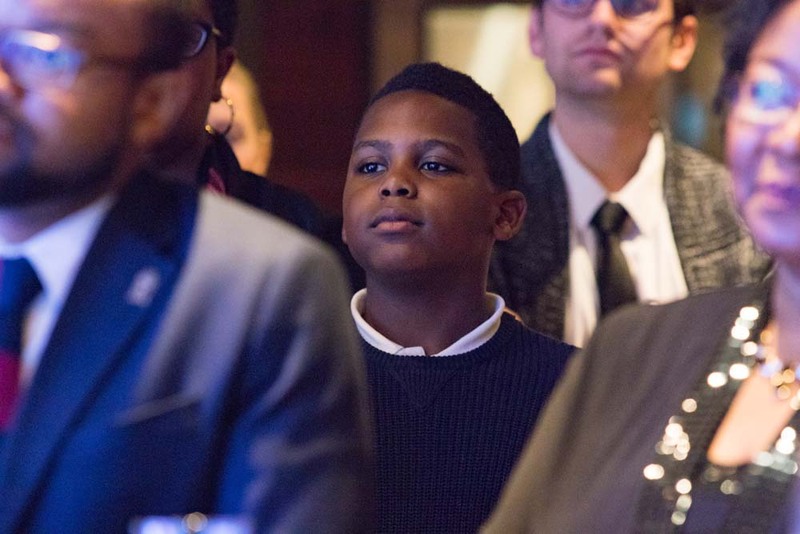 That was the dream. 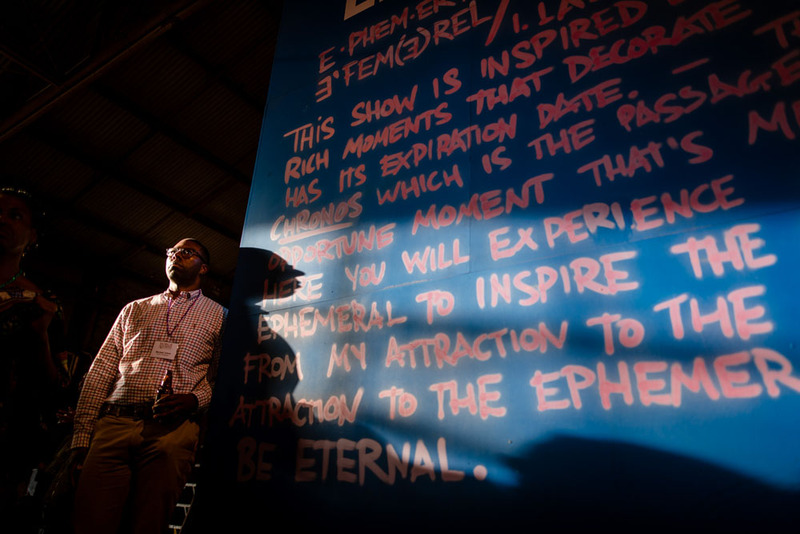 That was the directive. 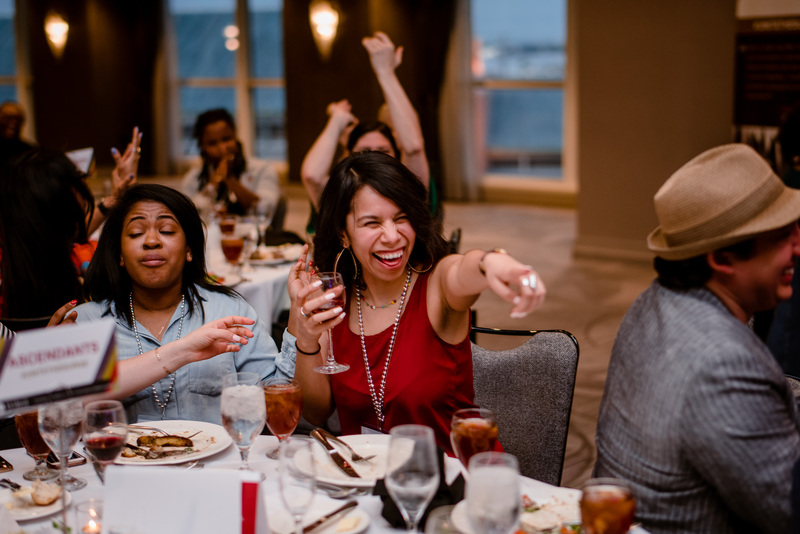 And we did it! 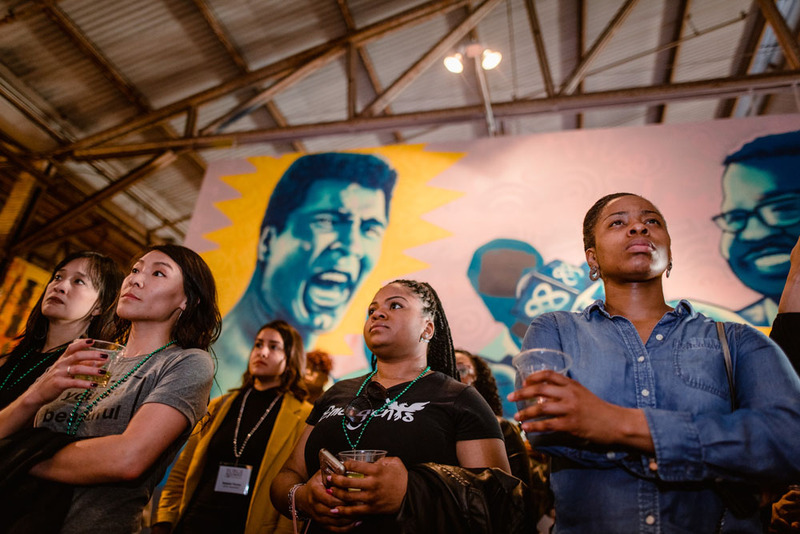 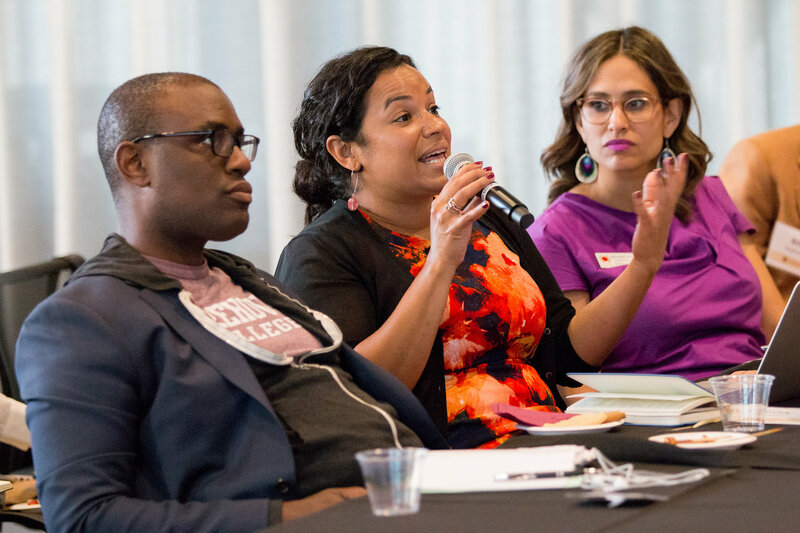 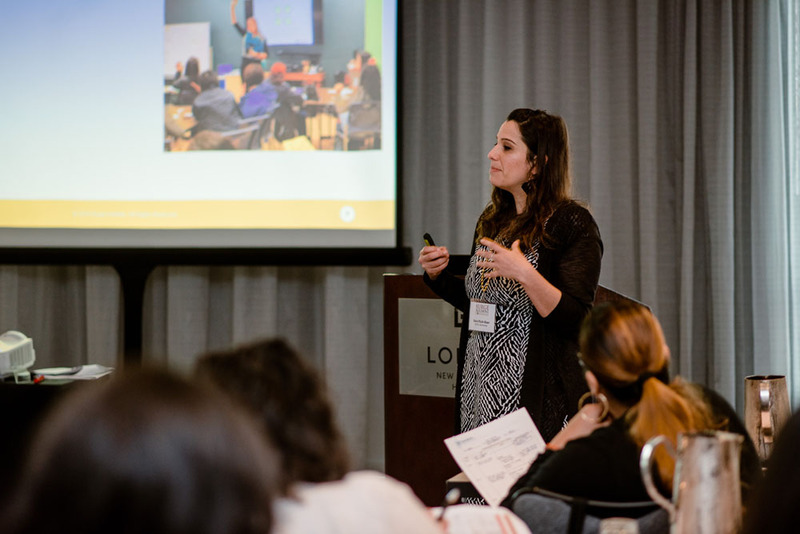 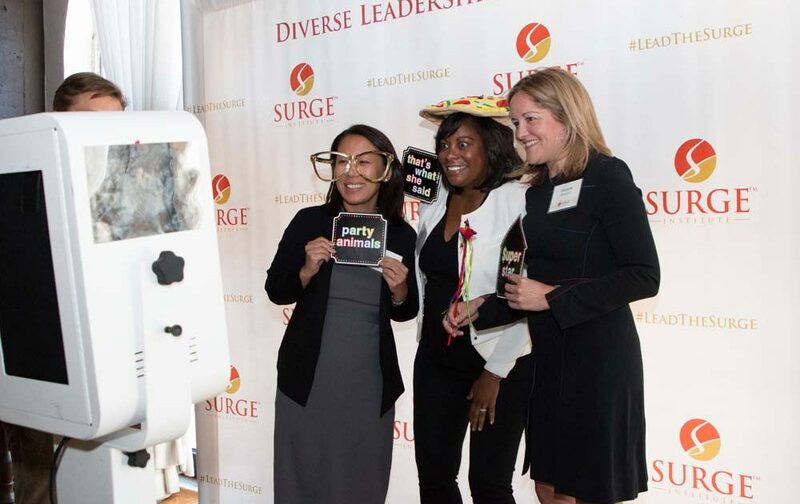 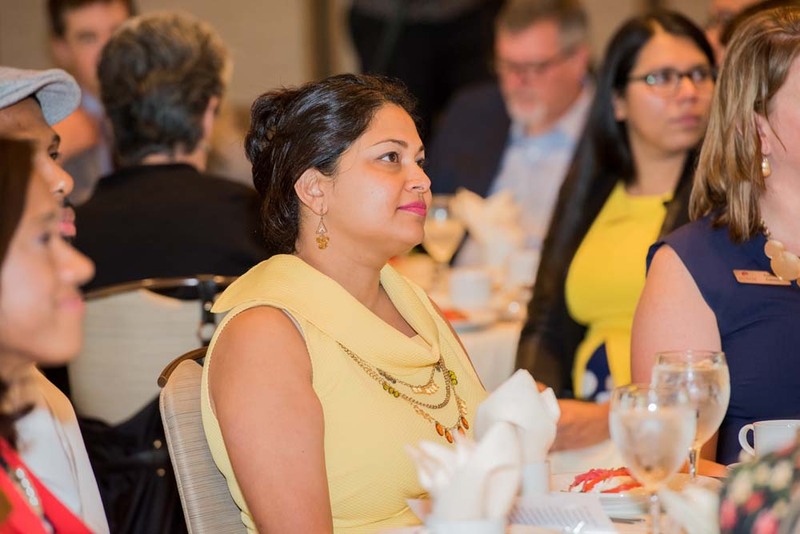 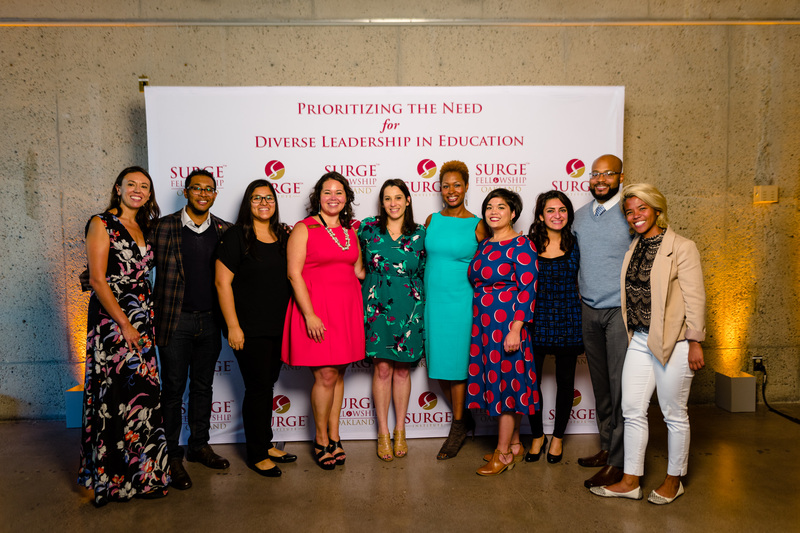 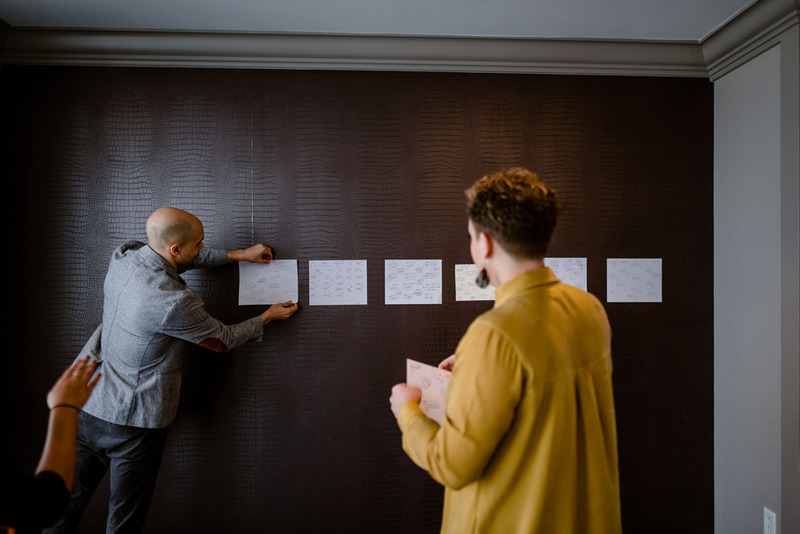 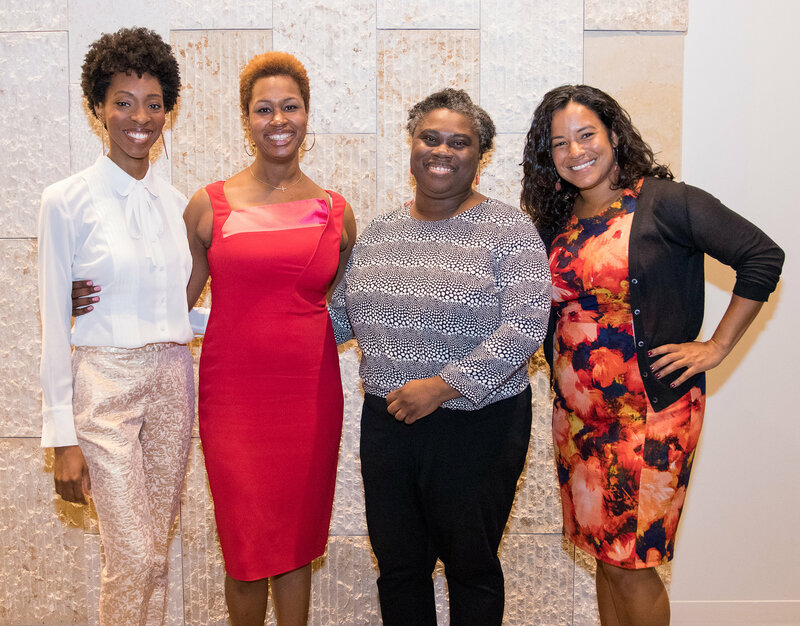 The Surge Alumni Convening was the inaugural annual gathering for Surge Alumni to bring our community together in our efforts toward continued learning, best practices and access to education leaders of color. 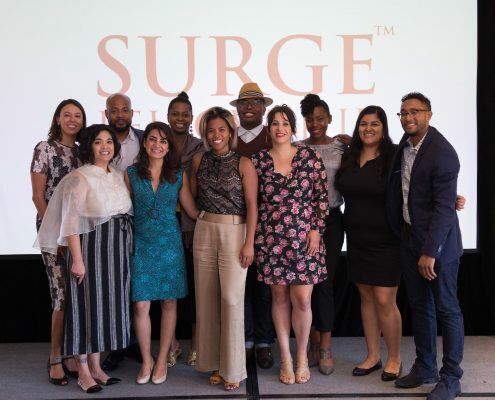 Five cohorts of Surge Fellowship Alumni united in power, love, determination, and genius, truly representing what this movement is all about: bringing our people together so that we can transform the world for our youth and communities. 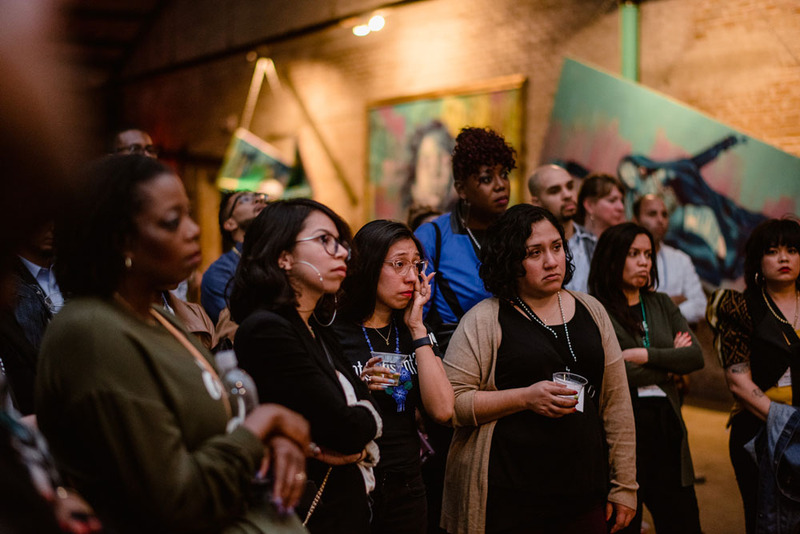 We chose the word convening over conference, because his wasn’t a “sit and get” experience where folks expected to be presented to but rather a space for co-creation. 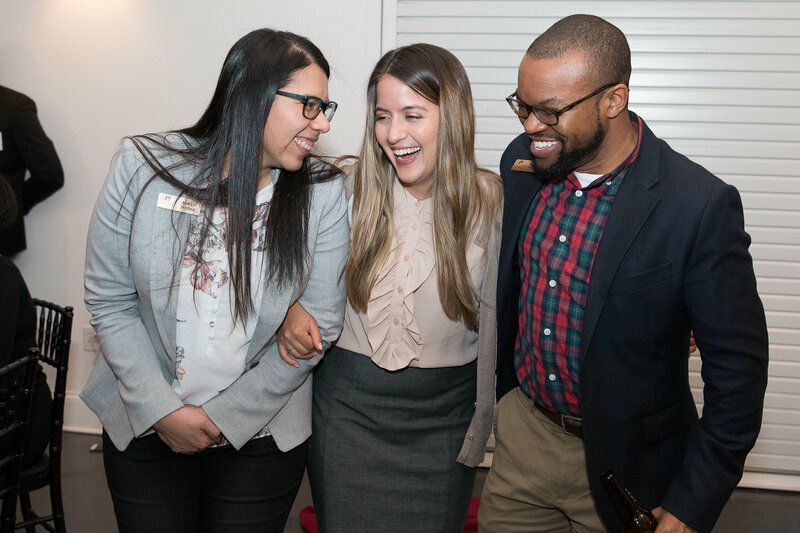 We chose to focus on alumni specifically because this is an ongoing experience that could never have ended upon completing the fellowship experience. 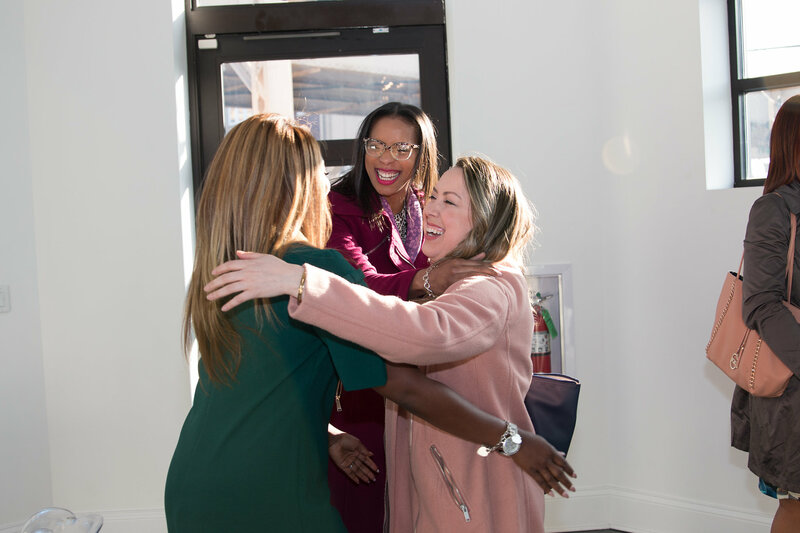 We chose the word inaugural because this is the first of many. 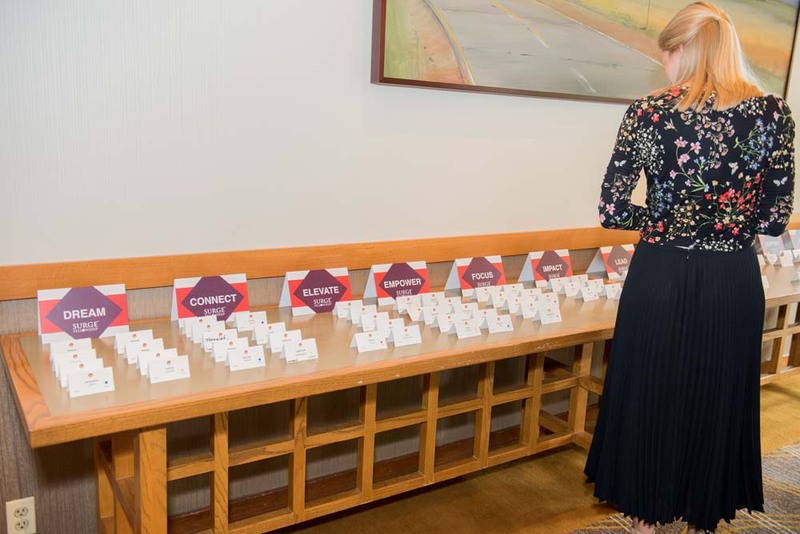 And what a first it was! 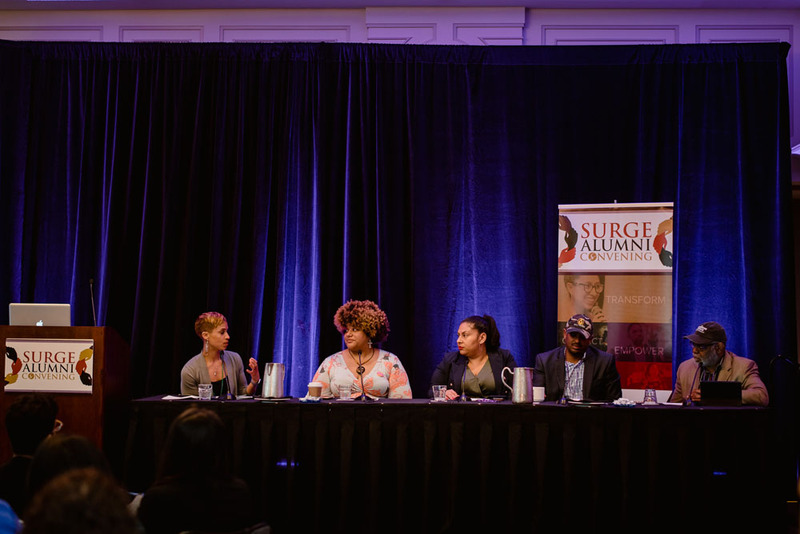 Surge Alums from all over the country led breakout sessions tackling a myriad of needs and spaces, from moving beyond trauma to racial equity to entrepreneurship. 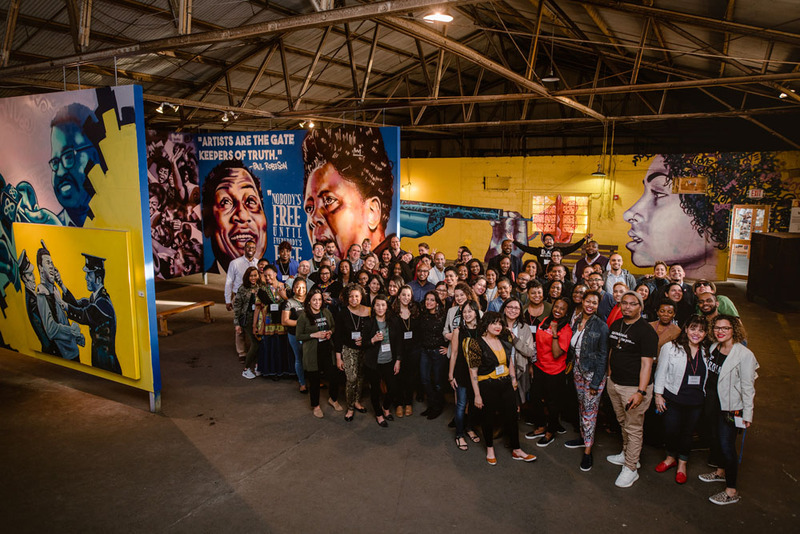 This is truly a growing body of thought leaders, ready to unite and transform what education looks like, and that has never been more evident than it was in NOLA! 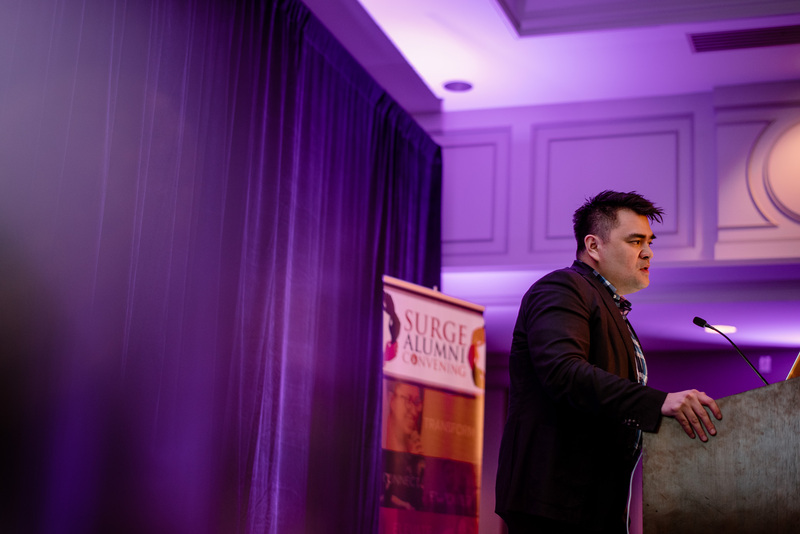 Attendees heard from Jose Antonio Vargas about his personal journey as an “out” undocumented immigrant as well as the movement he is building with Define American. 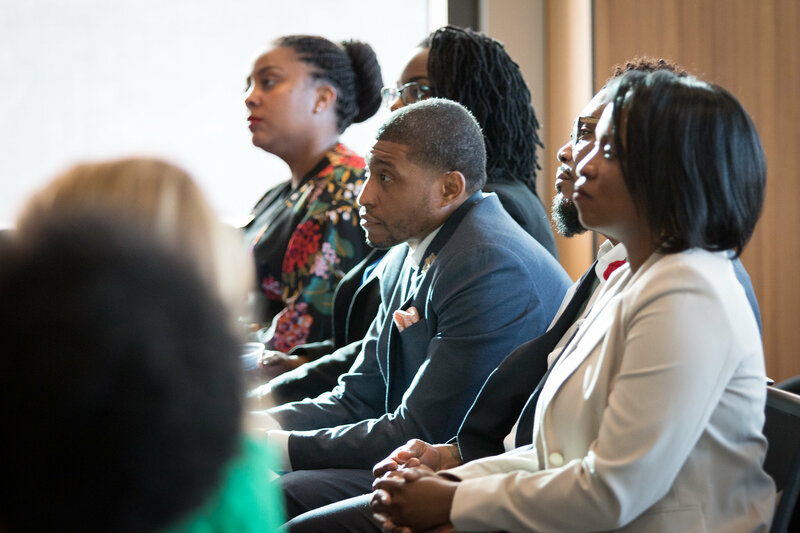 An esteemed local panel of powerful and brilliant leaders of color shared about the challenges of education in New Orleans and beyond. 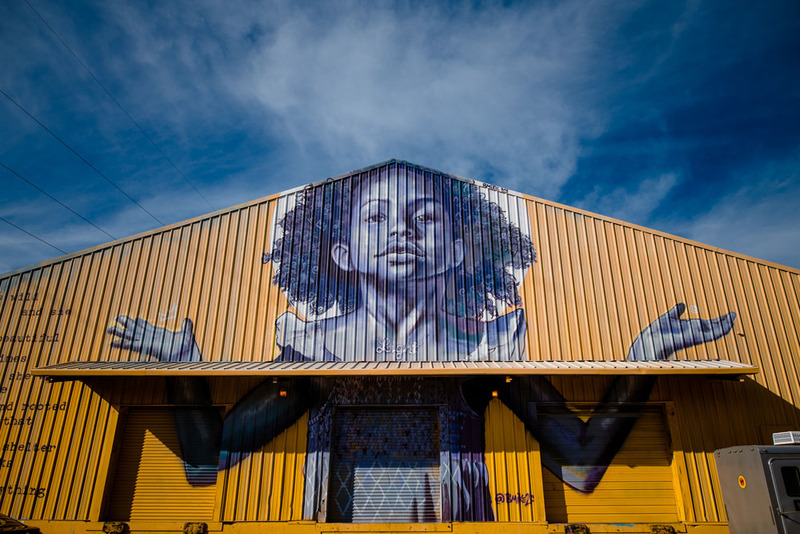 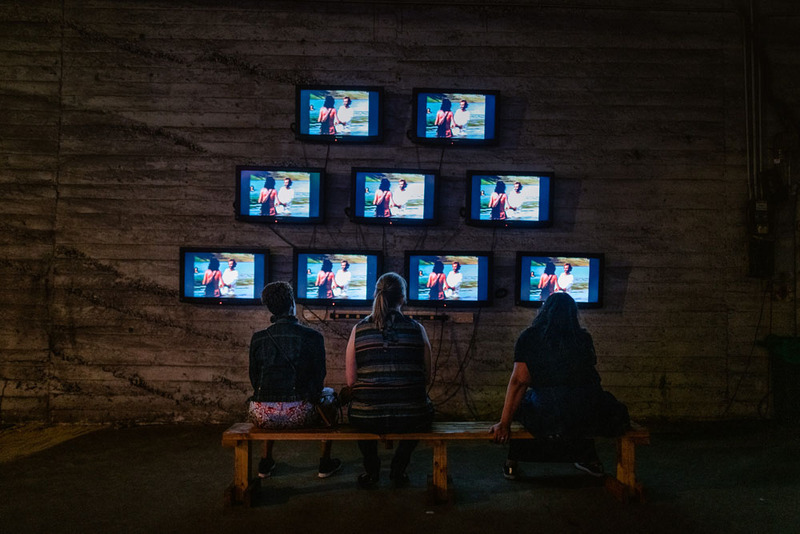 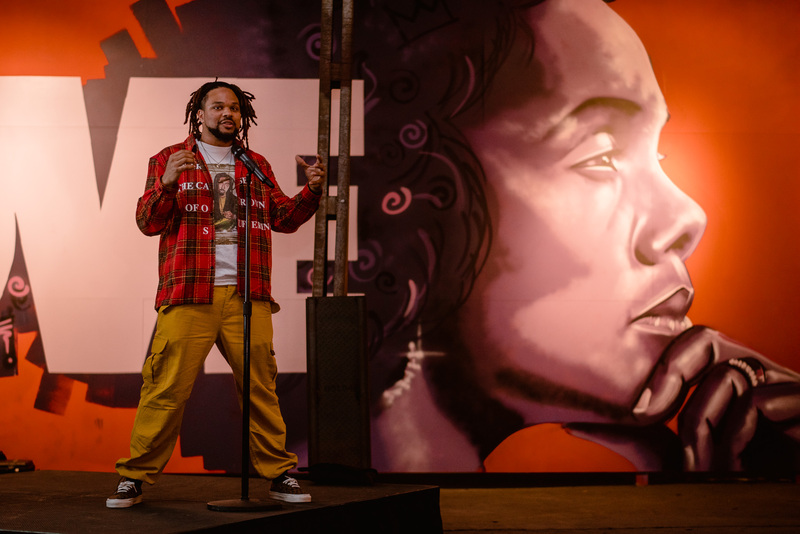 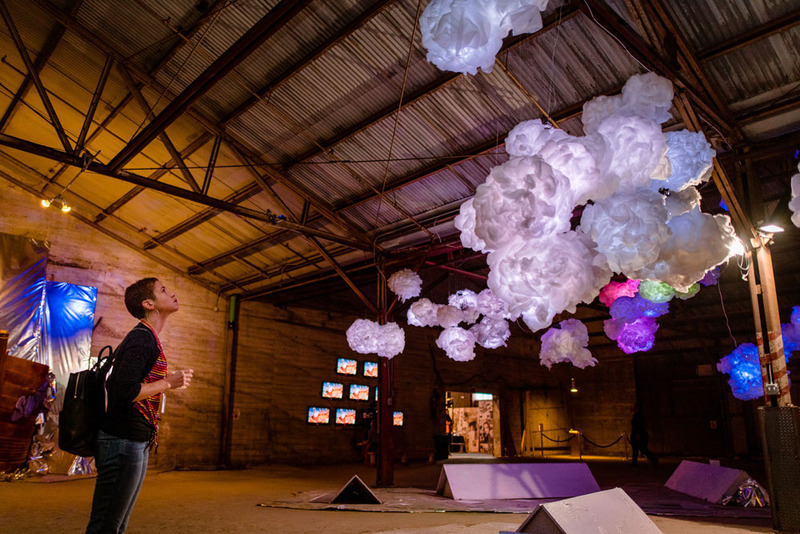 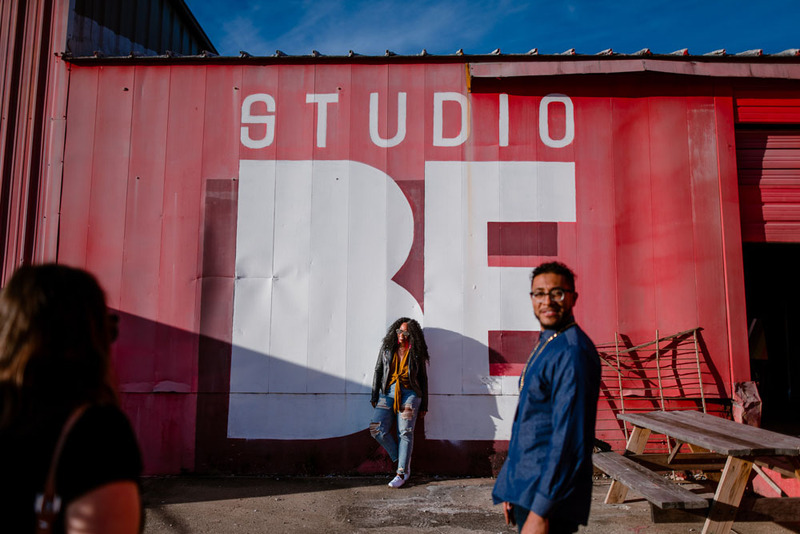 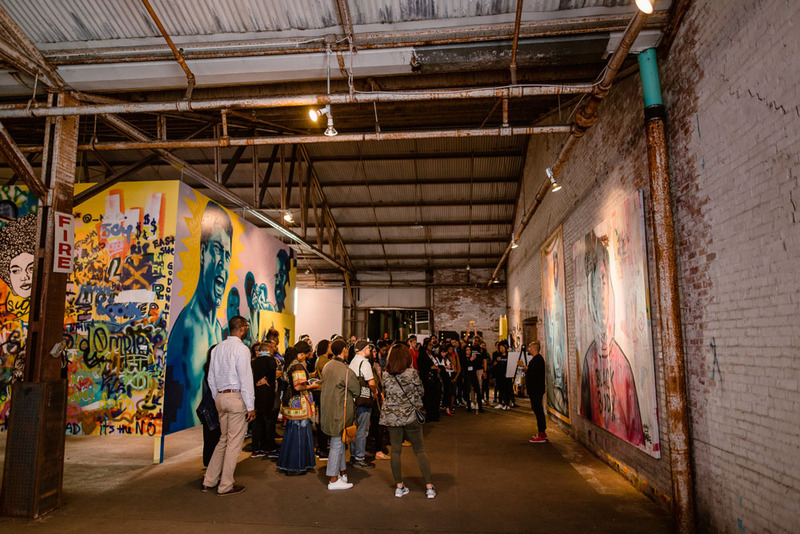 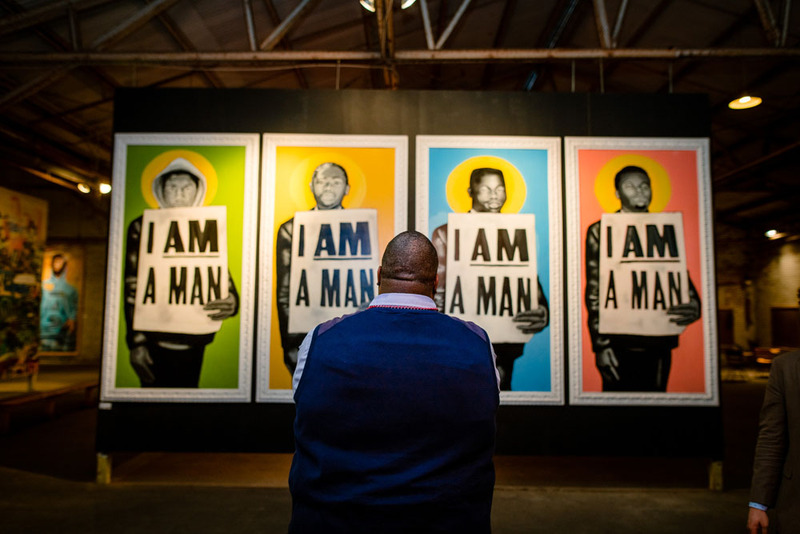 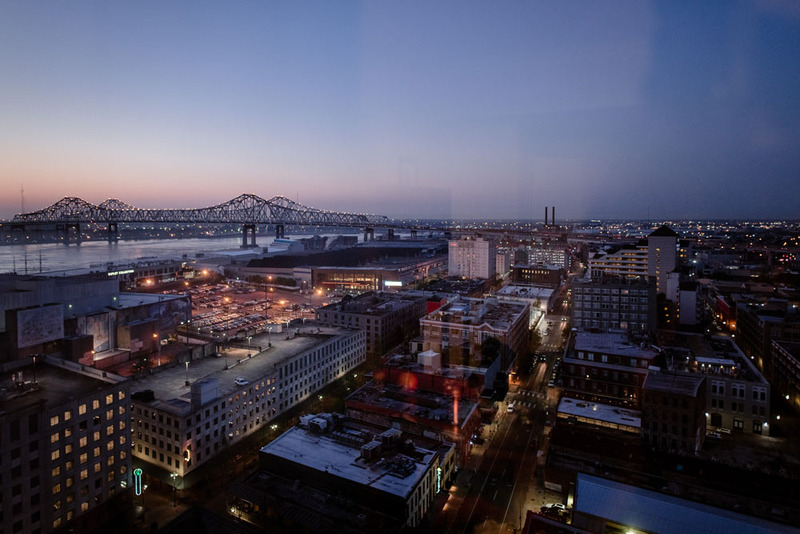 New Orleans artist Brandan “BMike” Odums took group on his leadership journey as an artist, activist and provocateur at his incredible warehouse turned art installation Studio Be. 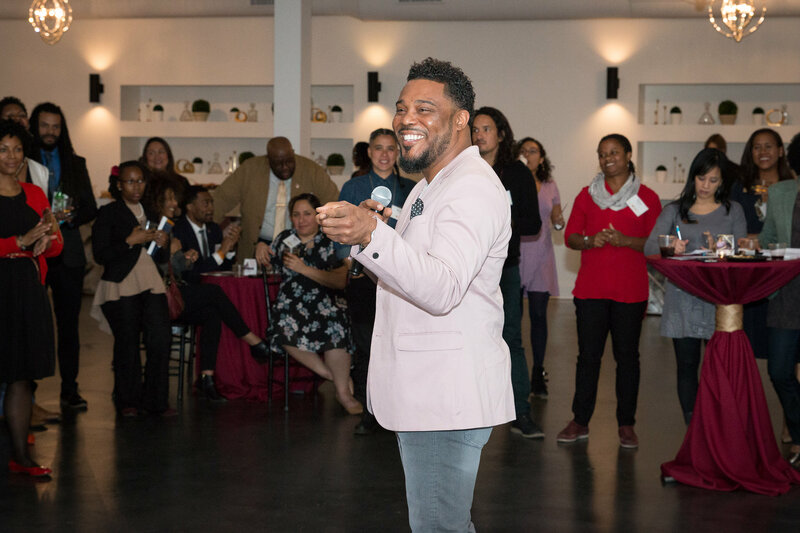 Chief Executive Officer at the Vocati Group and Surge Faculty member Dr. Nicholas Pearce gave honest answers on what it means to live in one’s purpose. 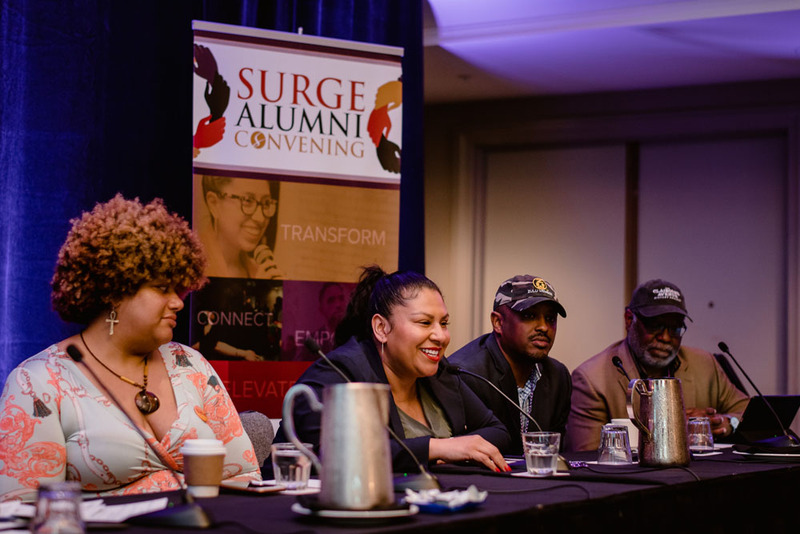 The inaugural convening was truly a converging of strength and brilliance, the likes of which the Surge movement has never seen, and we are eager to unite our alumni community again as we continue to grow in numbers, impact and connection. 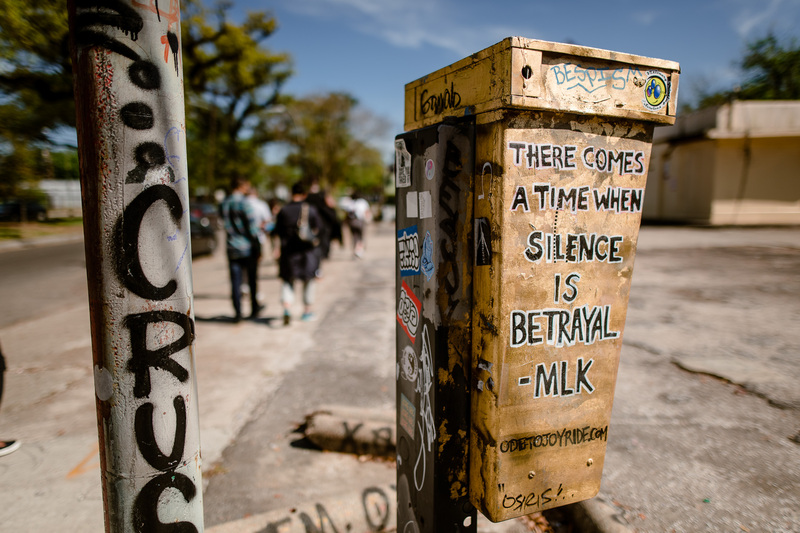 The narrative has not been rewritten yet. 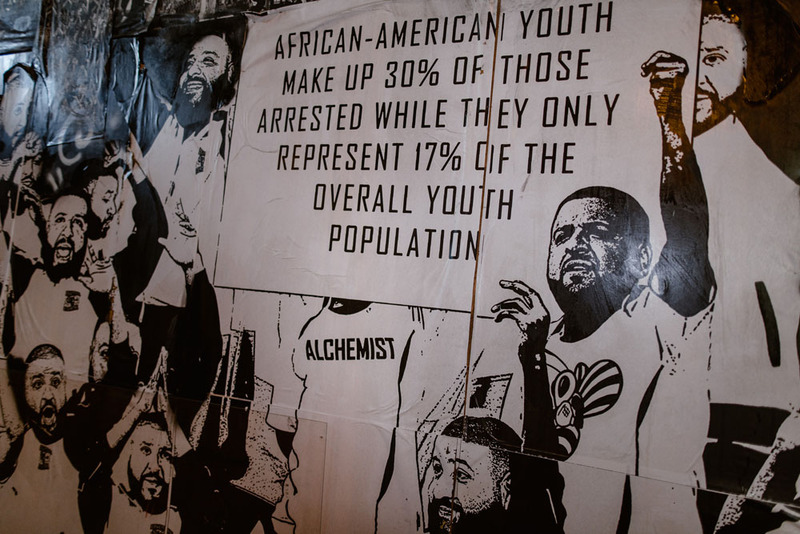 But we’re off to a great start. 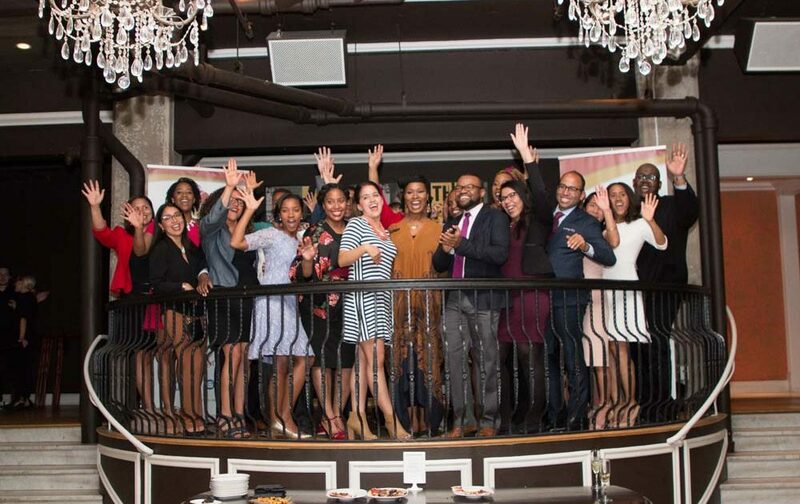 The Surge Institute reaches a powerful milestone in the history of our movement as thirty-five 2018 Surge Fellows across two cities graduate! 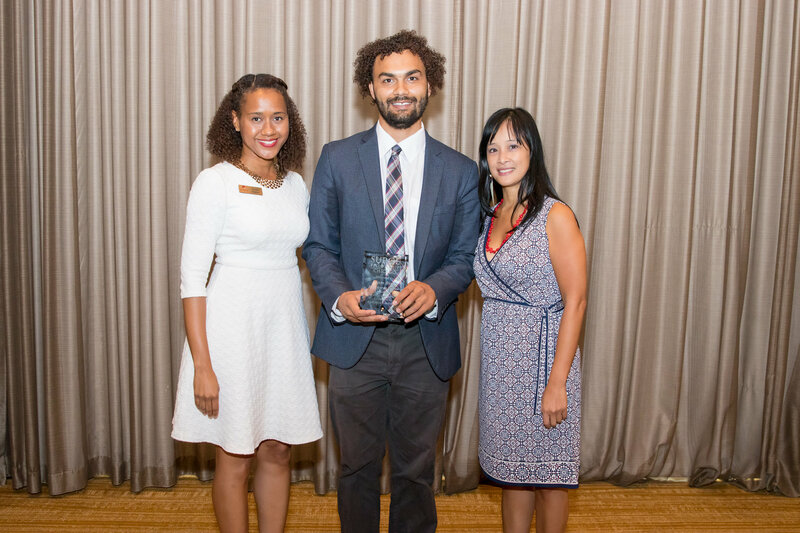 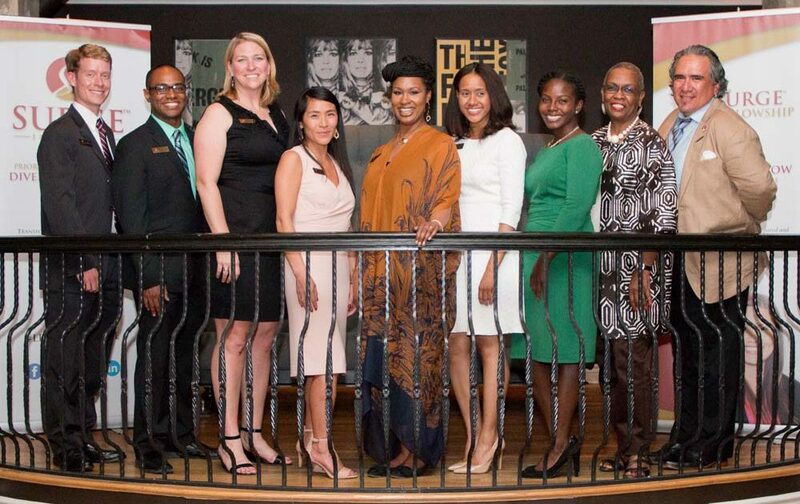 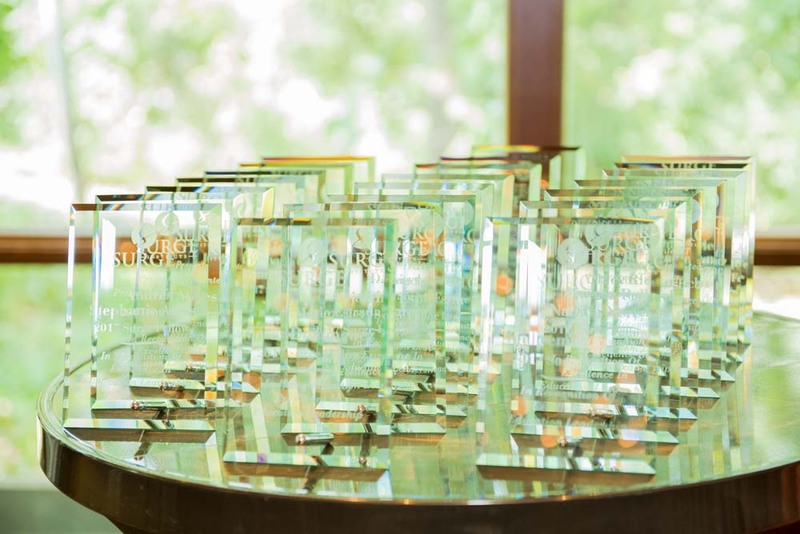 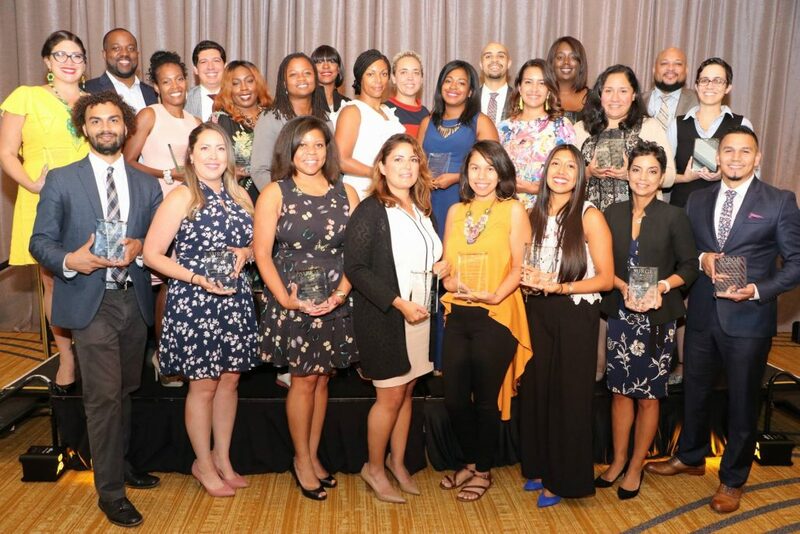 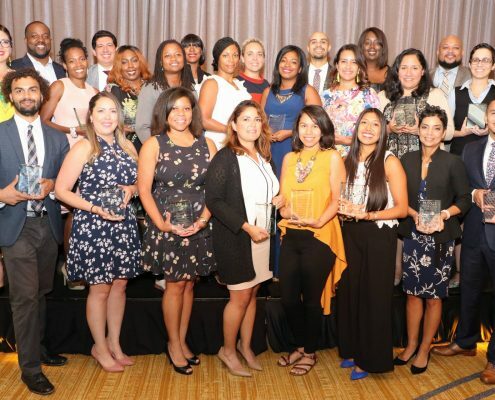 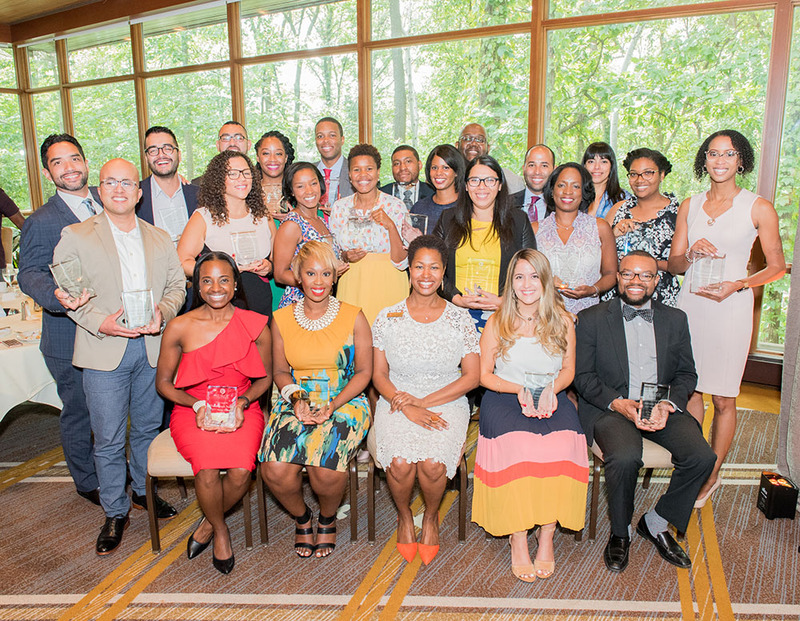 On August 18, 2018, we celebrated the Ascendants, our 2018 Chicago Surge Fellows, as they matriculated to alumni in a beautiful ceremony at the Hyatt Lodge in Oak Brook, Illinois. 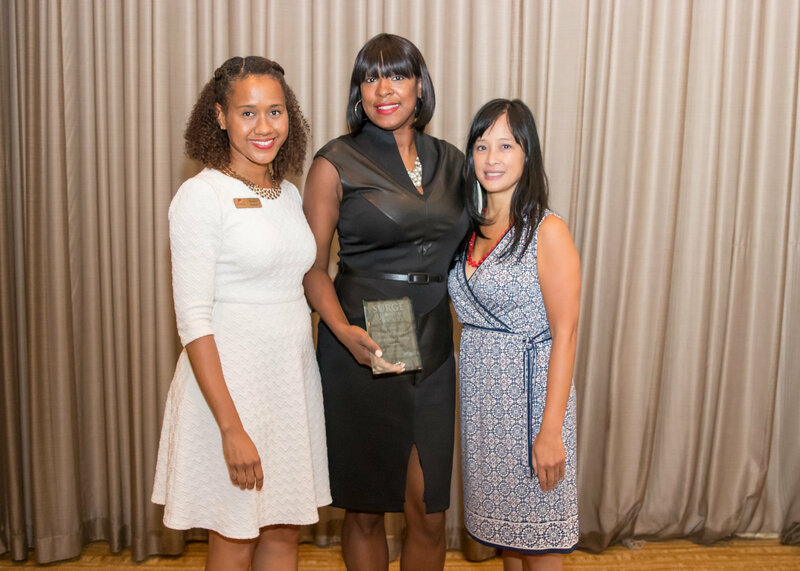 Chicago Public Schools CEO Janice K. Jackson Ed.D provided the keynote remarks, sharing the powerful story of her leadership journey. 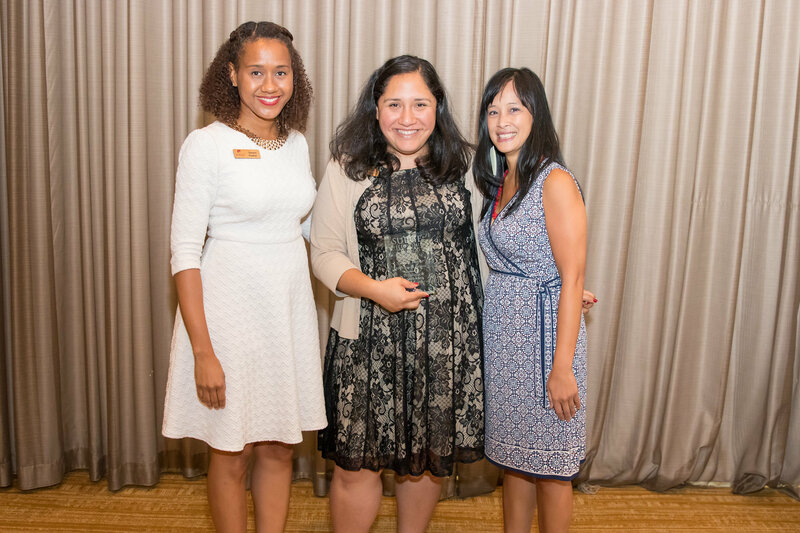 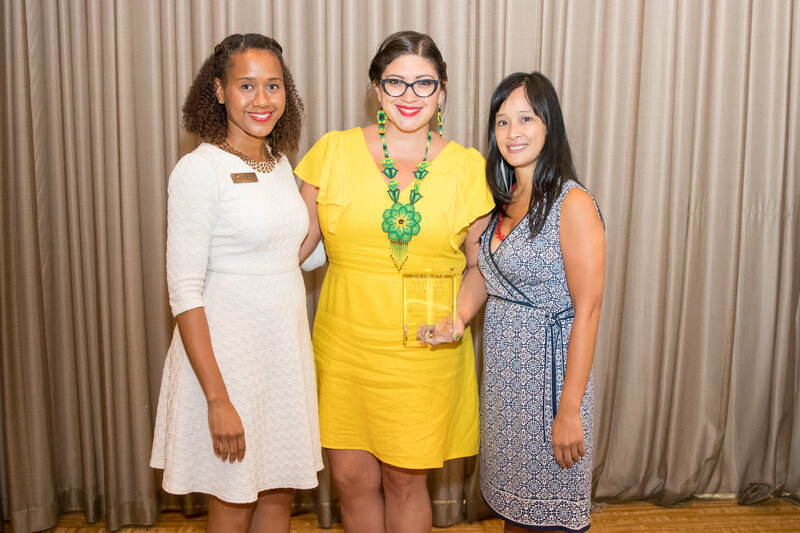 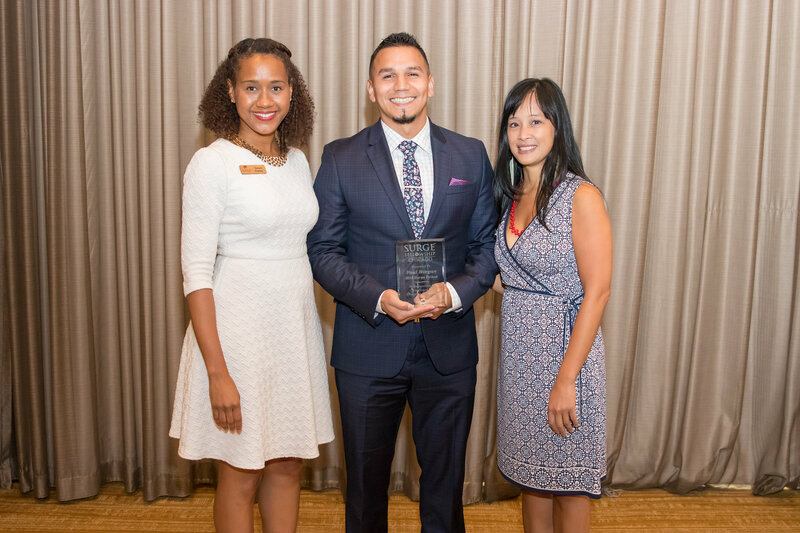 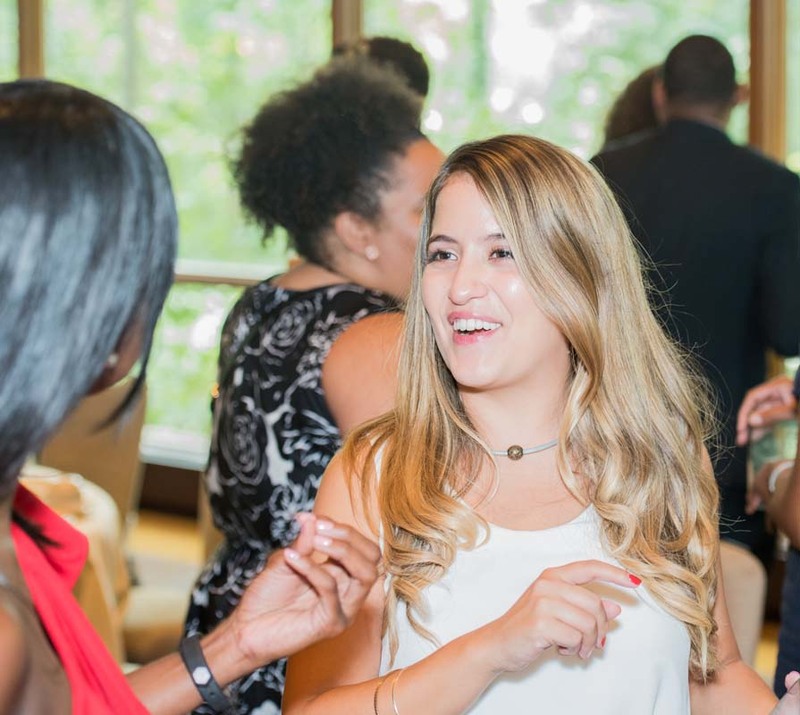 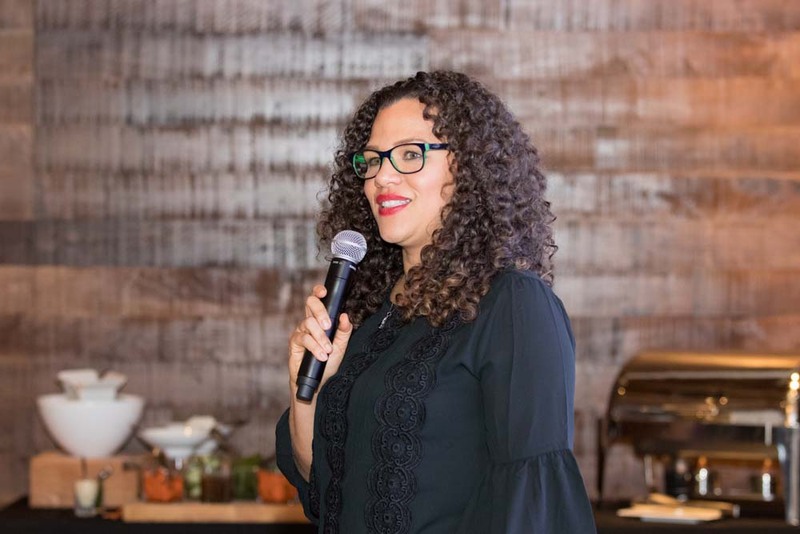 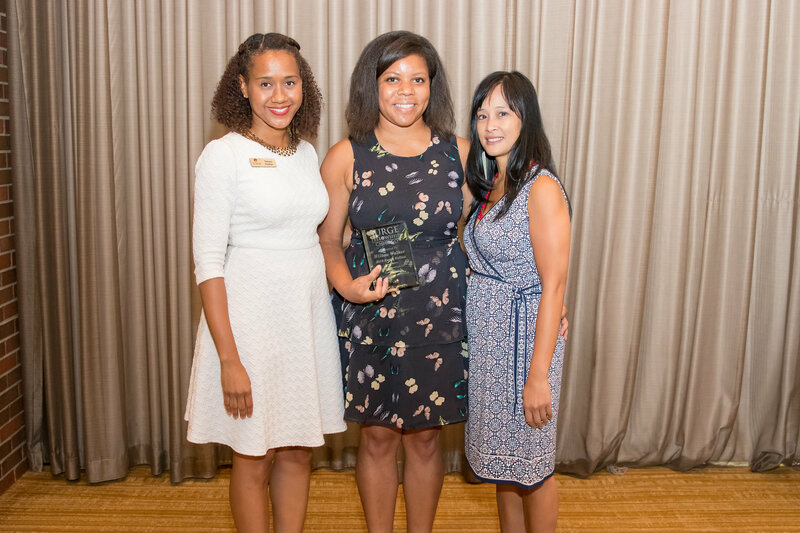 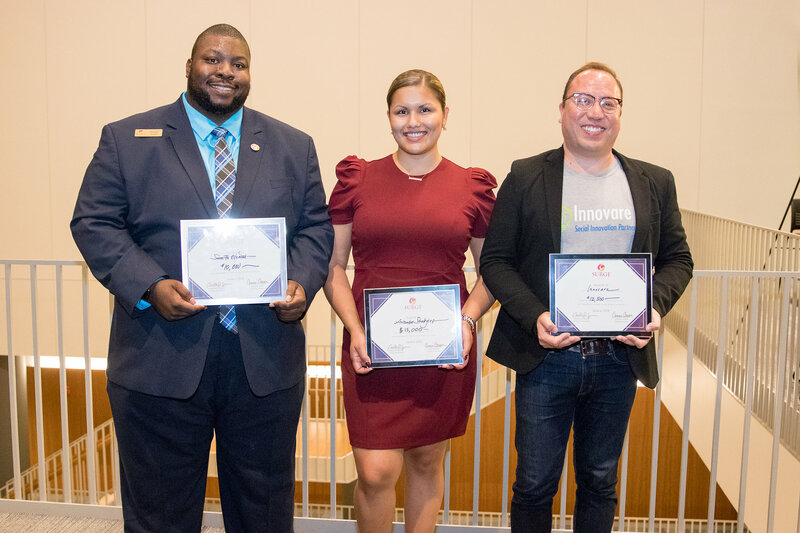 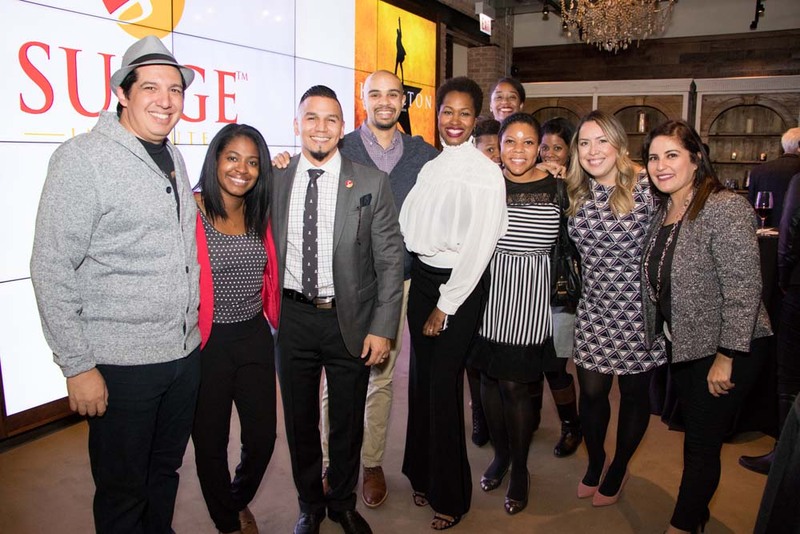 Following Jackson was 2018 Surge Fellow Erica Bauer, Director of Student Engagement at Walter Payton College Preparatory Academy, who was chosen by her fellow Ascendants to be the voice of the graduating cohort at the ceremony. 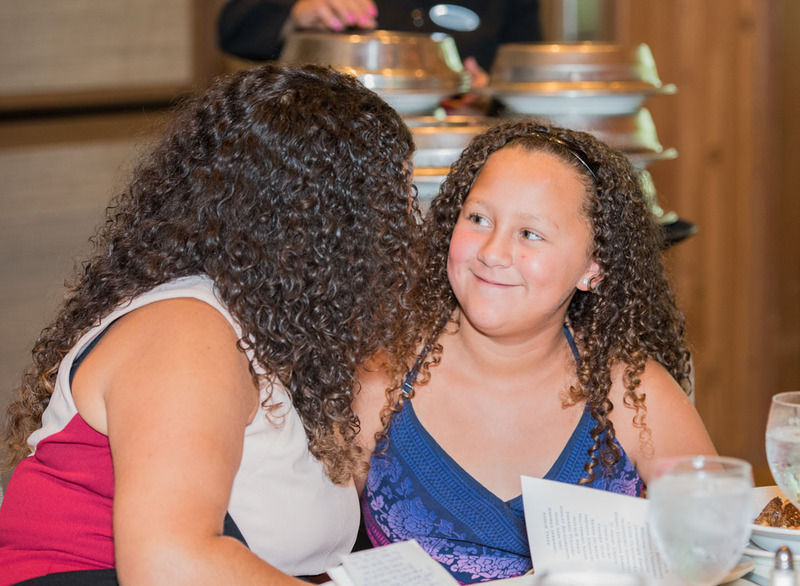 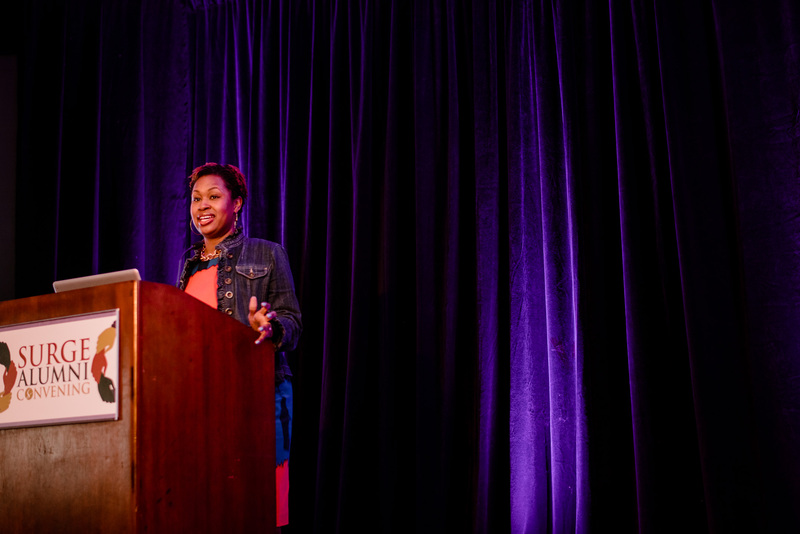 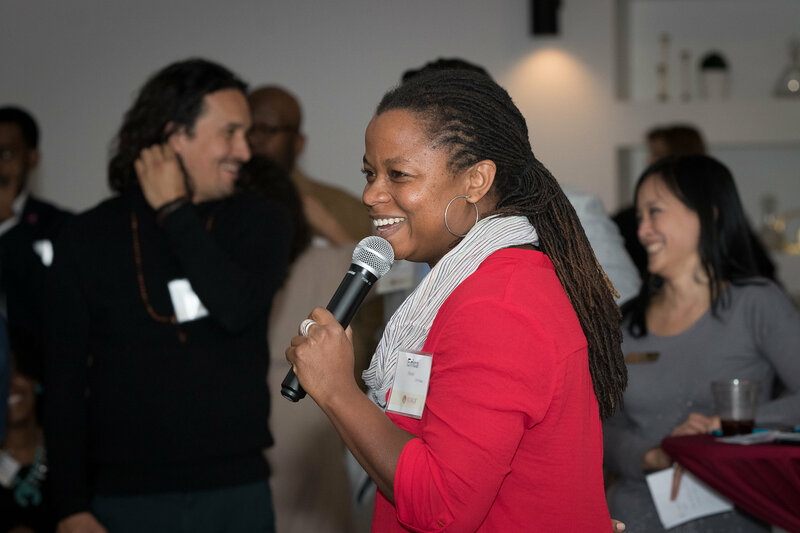 Erica was vulnerable, honest and deeply thoughtful about the importance of her role in the lives of youth of color. 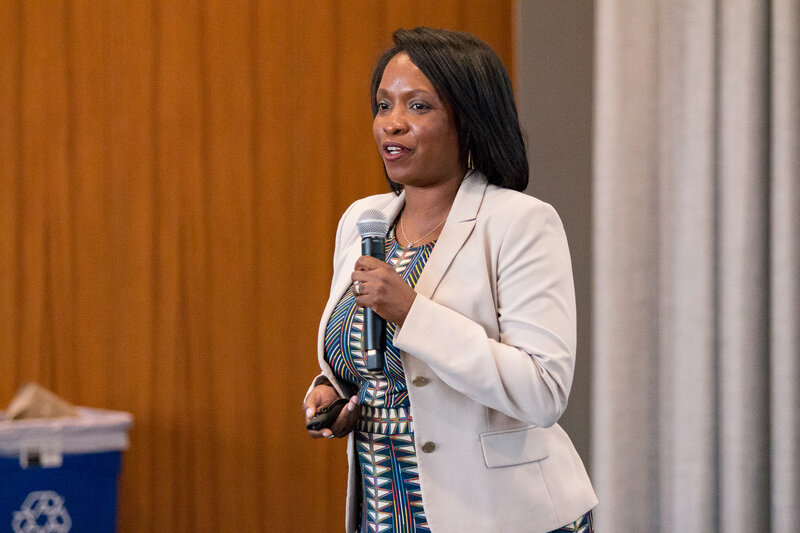 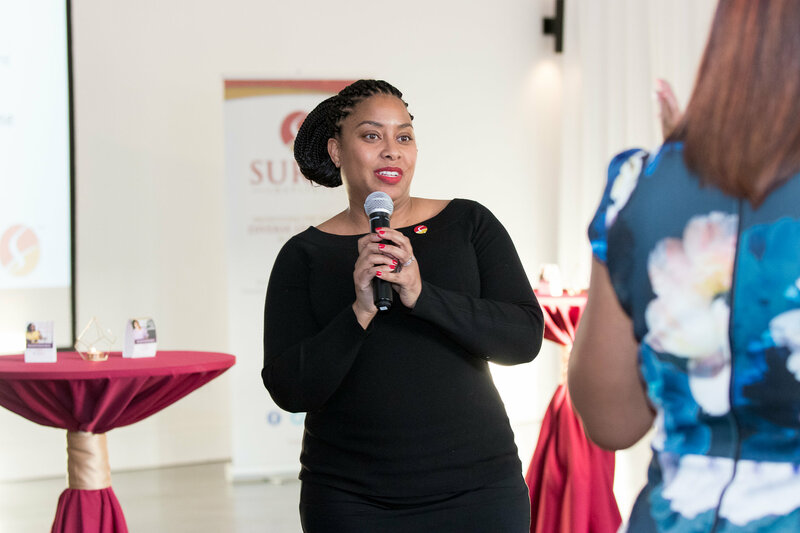 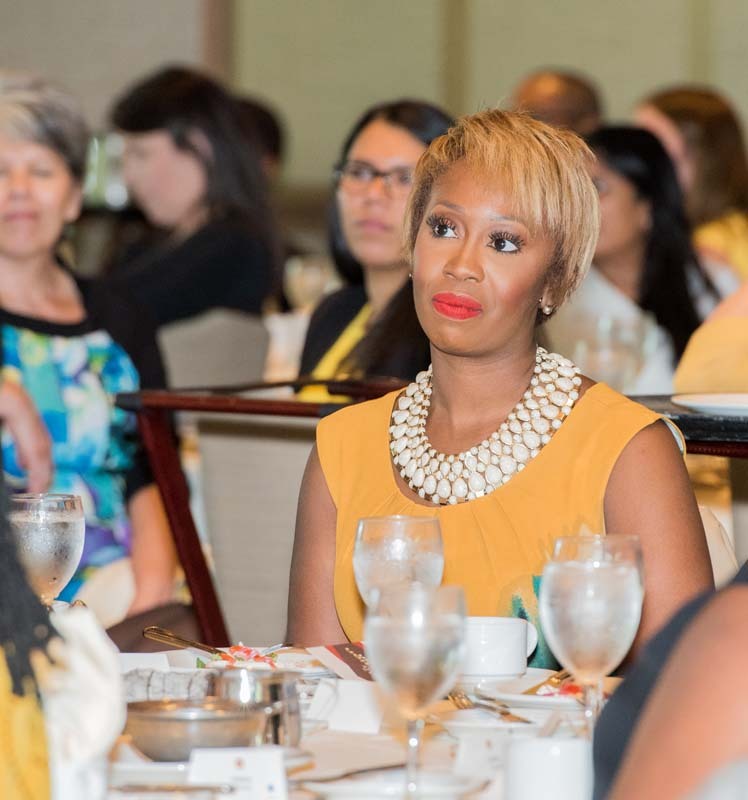 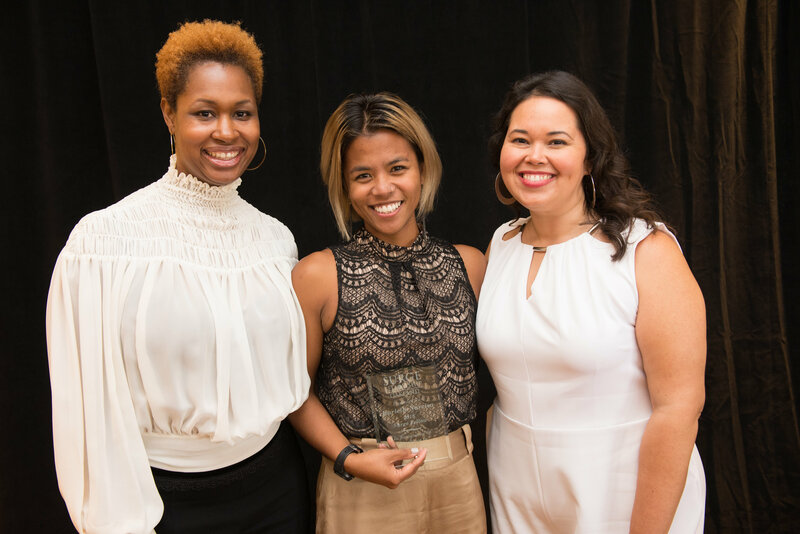 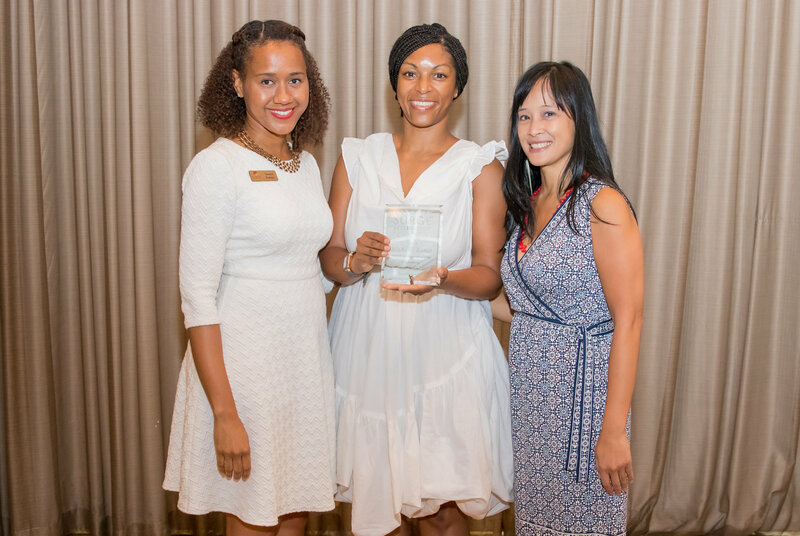 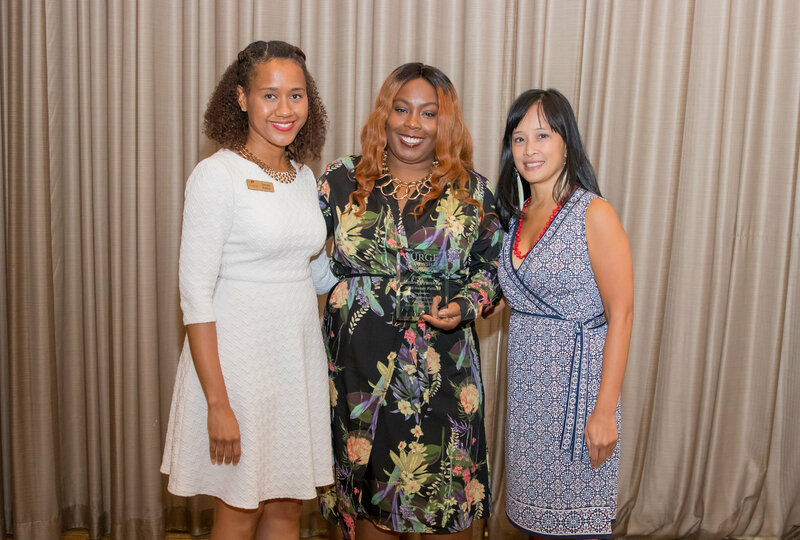 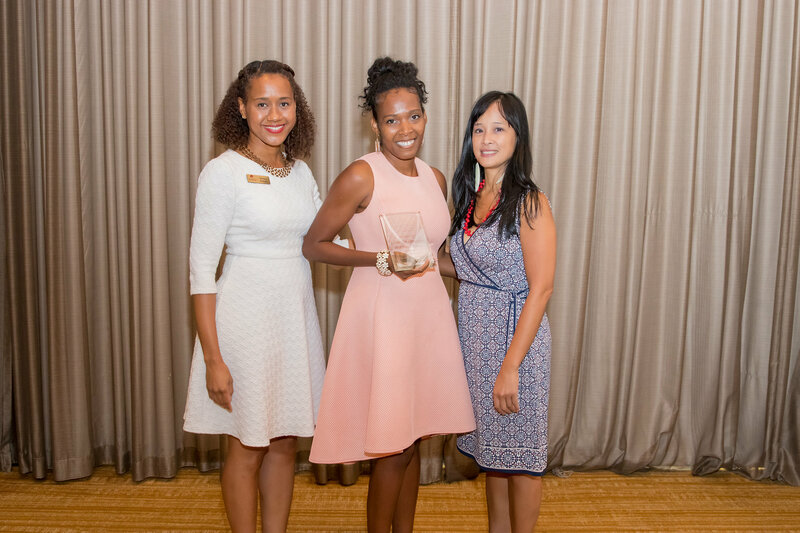 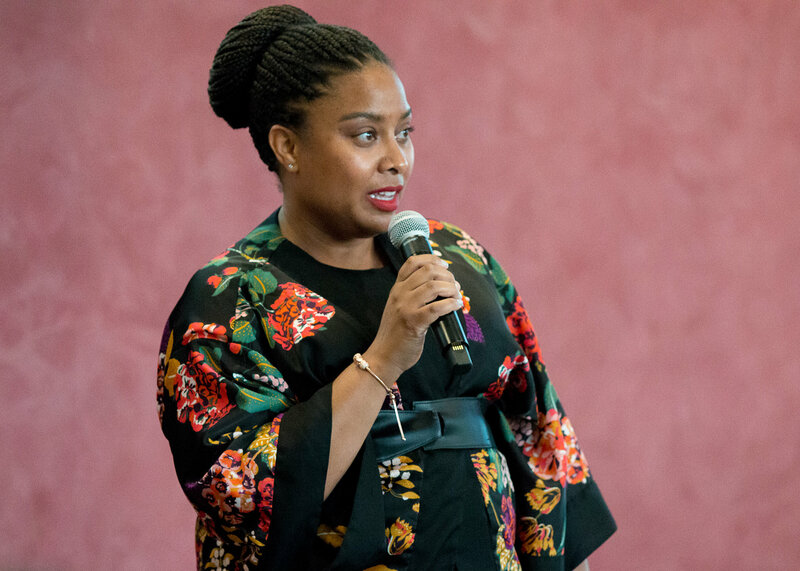 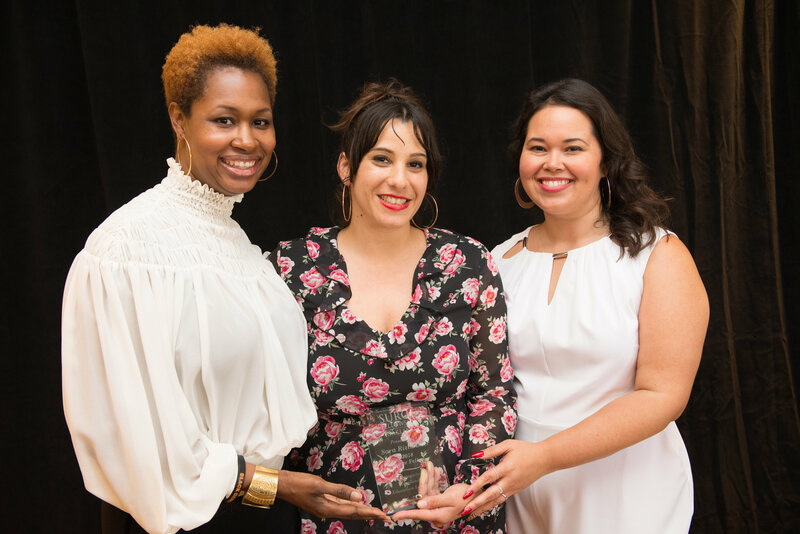 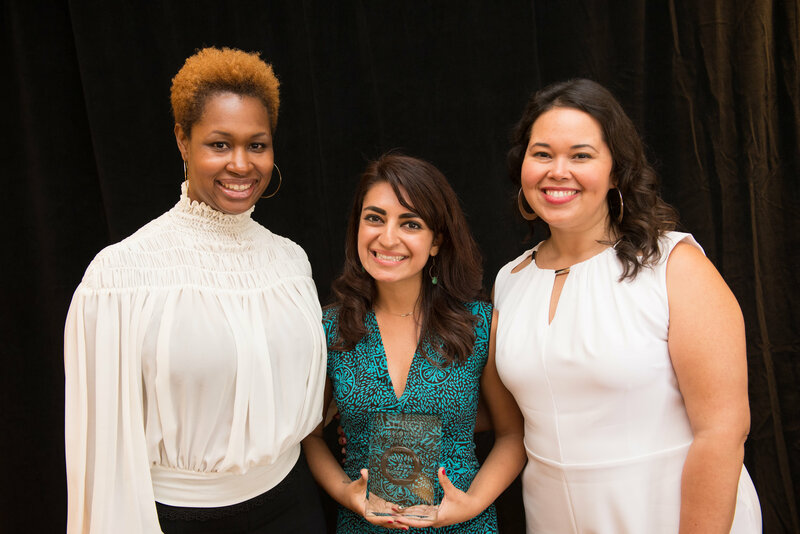 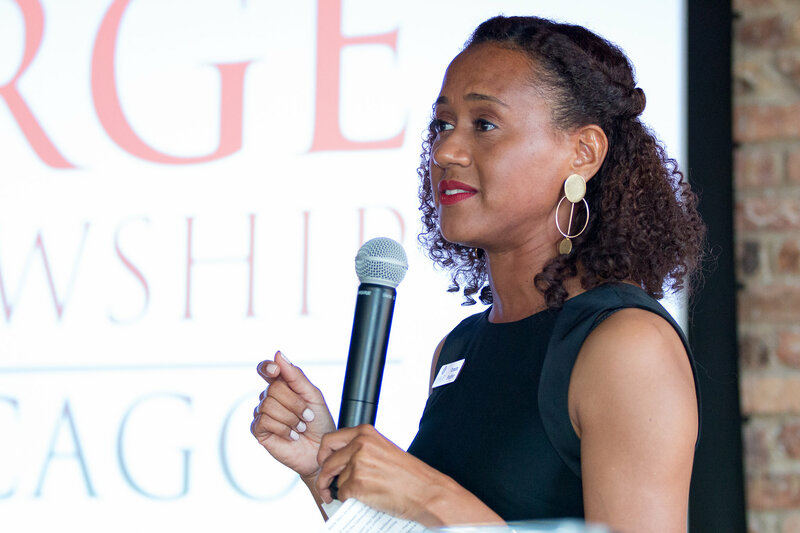 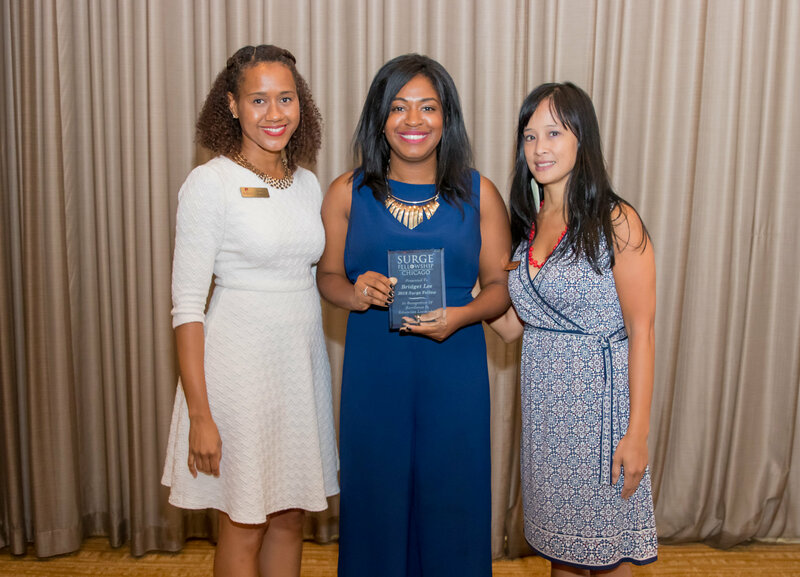 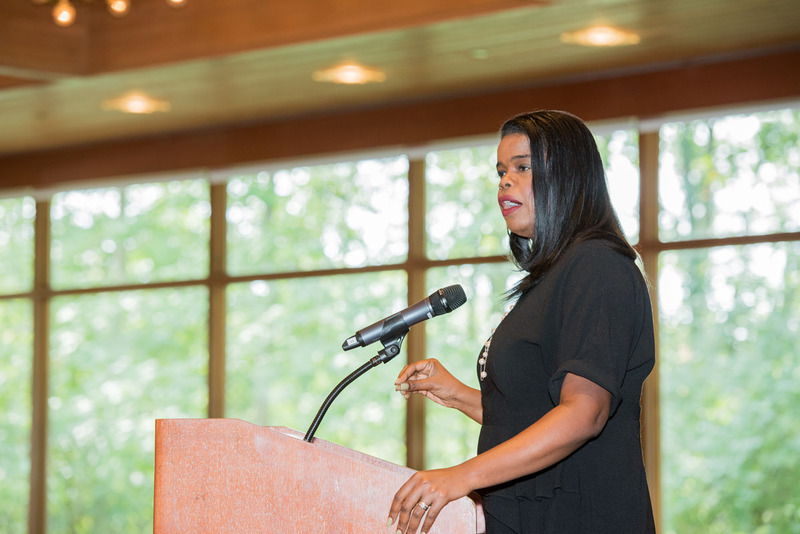 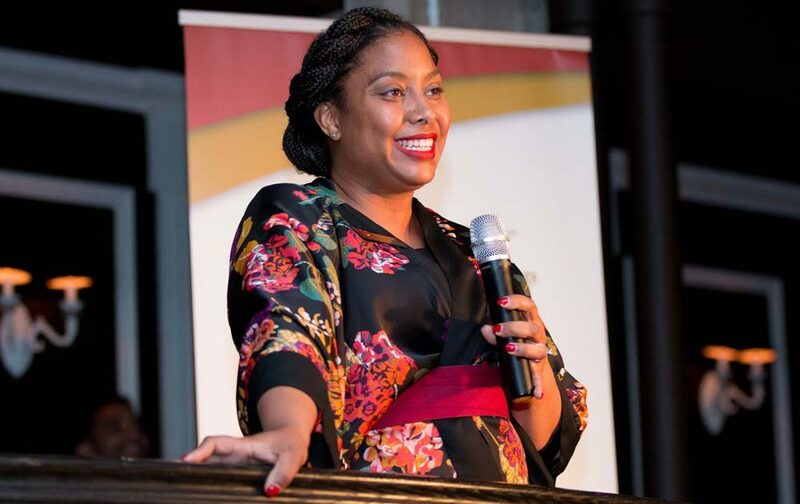 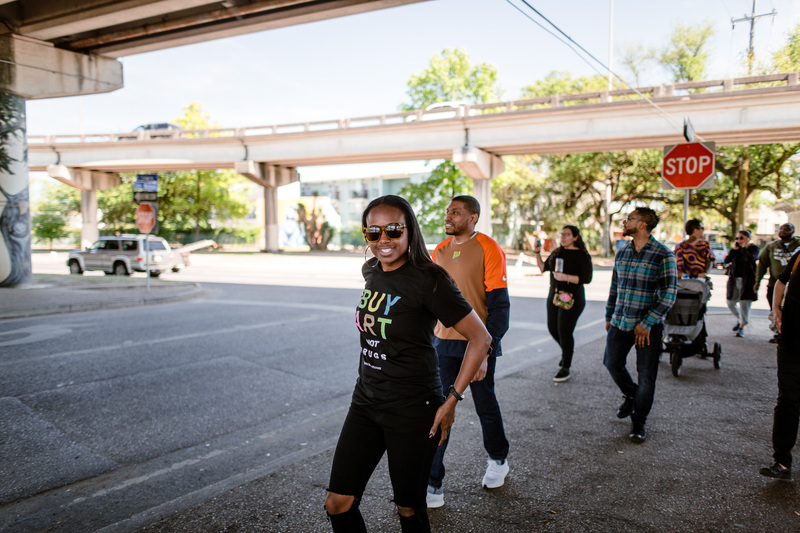 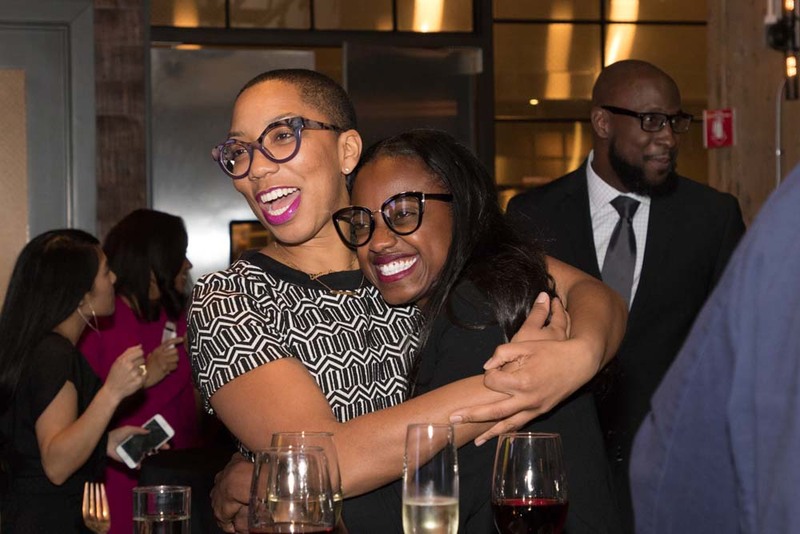 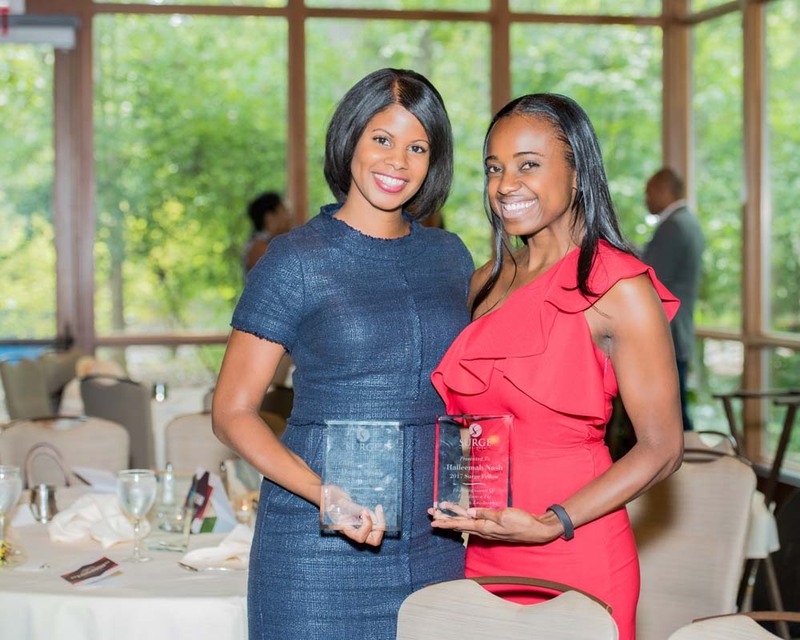 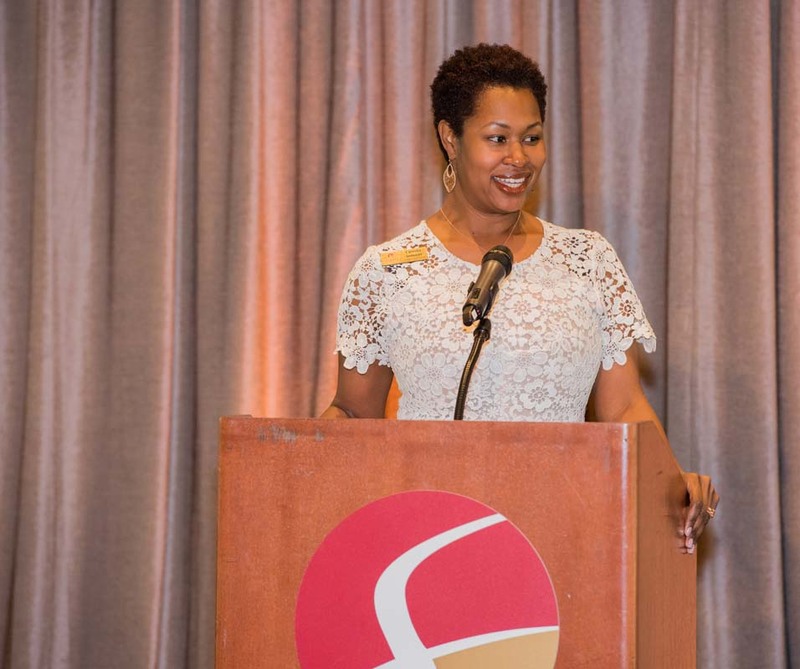 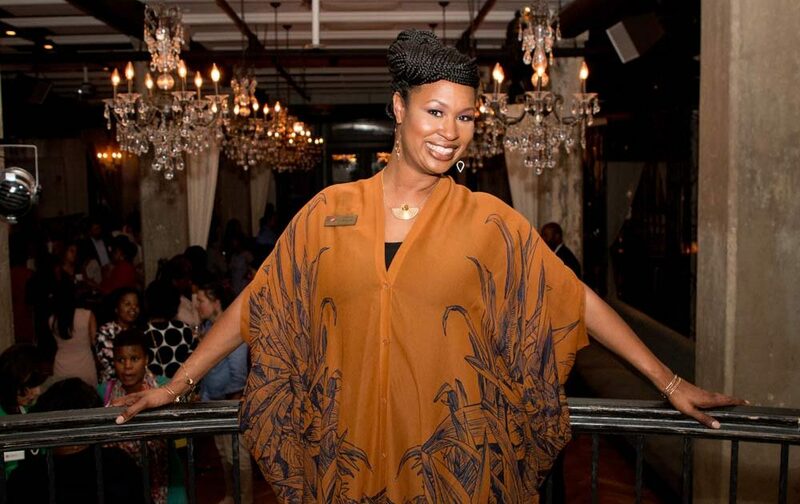 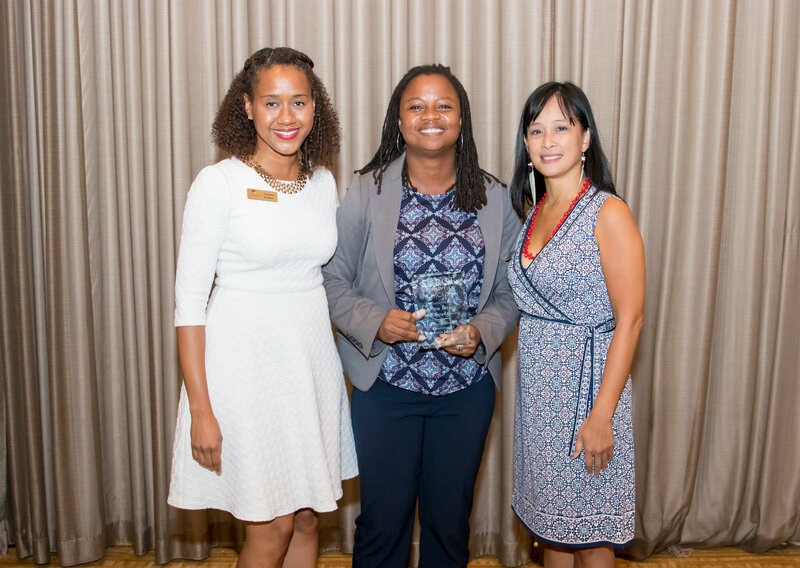 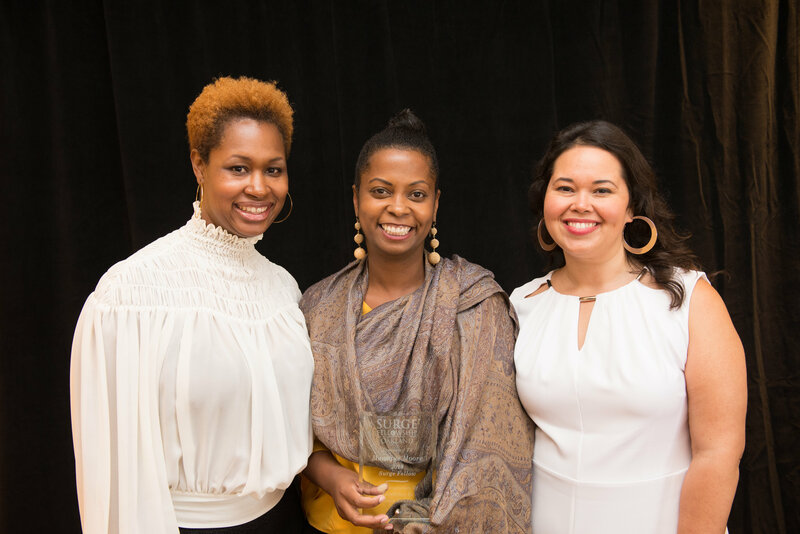 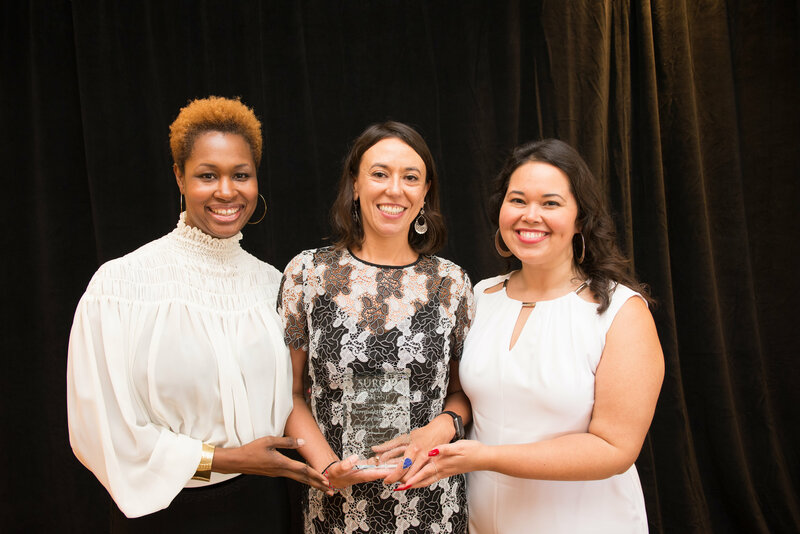 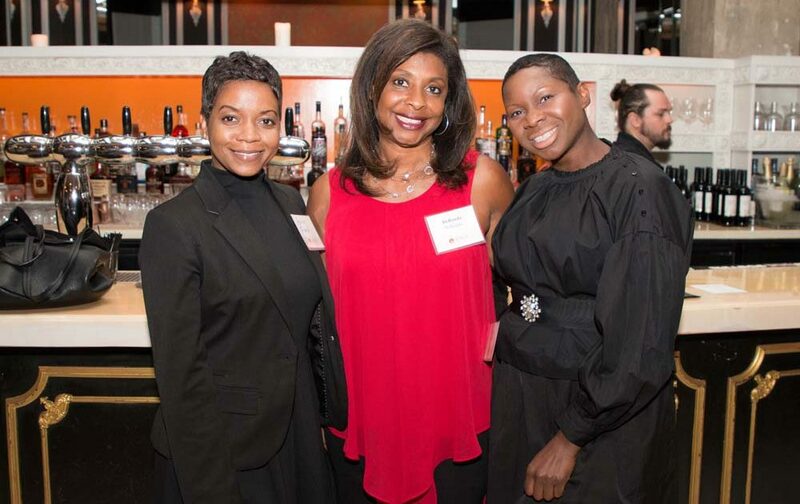 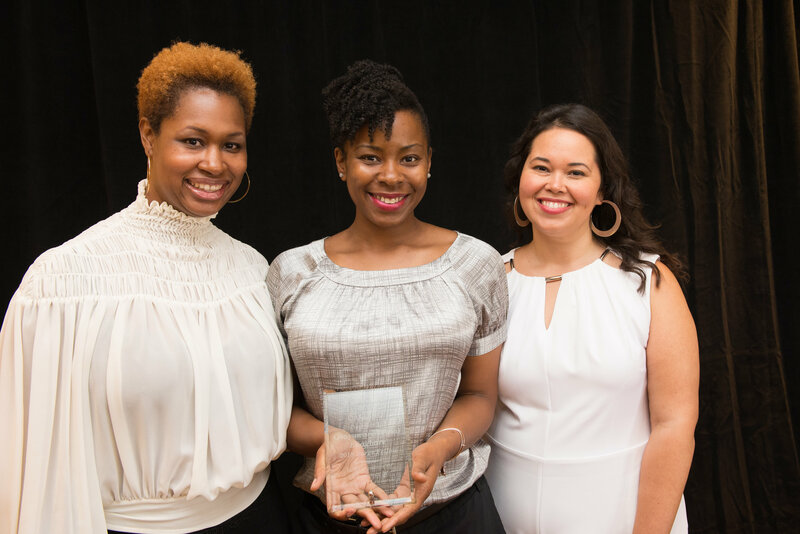 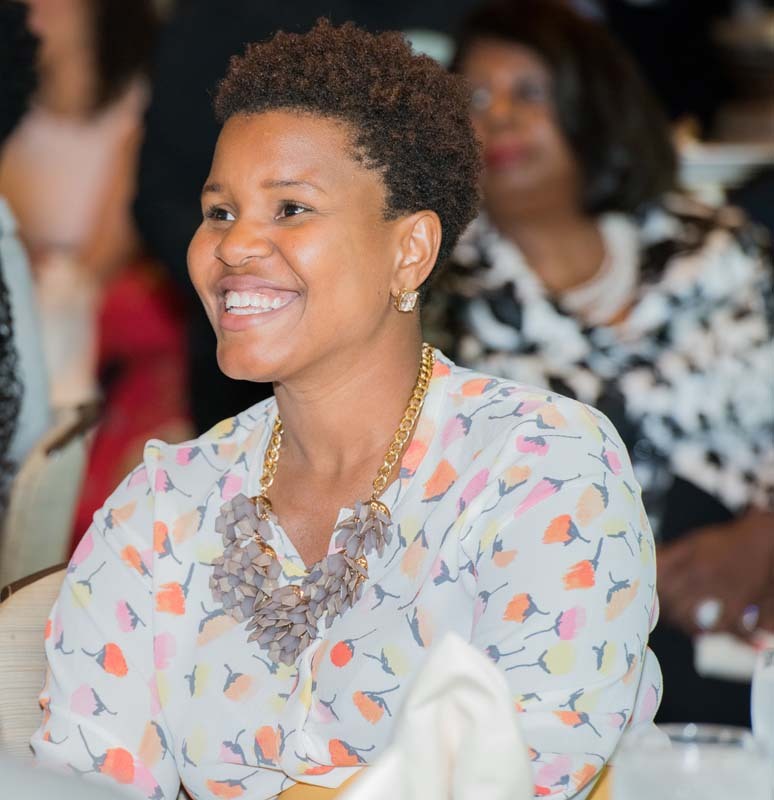 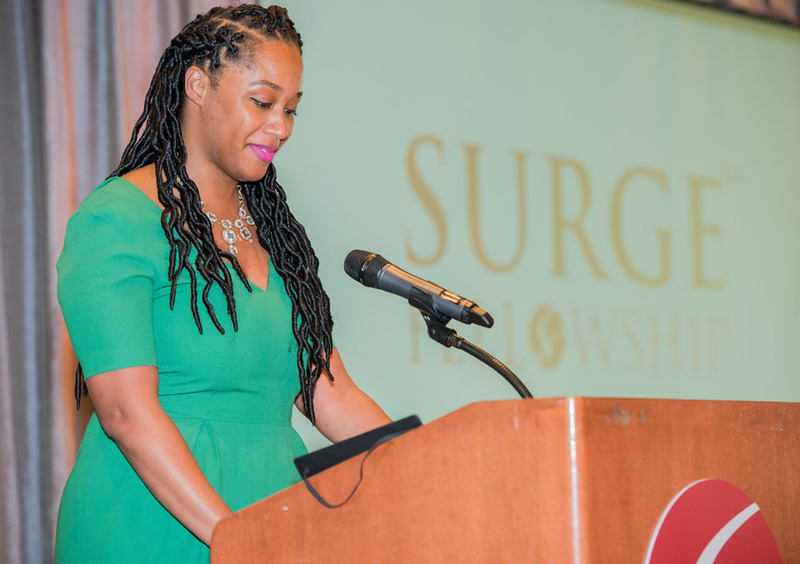 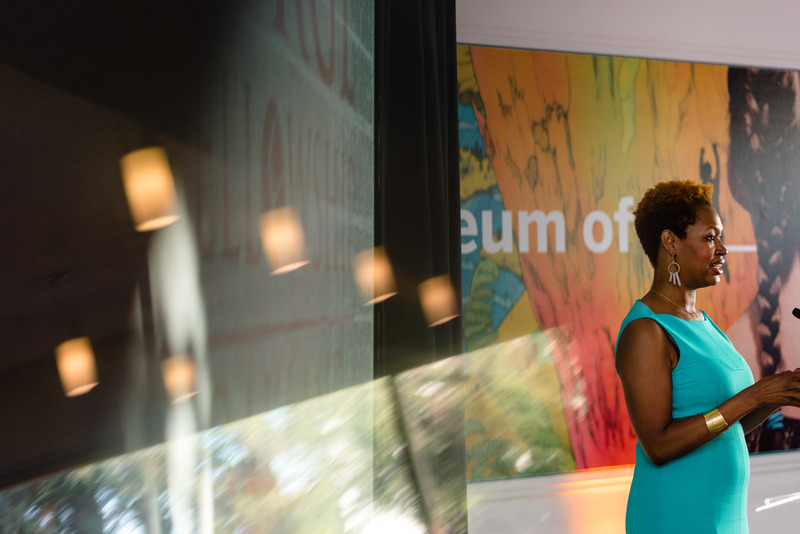 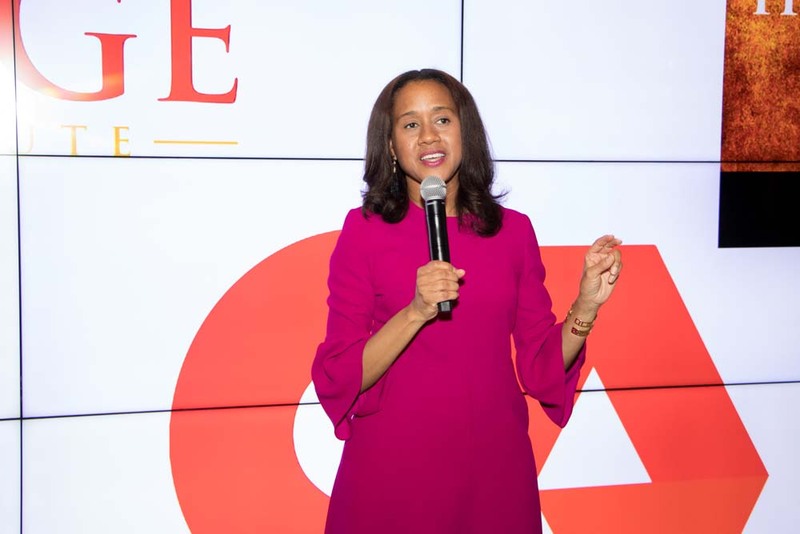 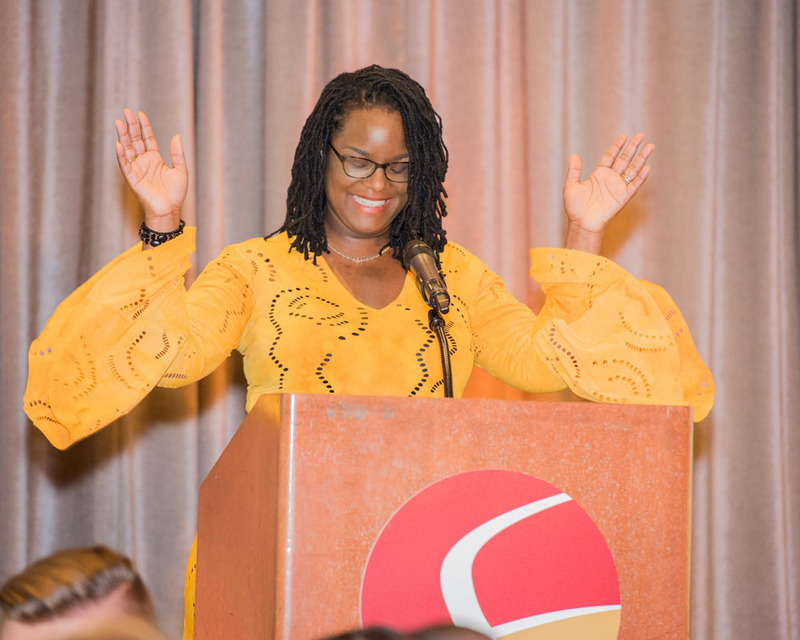 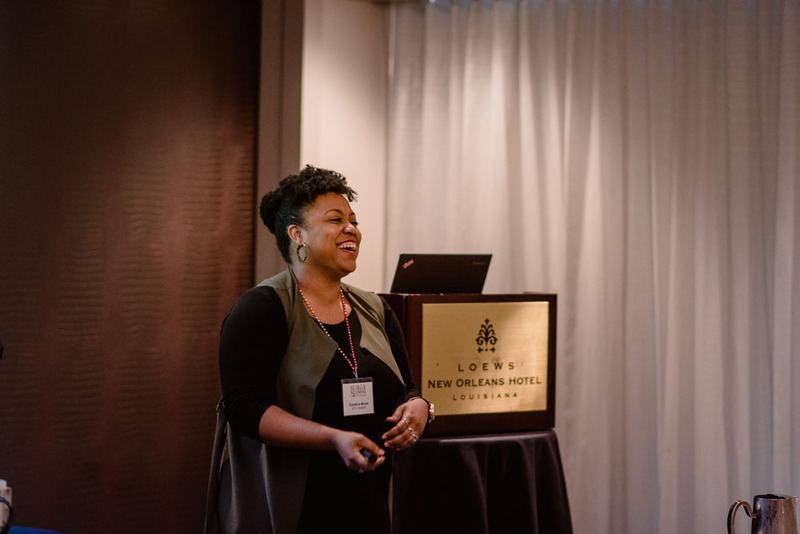 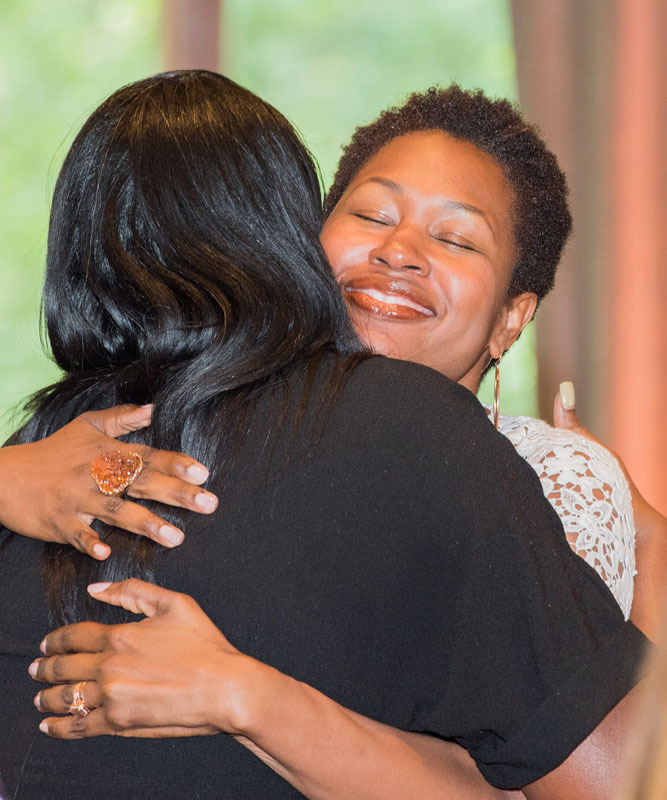 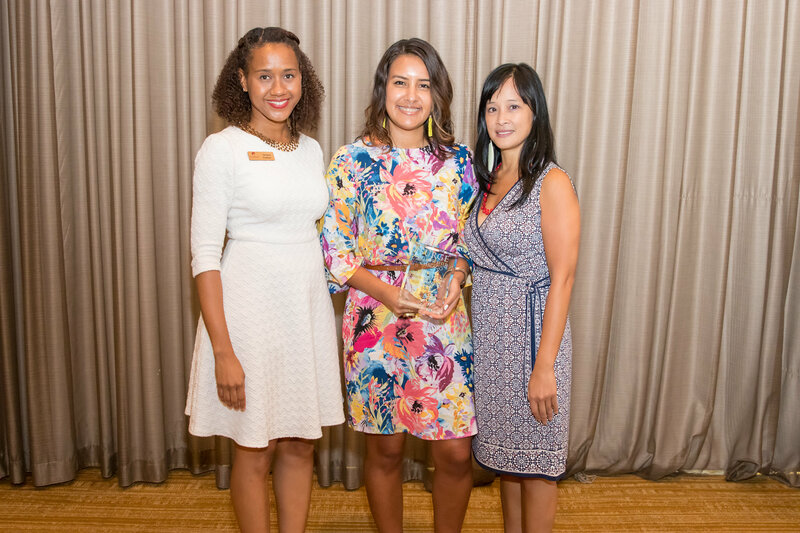 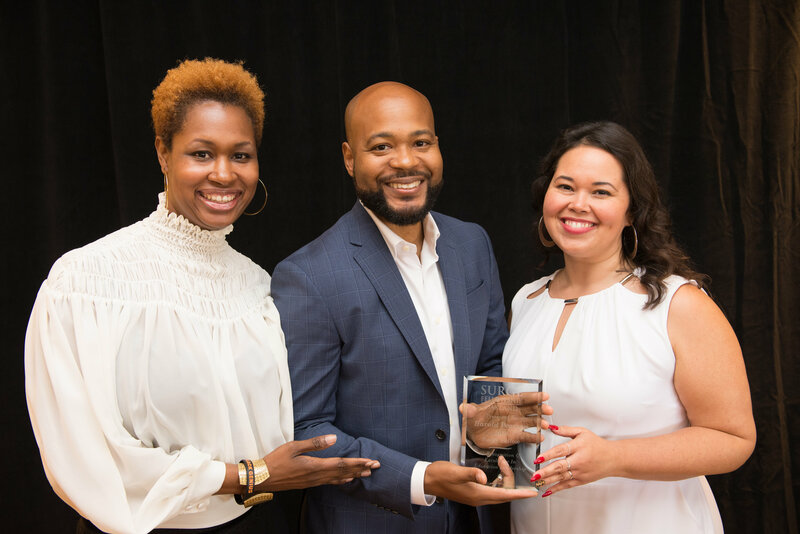 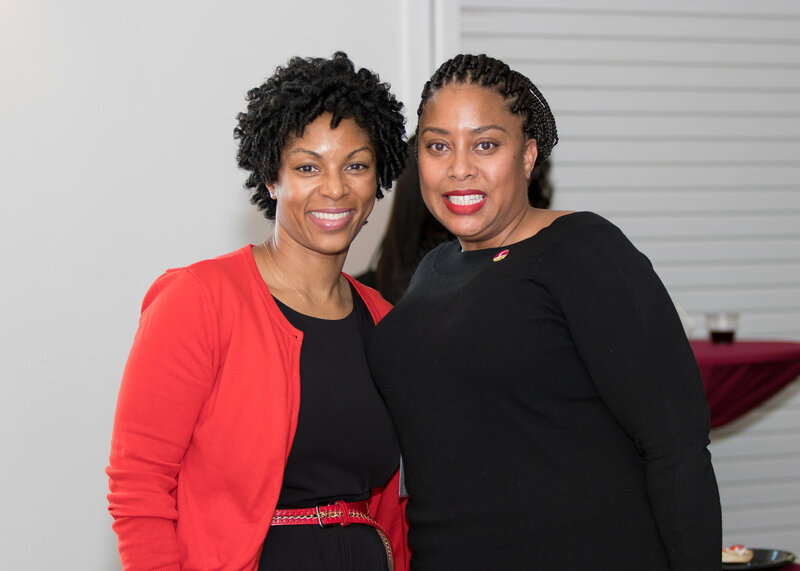 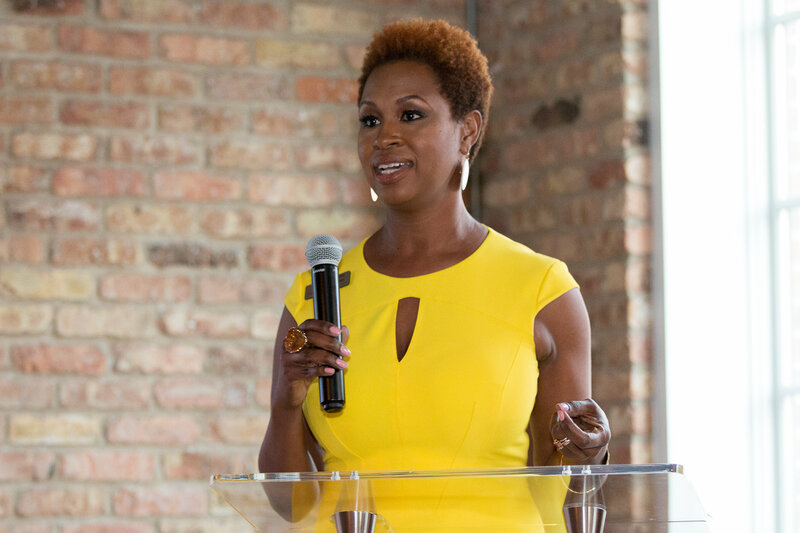 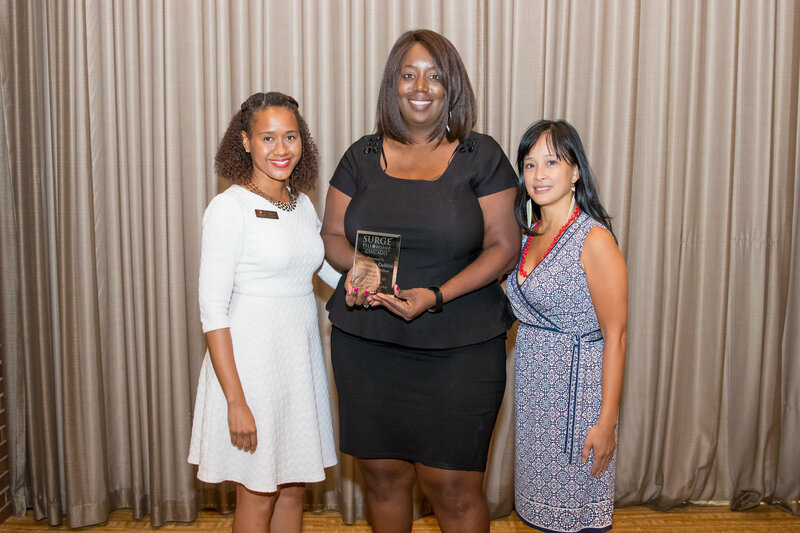 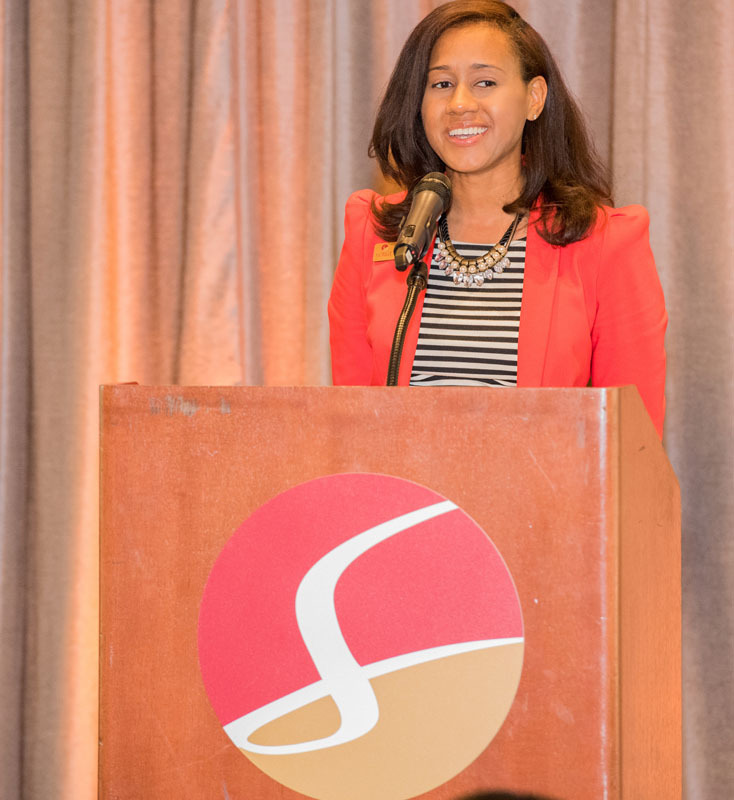 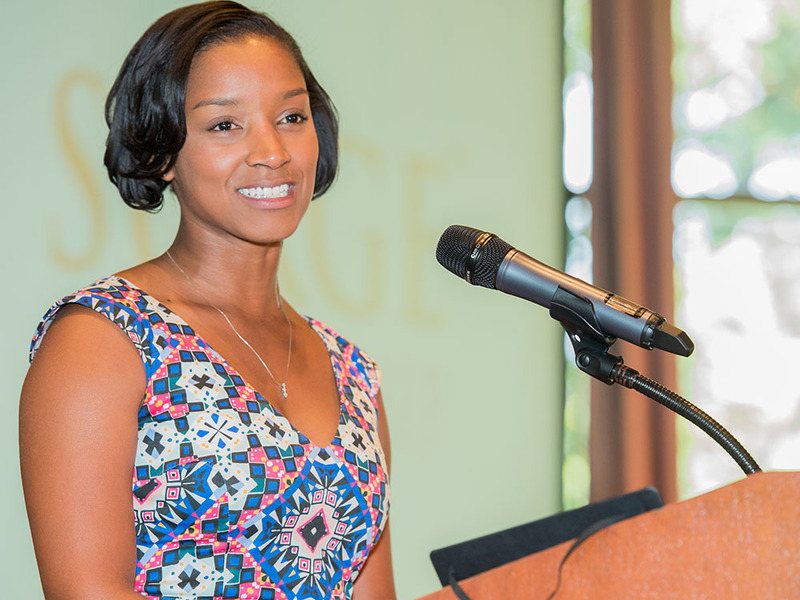 Providing a charge to the Ascendants was 2017 Surge Alumna Halleemah Nash, Chief Partnerships Officer at The Academy Group, who pushed the graduates to continue giving back to the movement that connected and further developed them as leaders. 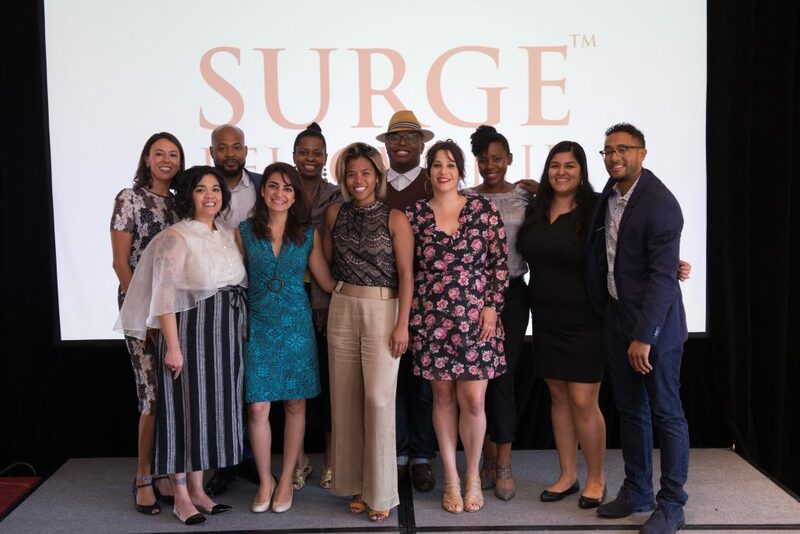 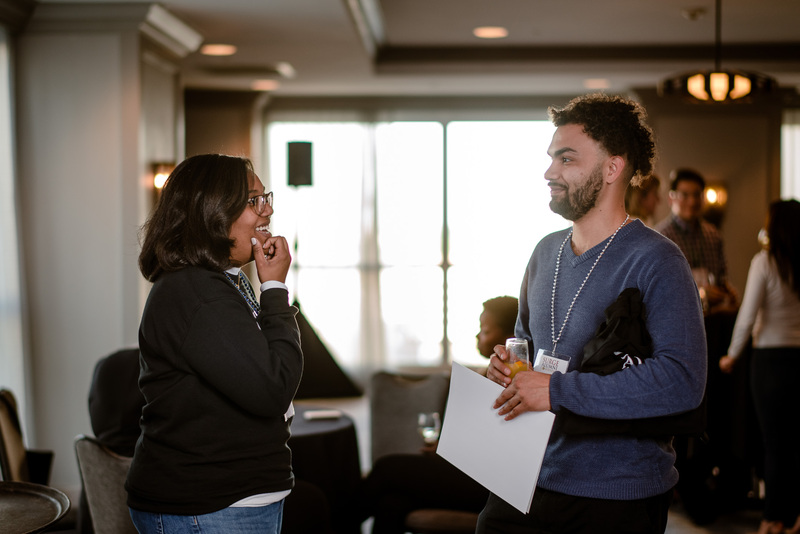 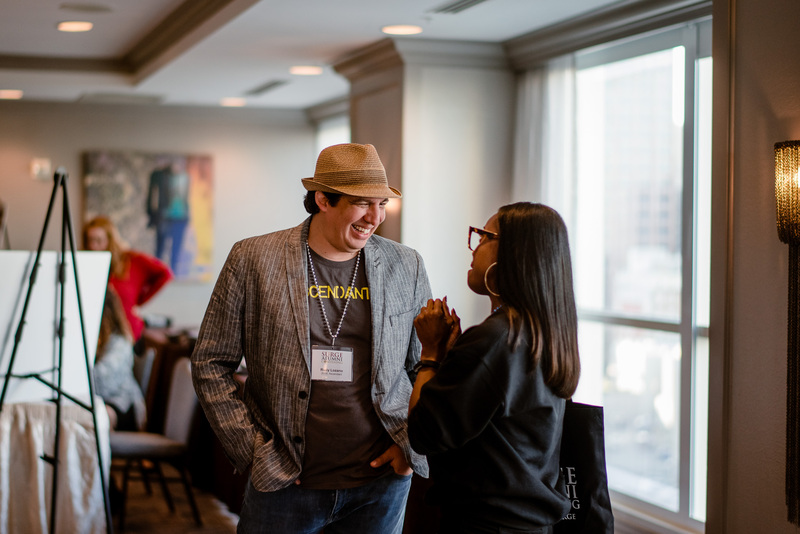 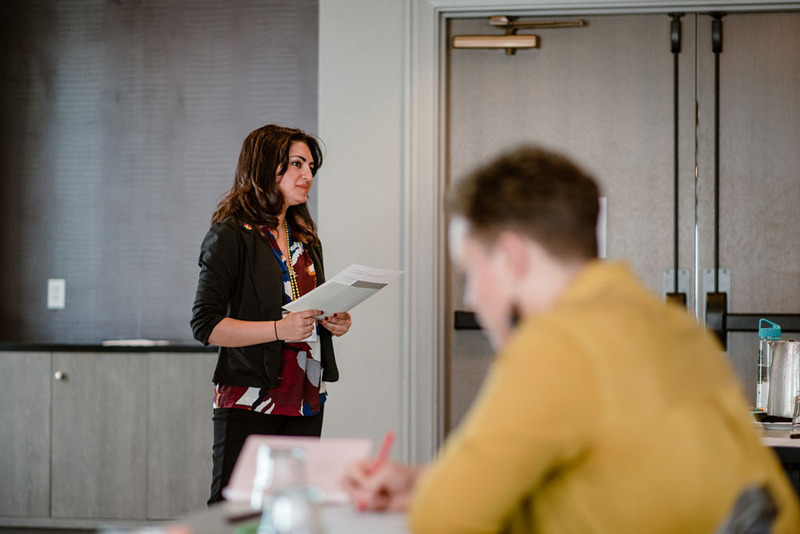 On August 25, 2018, the inaugural Oakland Surge Fellowship cohort, the Alchemists, continued the moment with a moving graduation ceremony on the top floor of the Oakland Marriott. 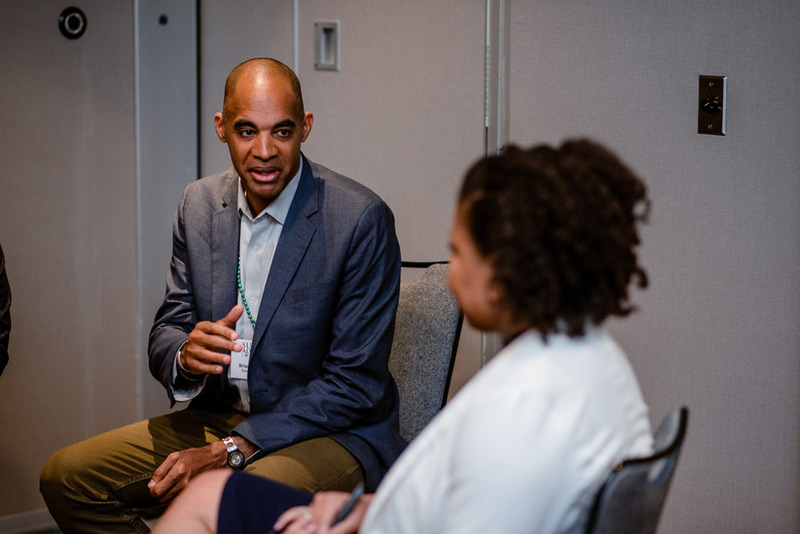 Jim Shelton, Former Deputy Secretary of Education and President of Education for the Chan Zuckerberg Initiative, provided the keynote remarks, sharing with the Alchemists the importance of the Surge movement and why he believes so deeply in the power of leaders of color. 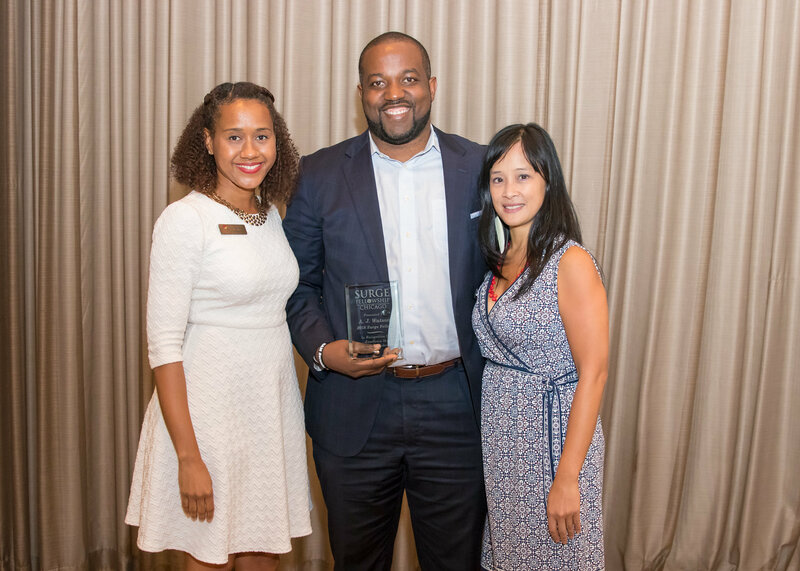 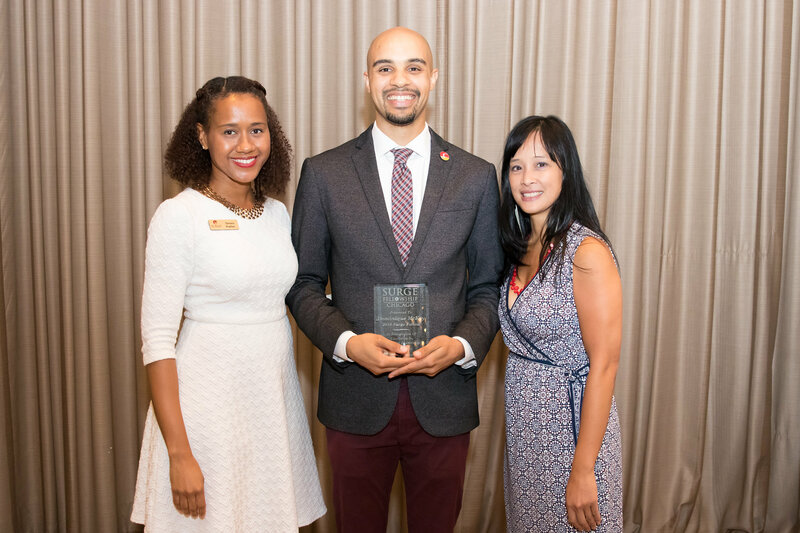 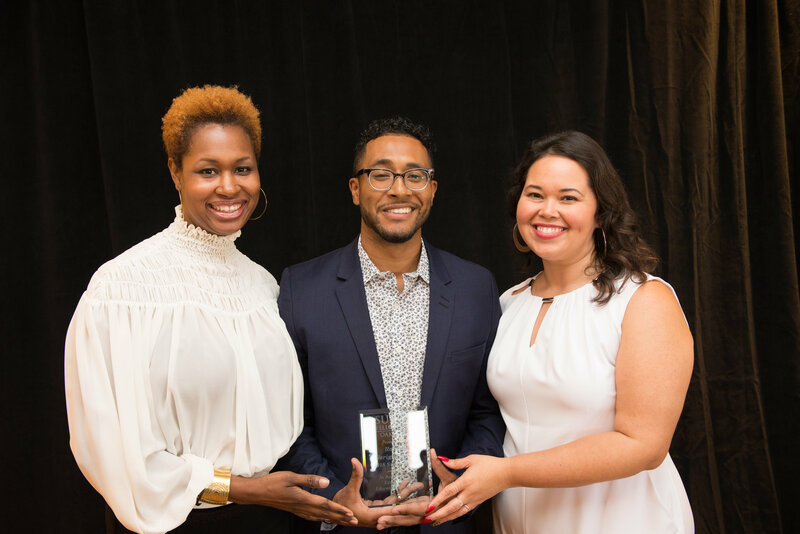 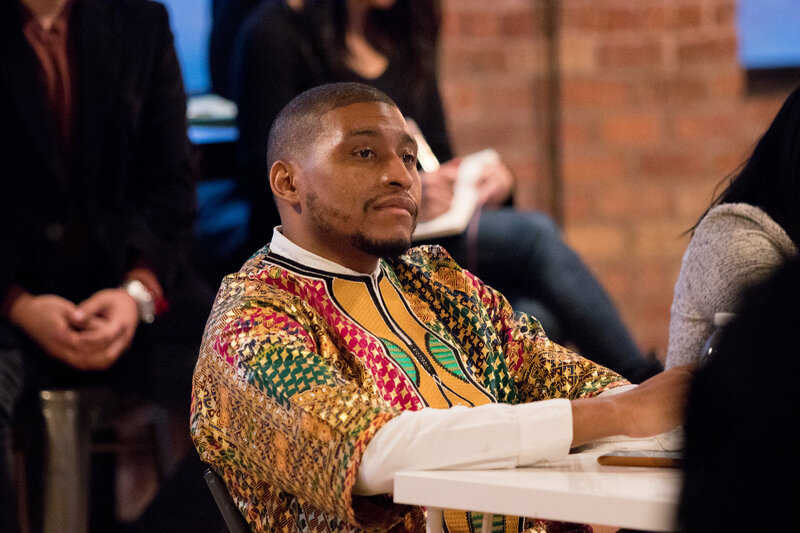 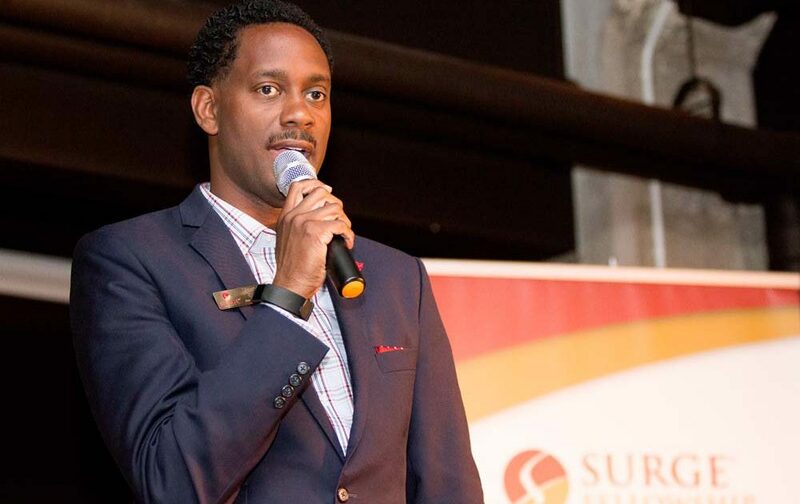 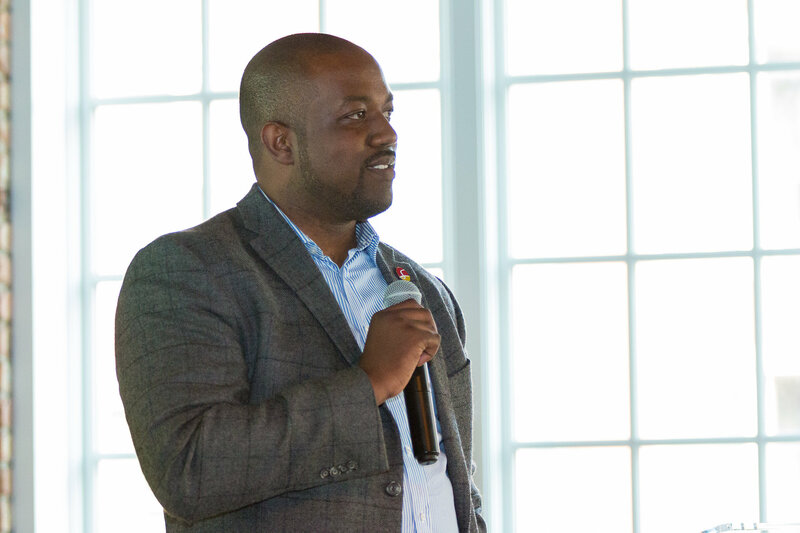 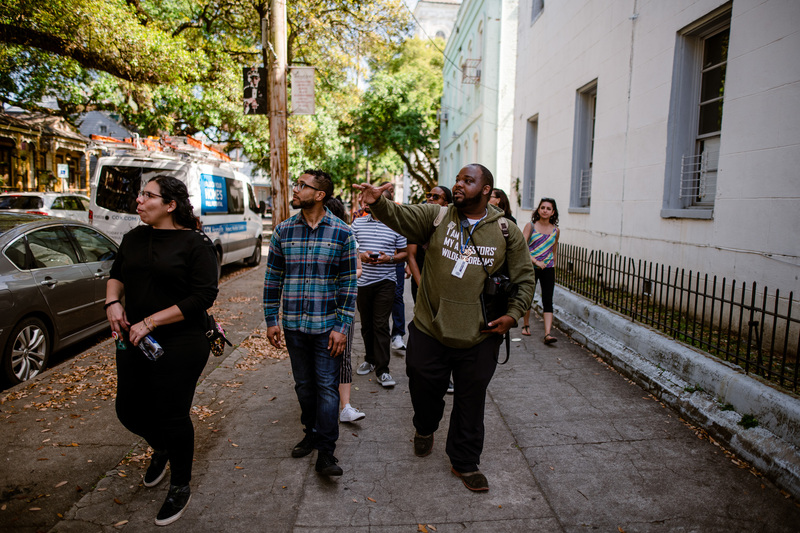 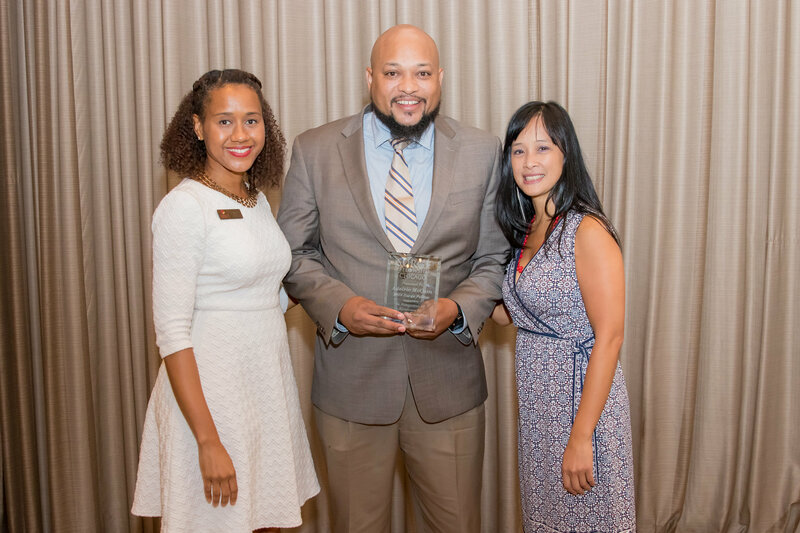 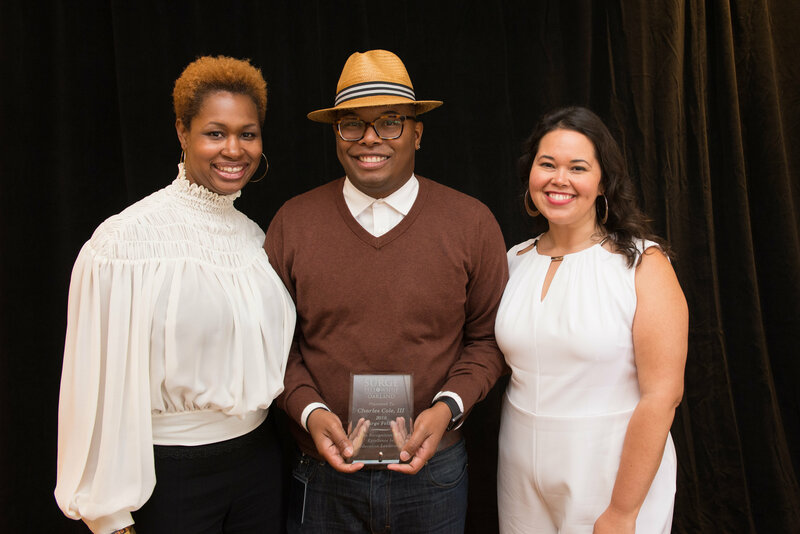 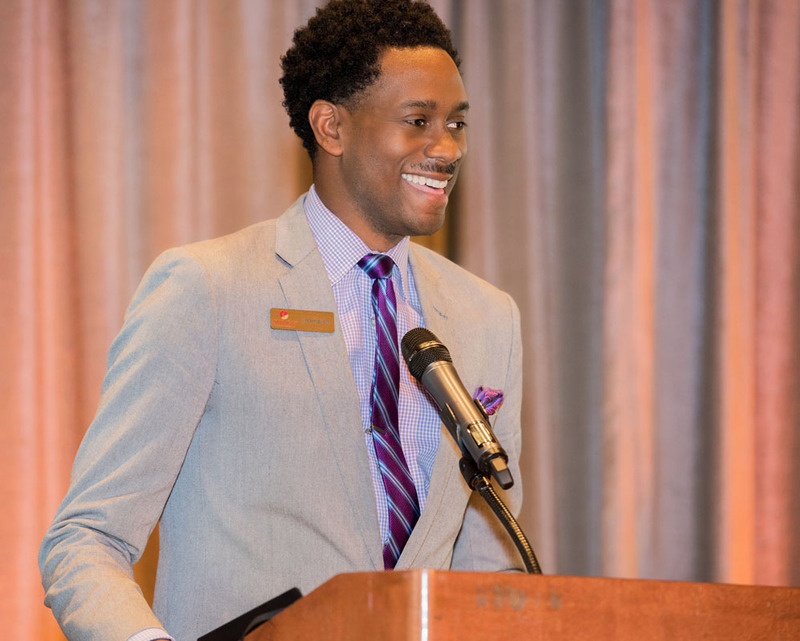 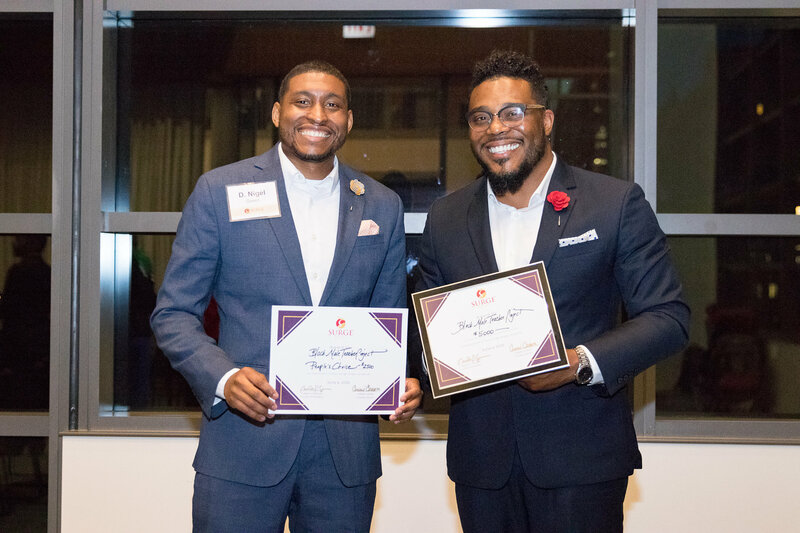 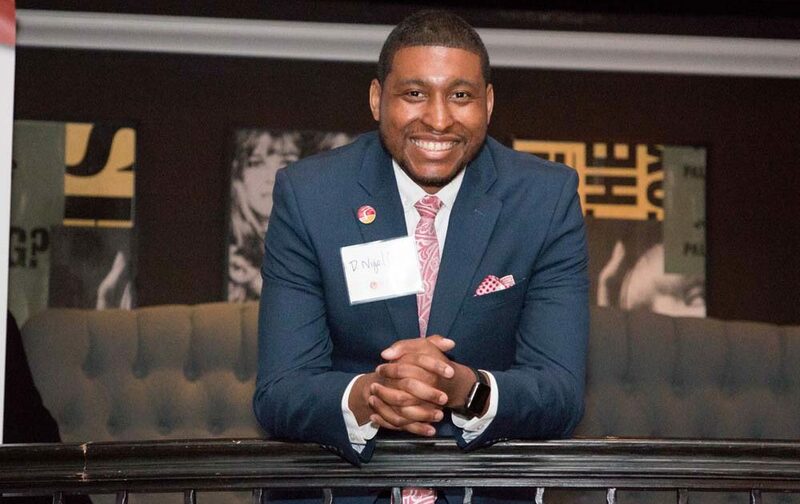 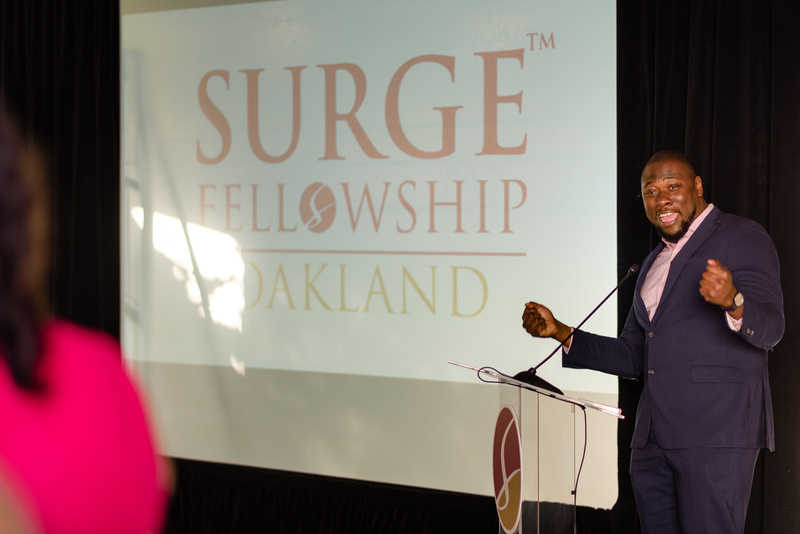 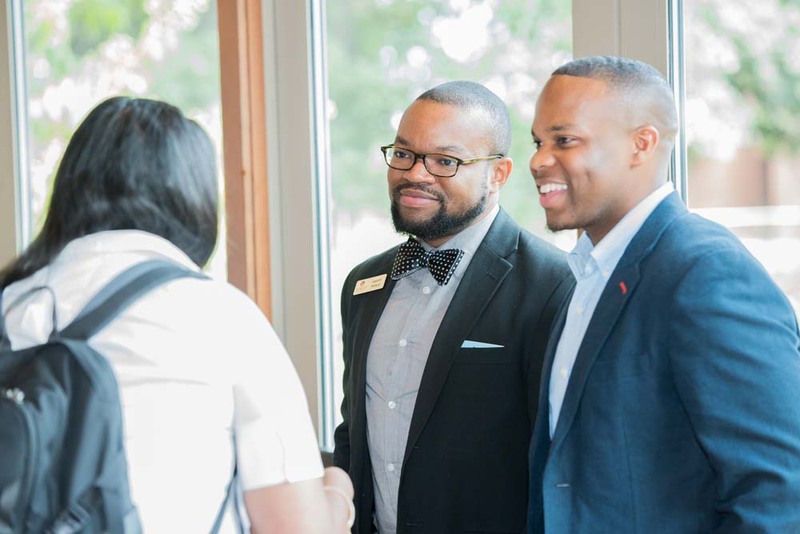 Providing a charge to his fellow Alchemists was 2018 Surge Fellow Harold Pearson, Executive Director of SPAAT, who spoke about the collective power of the Surge community. 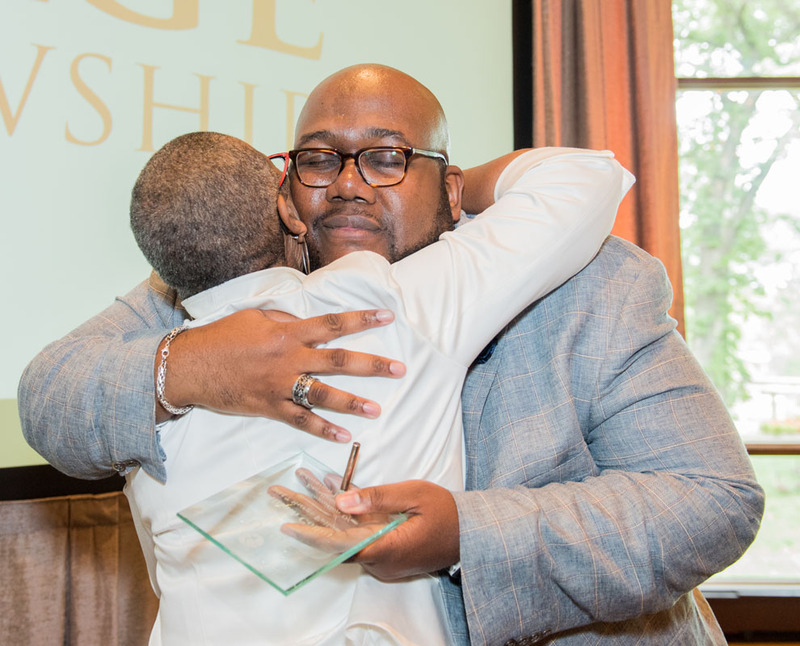 Harold was selected by the Oakland graduating cohort to be the voice of the Alchemists during the ceremony. 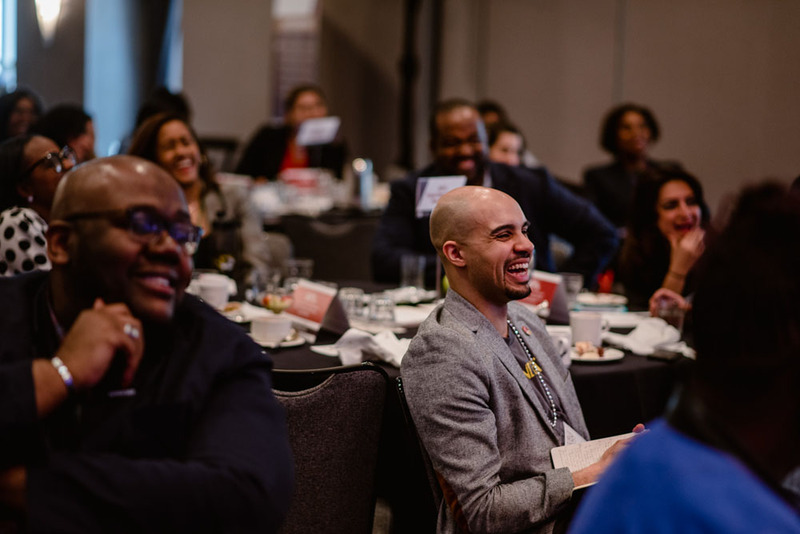 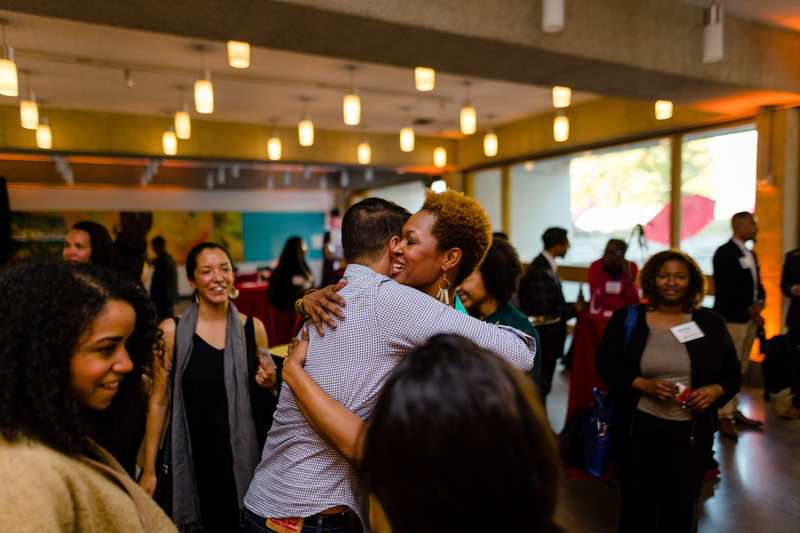 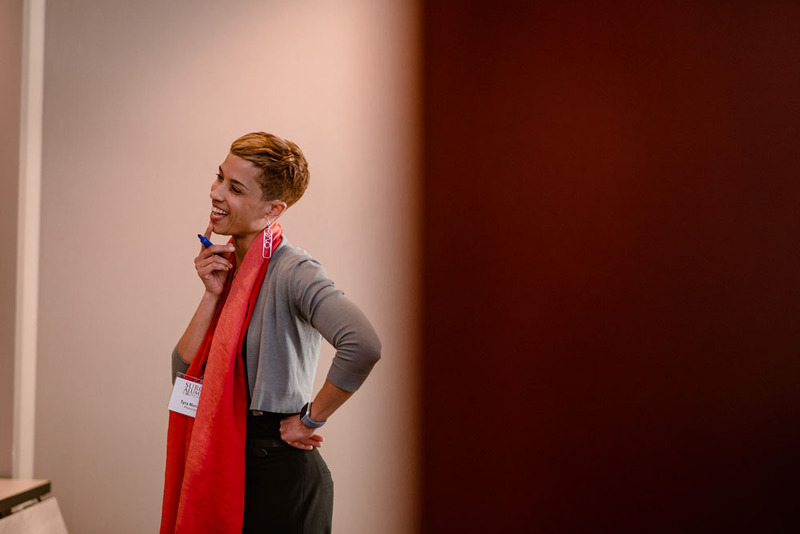 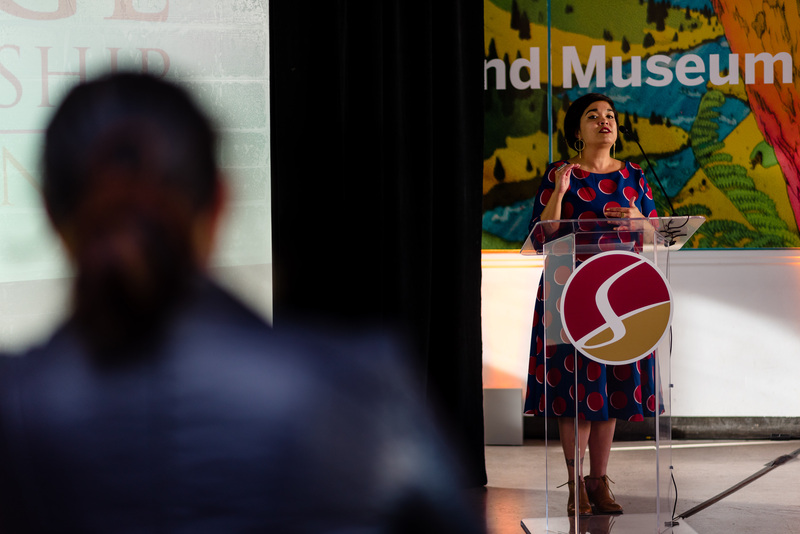 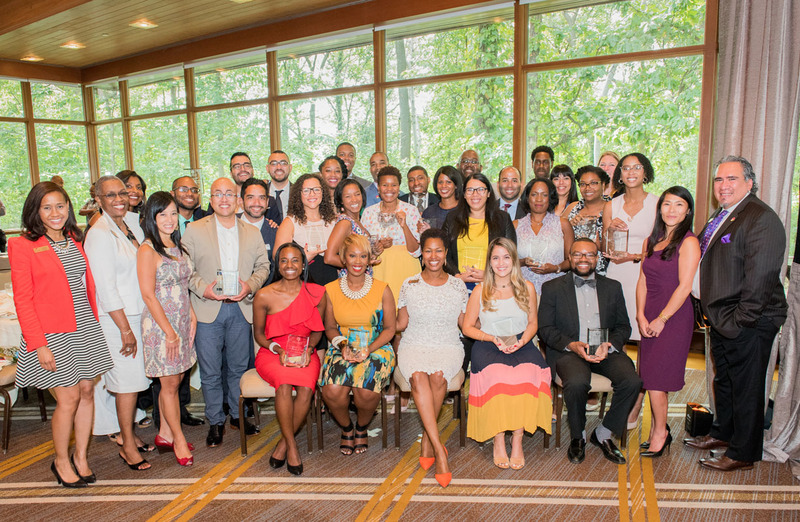 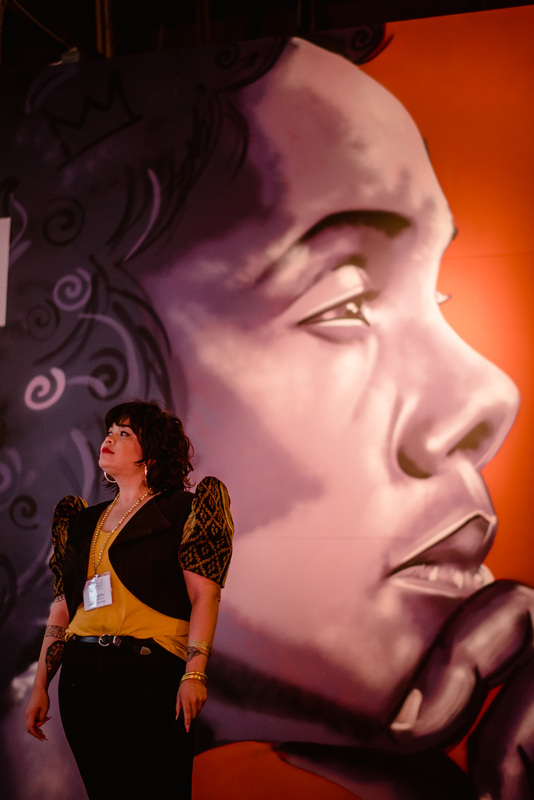 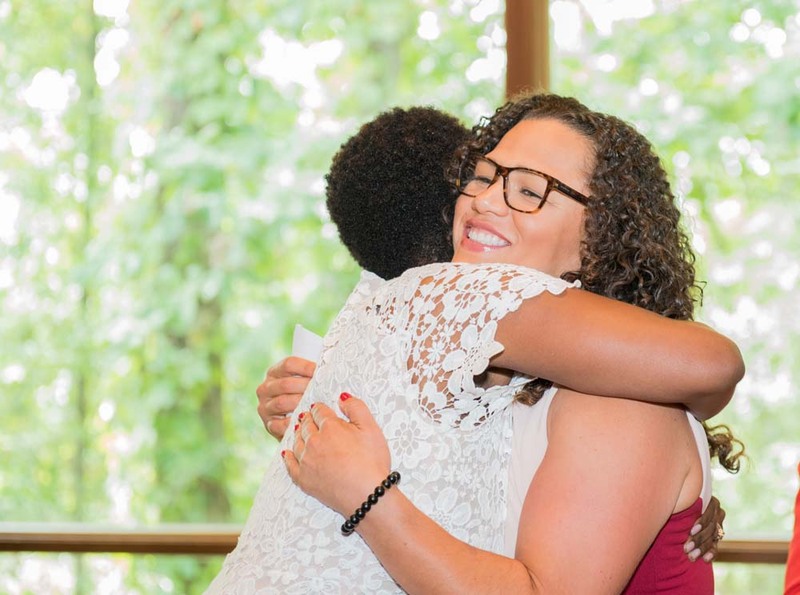 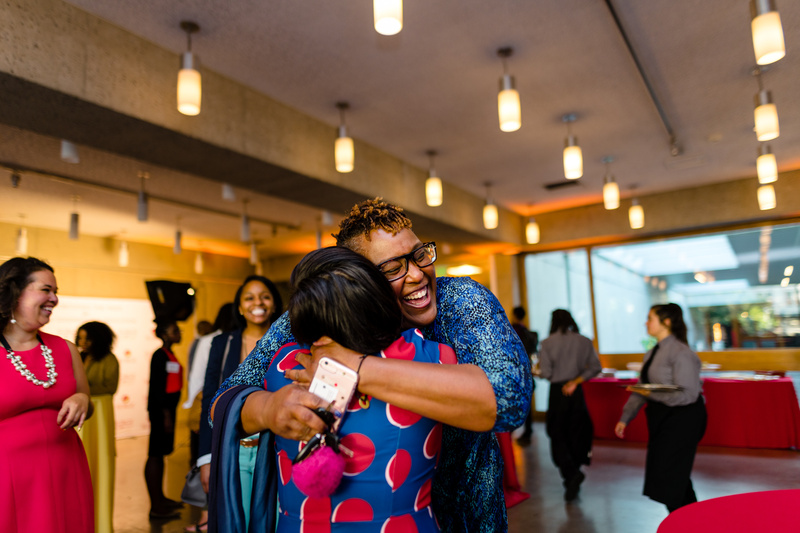 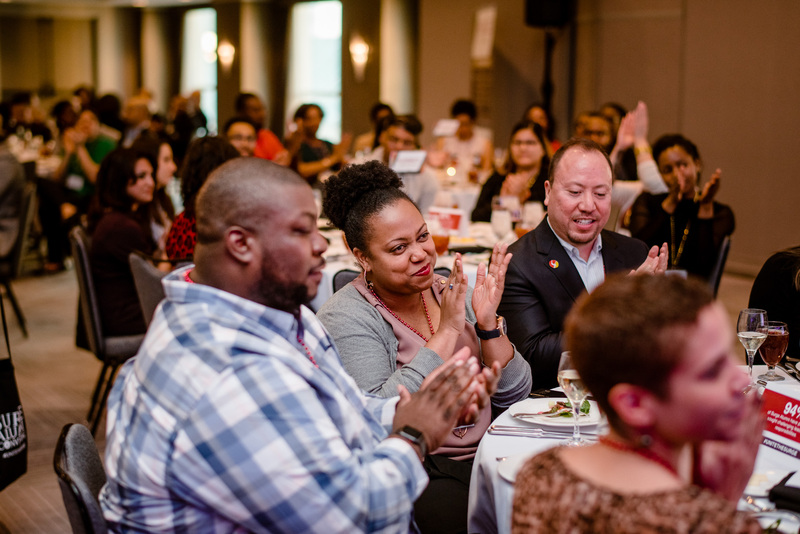 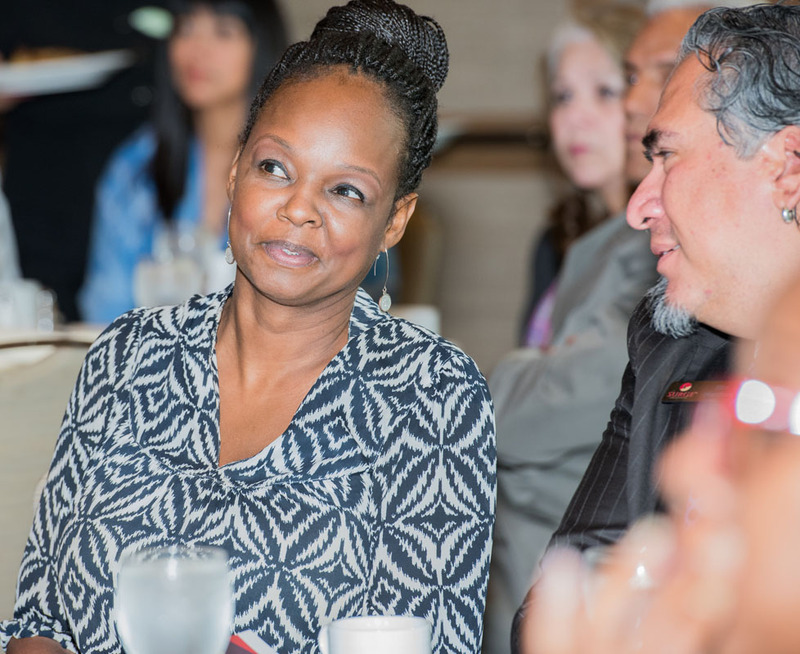 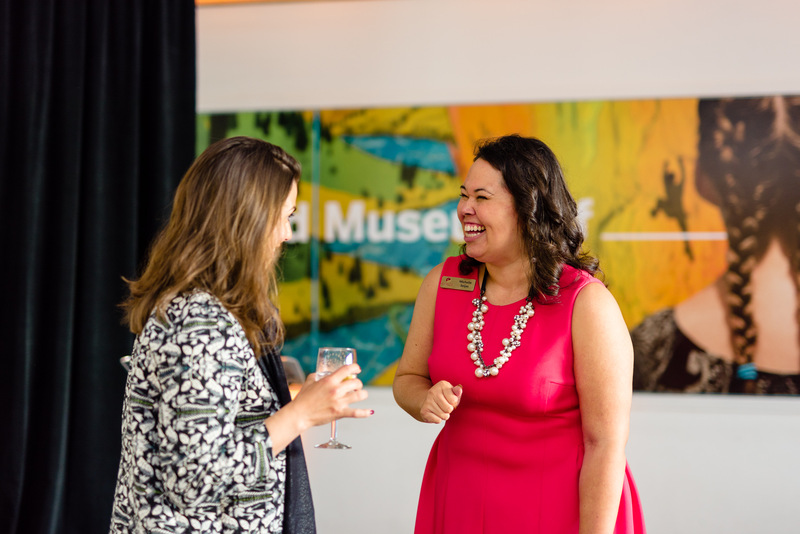 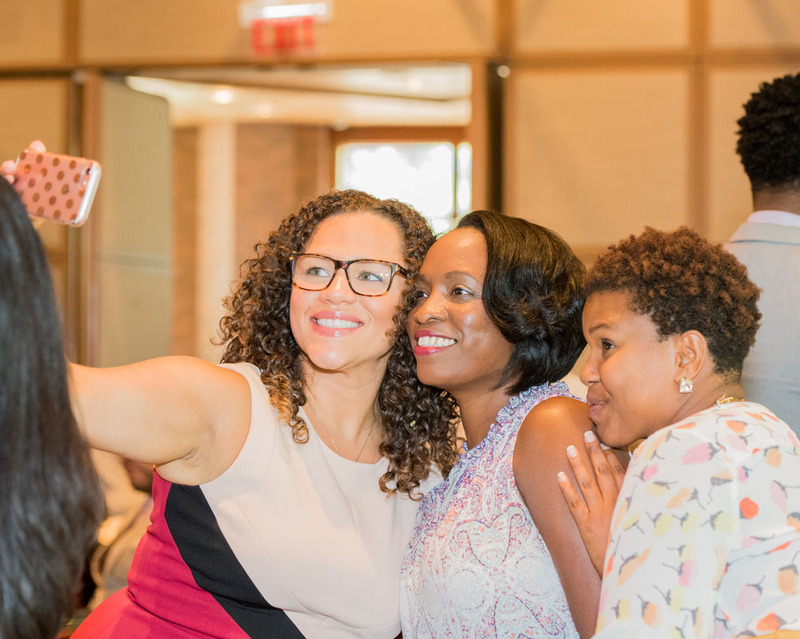 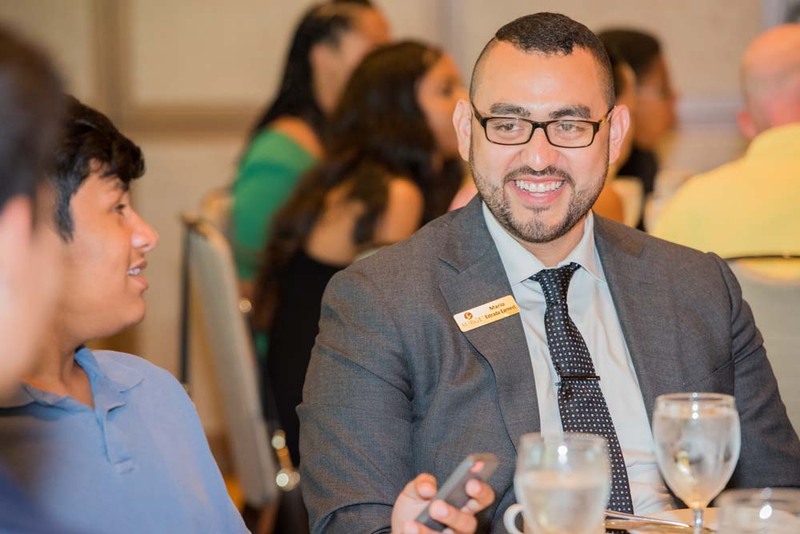 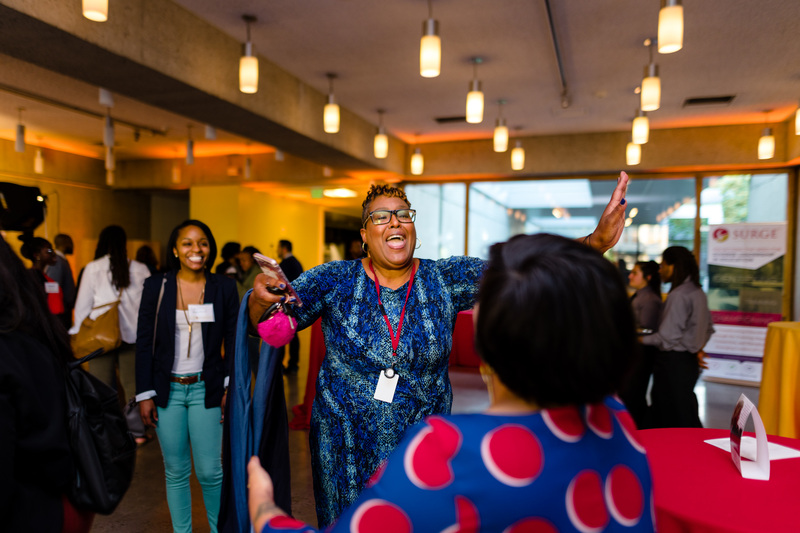 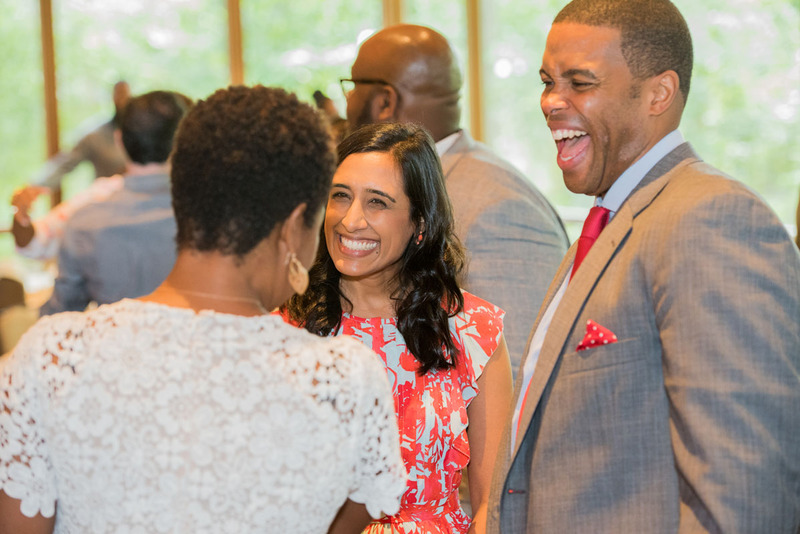 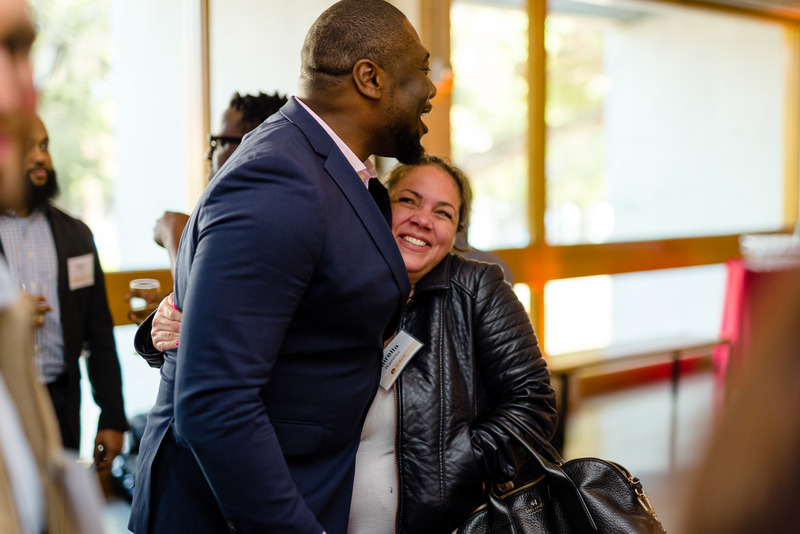 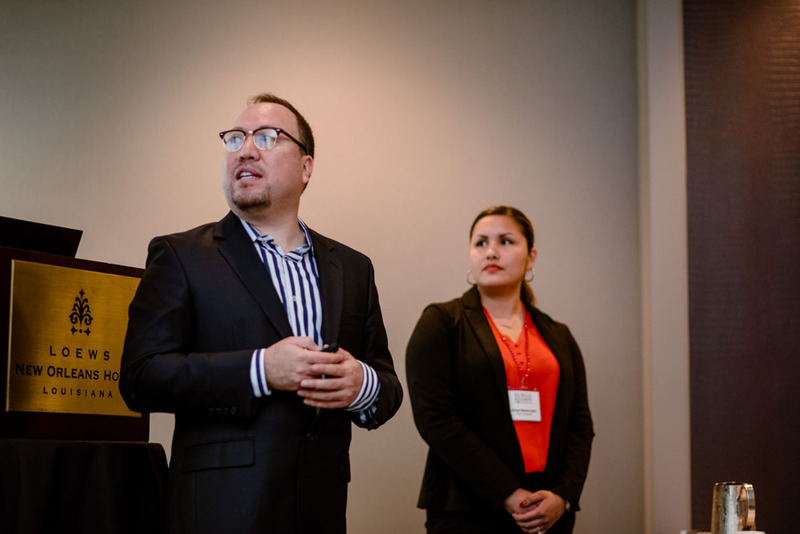 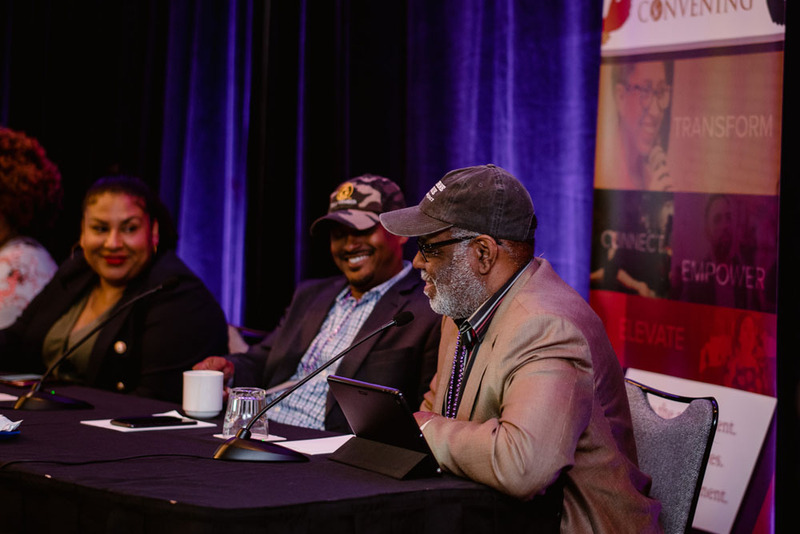 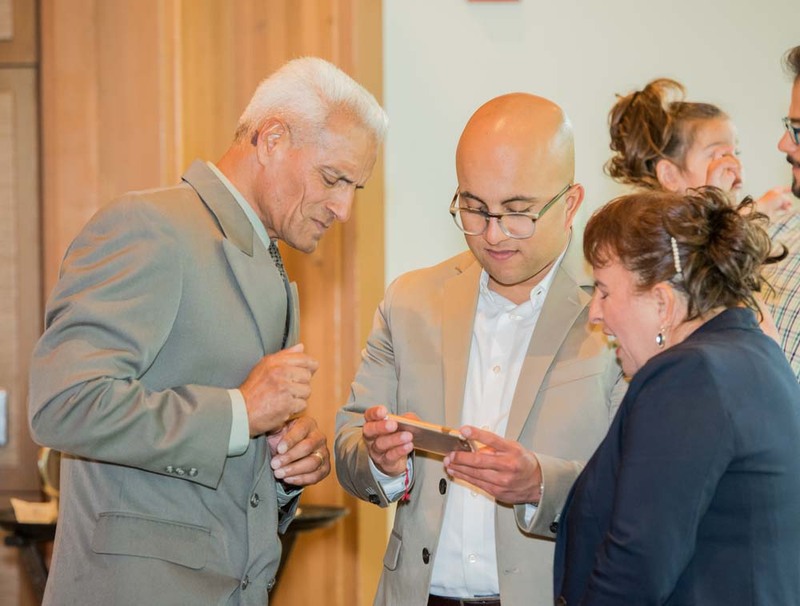 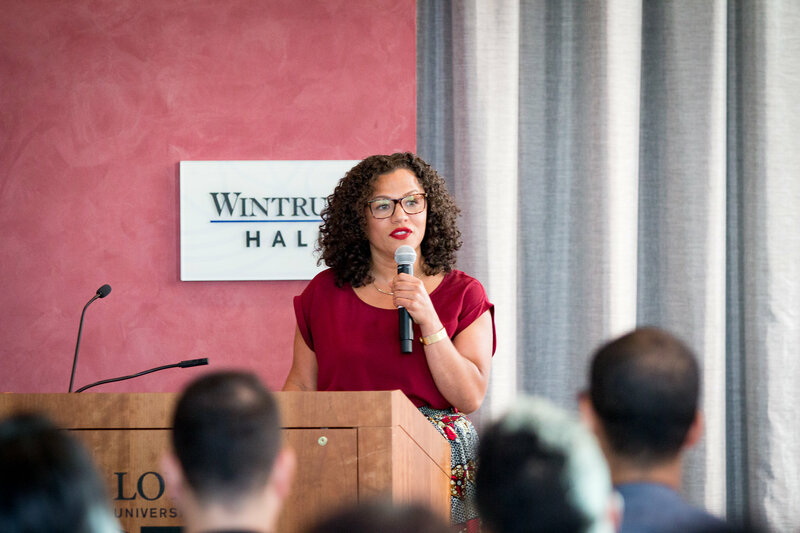 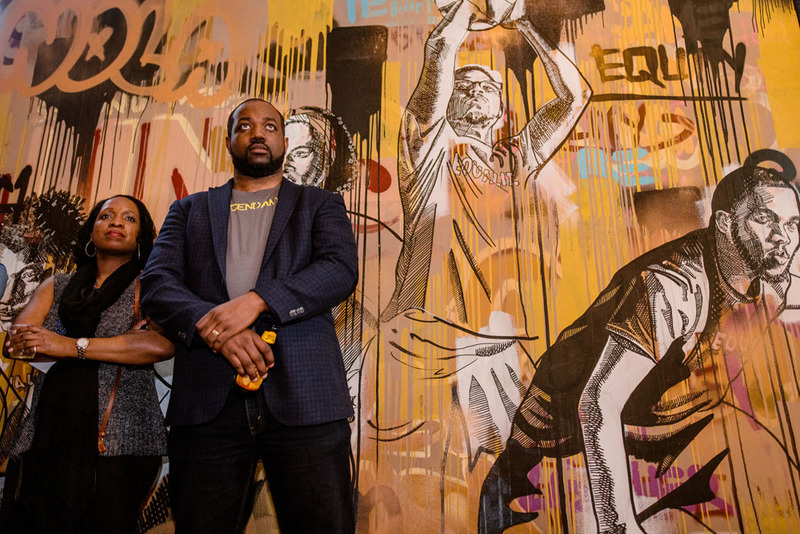 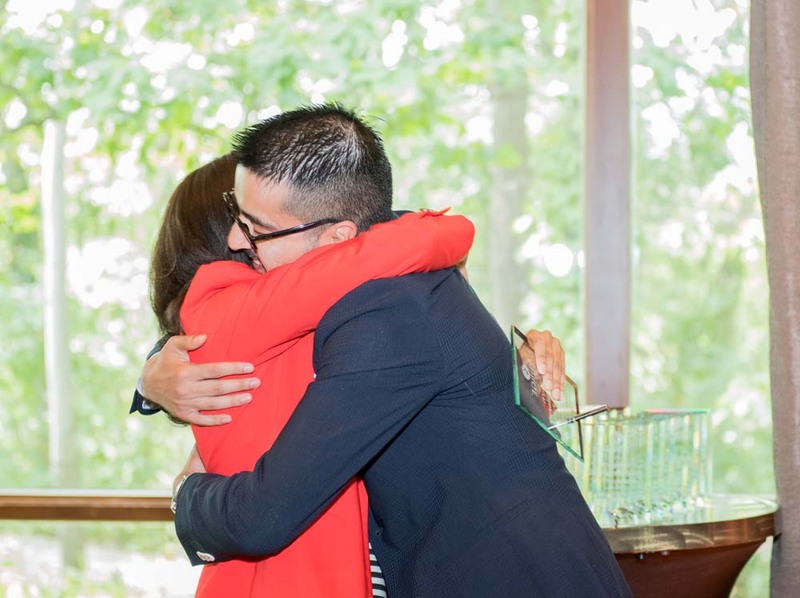 The two ceremonies represented a major shift in the Surge narrative, signifying the true emergence of a national network of mission-driven education leaders of color, all tied together by an unforgettably transformative fellowship experience. 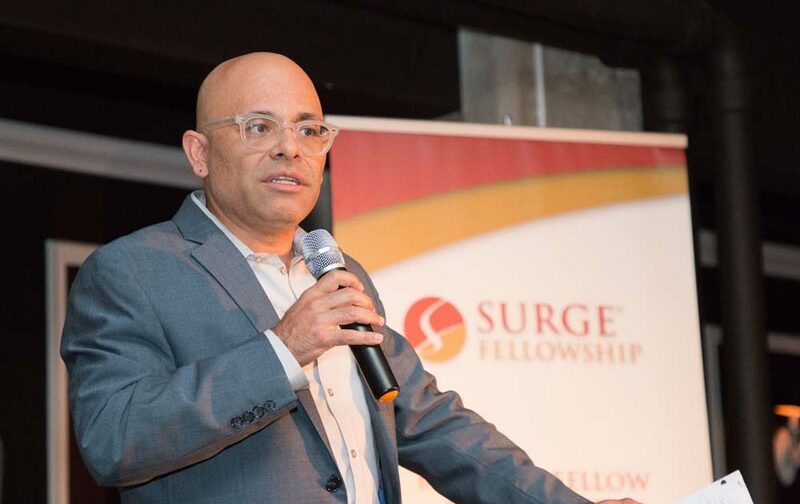 Rudy Lozano, Vice President of the Fellowship Initiative, JP Morgan Chase & Co.
https://www.surgeinstitute.org/wp-content/uploads/2015/04/logo.png 0 0 Chris Paicely https://www.surgeinstitute.org/wp-content/uploads/2015/04/logo.png Chris Paicely2018-08-28 11:14:272018-11-05 16:58:342018 Surge Fellows Graduate! 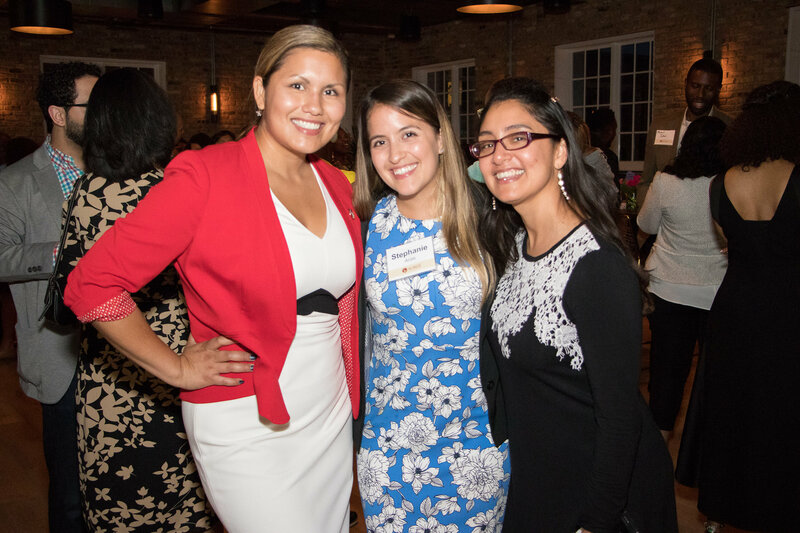 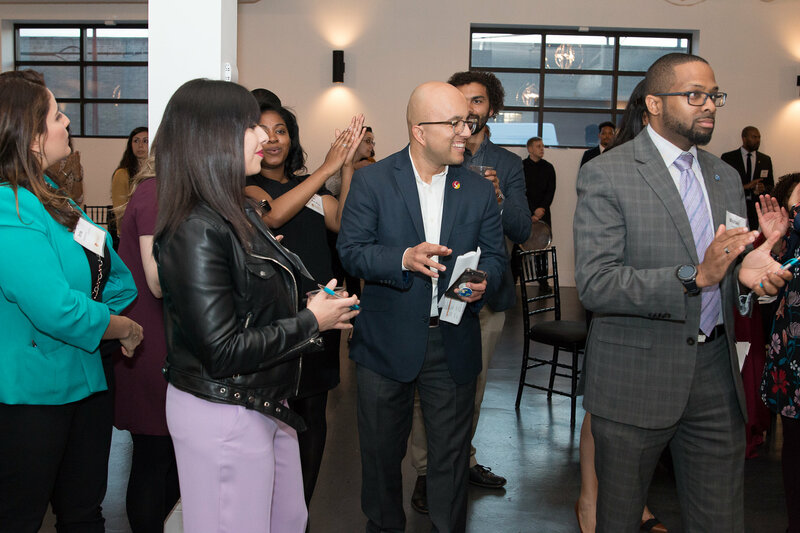 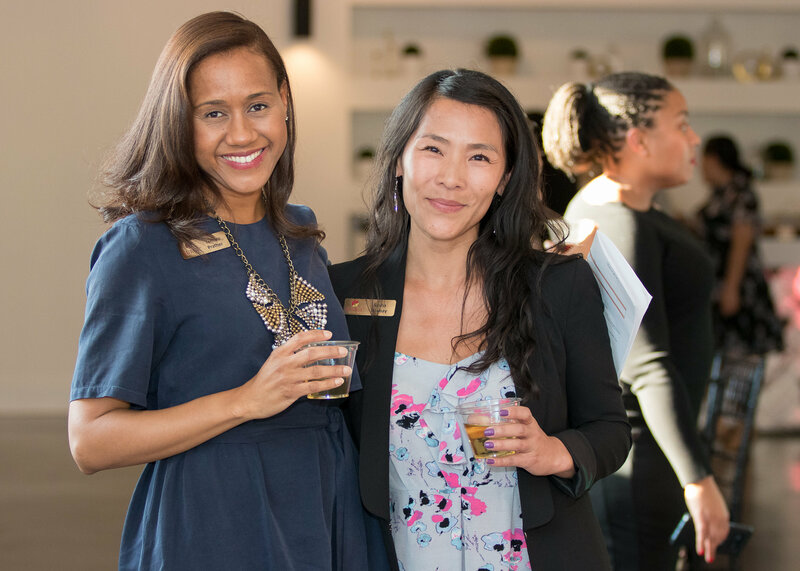 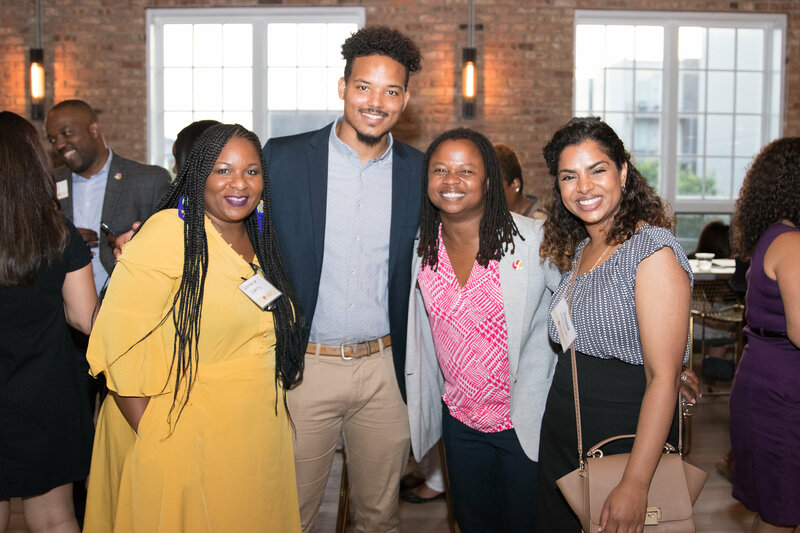 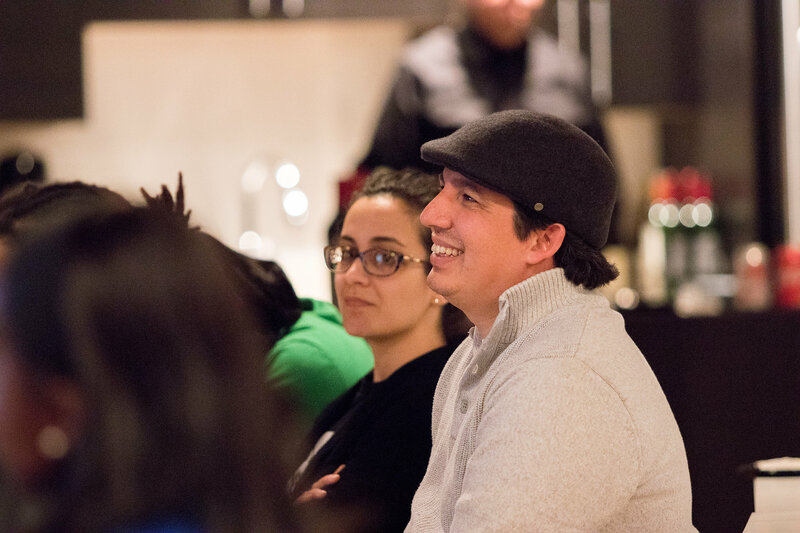 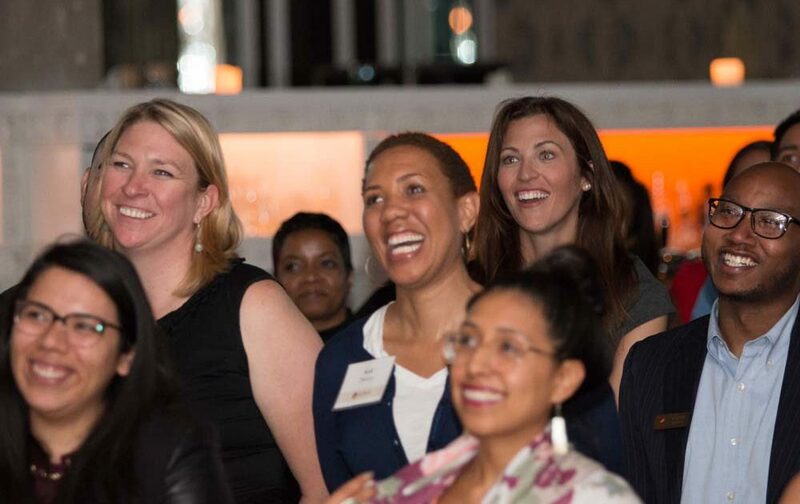 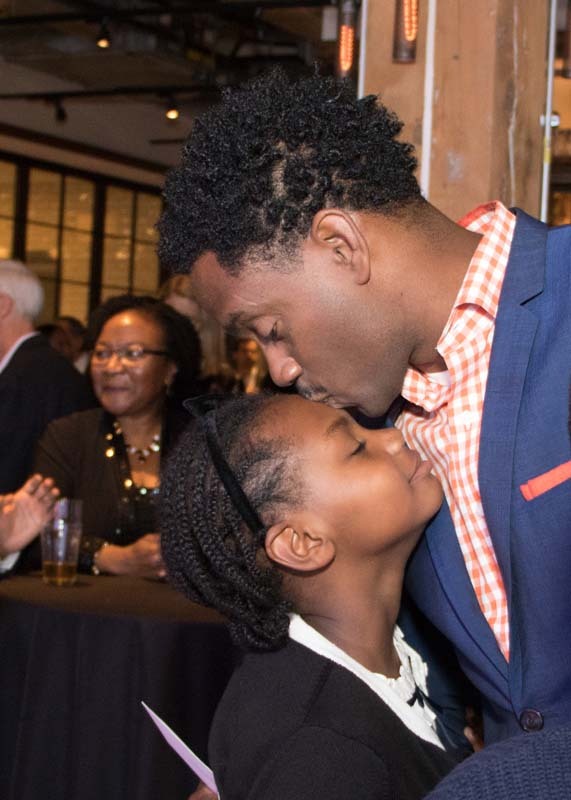 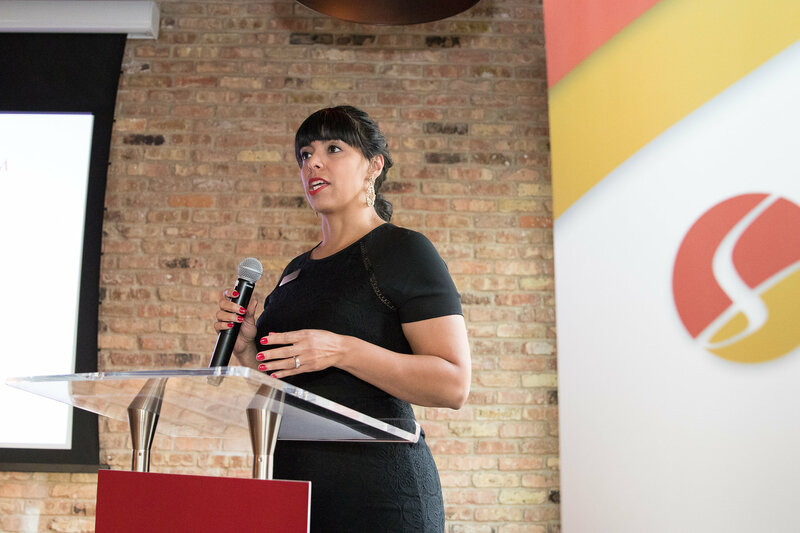 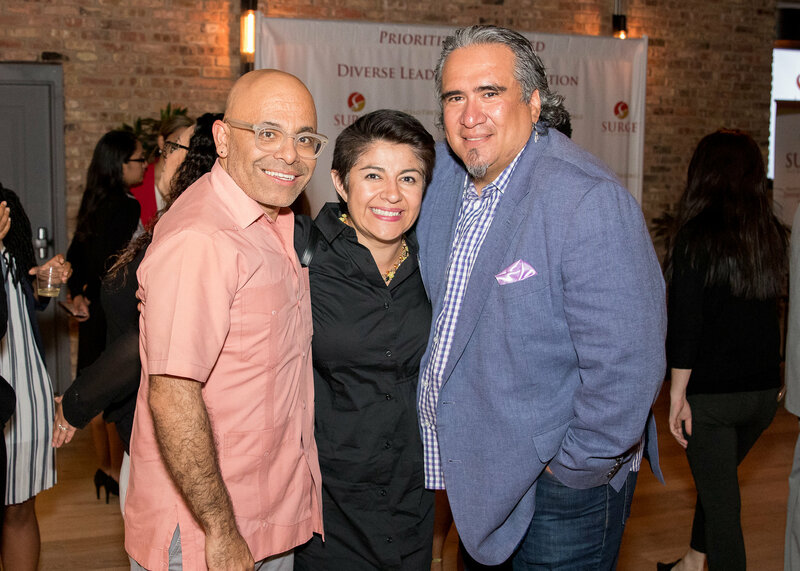 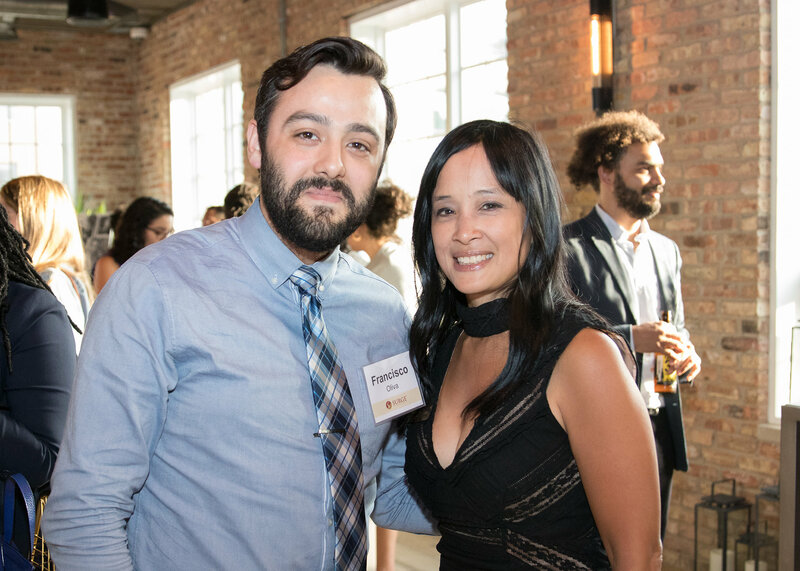 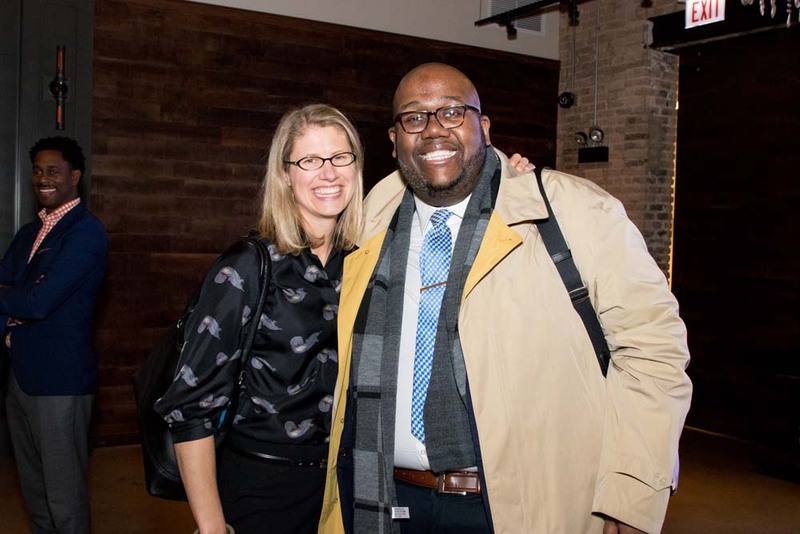 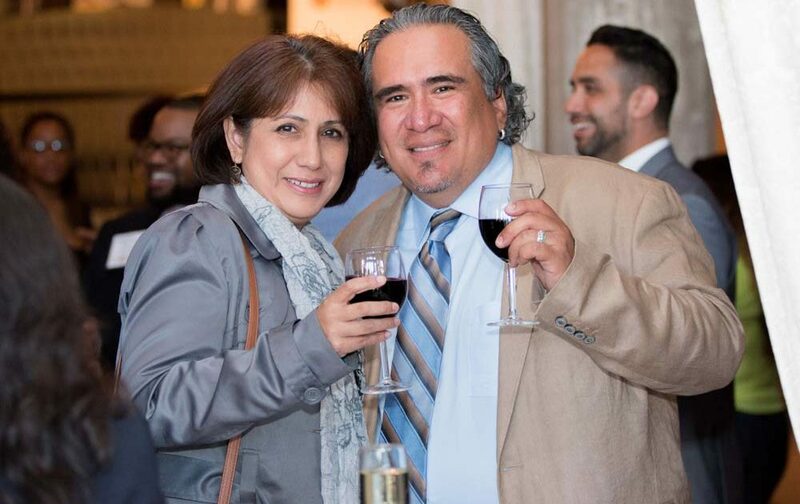 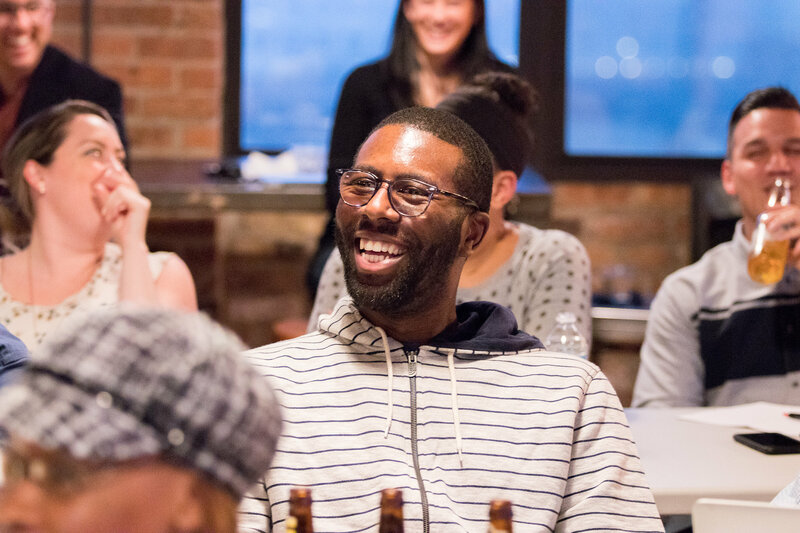 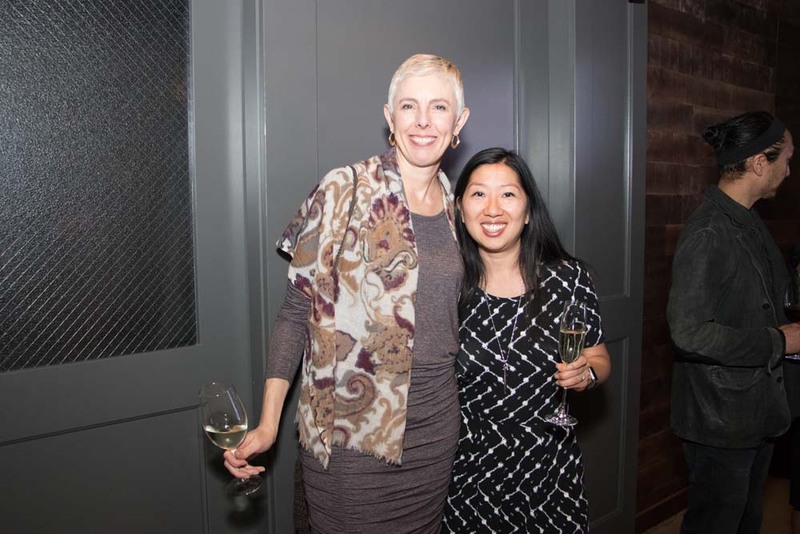 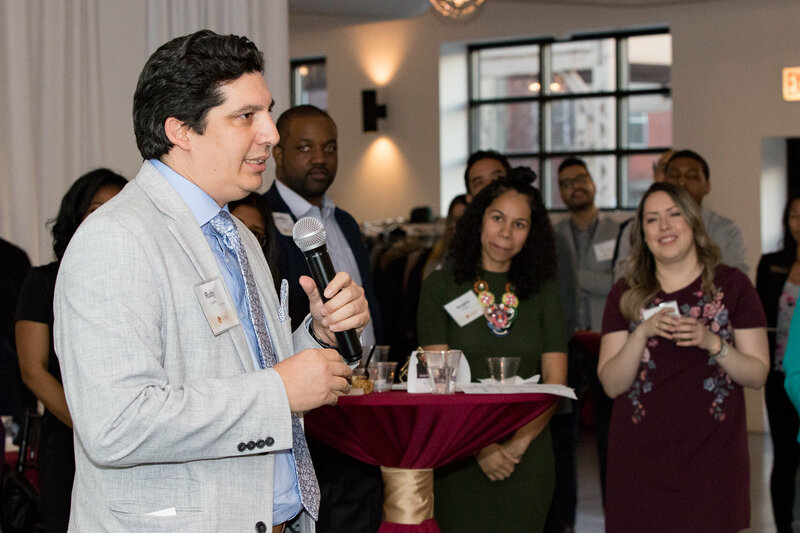 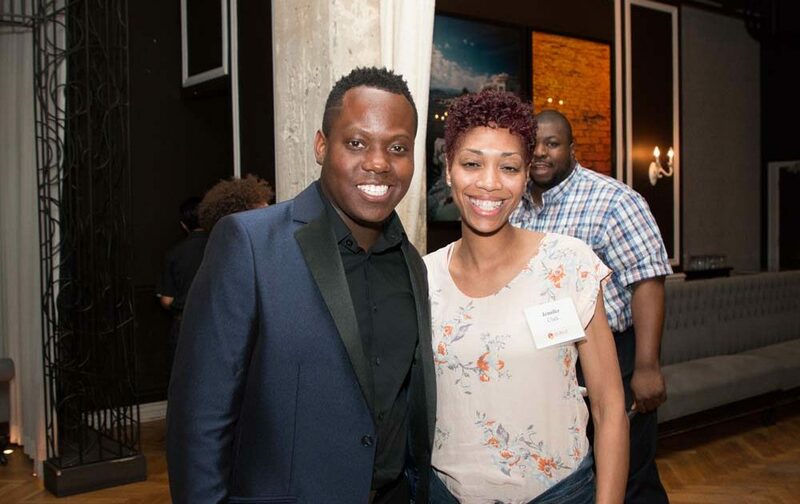 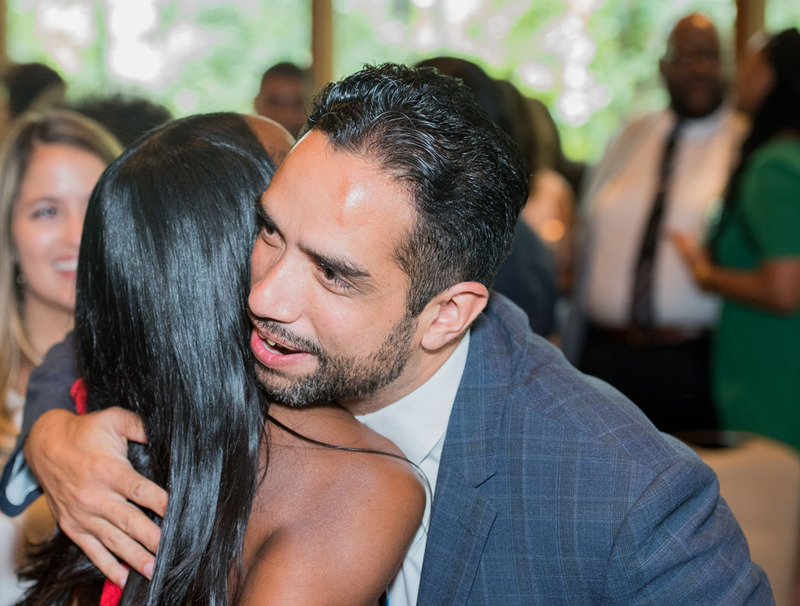 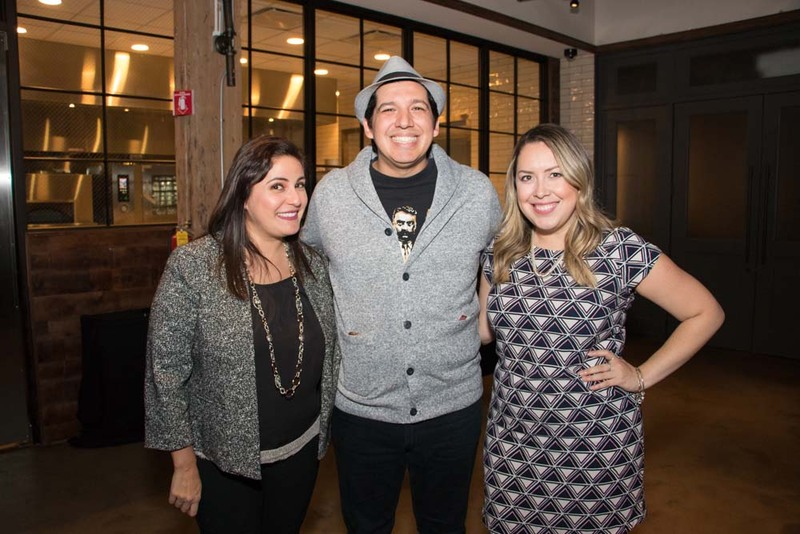 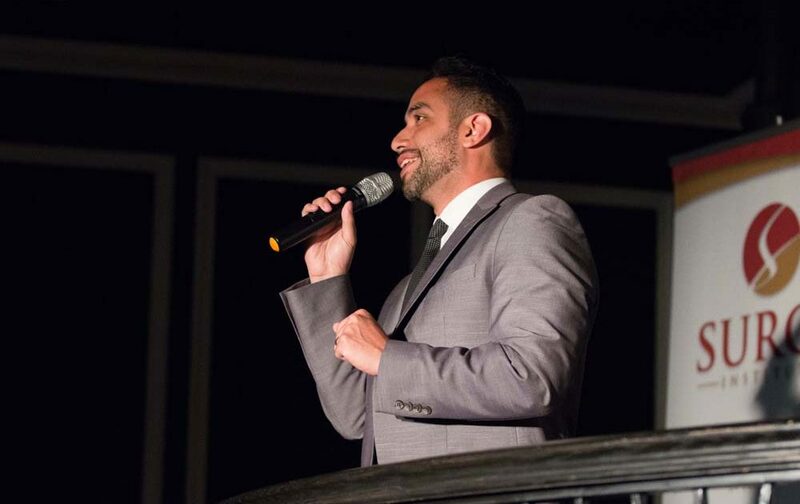 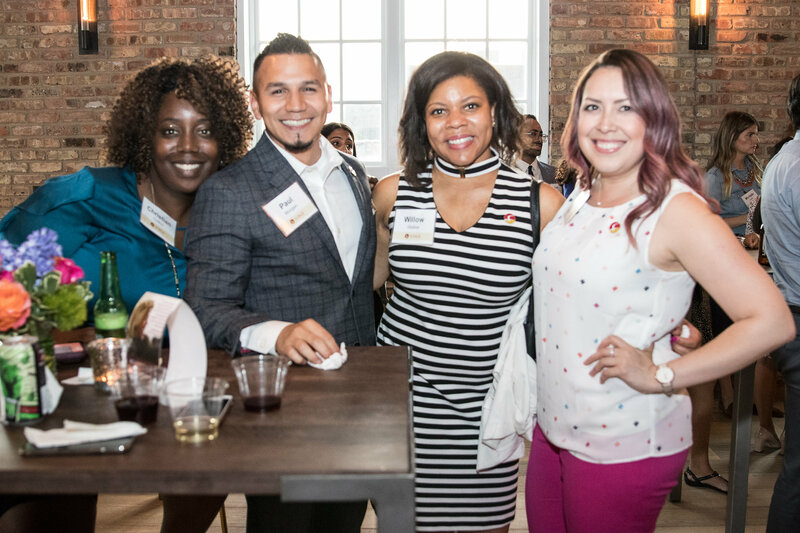 On June 7th, 2018, the Surge community packed Loft Lucia in Chicago for an inspiring night in support of expanding diversity in the city’s education leadership pipeline. 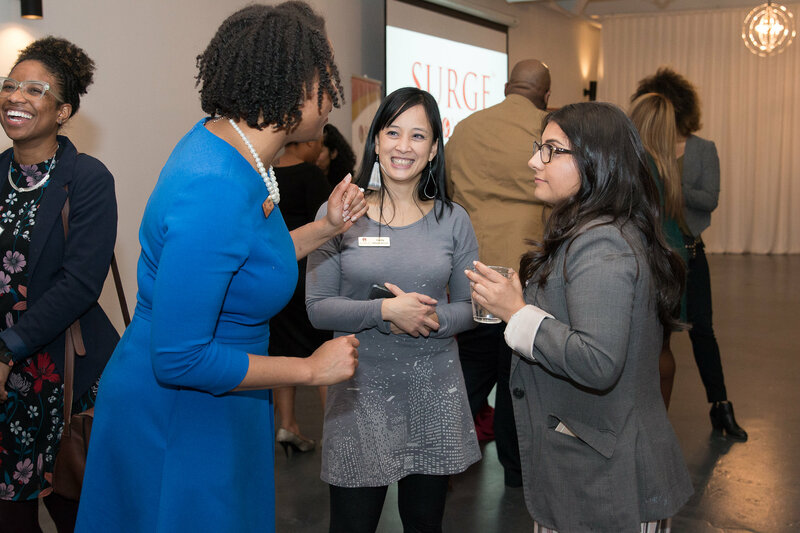 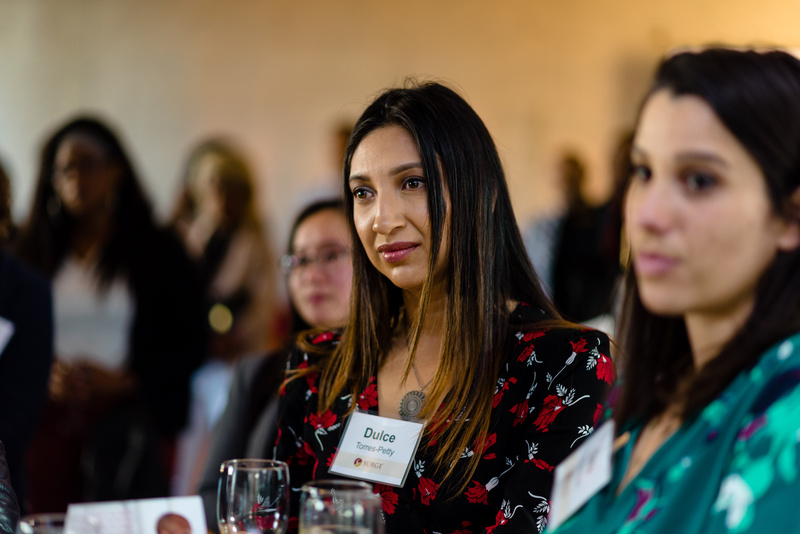 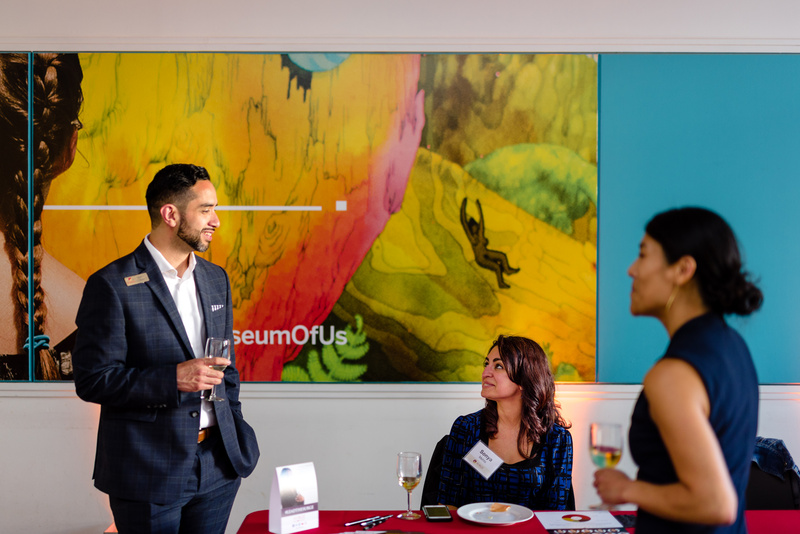 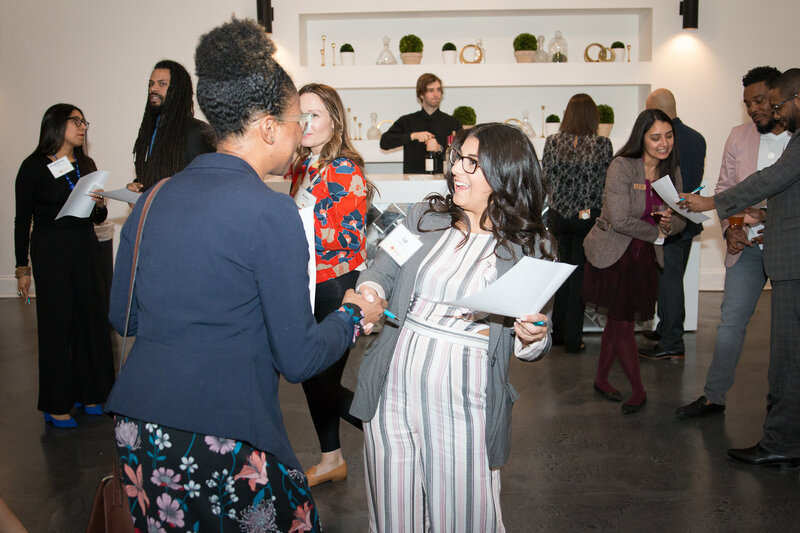 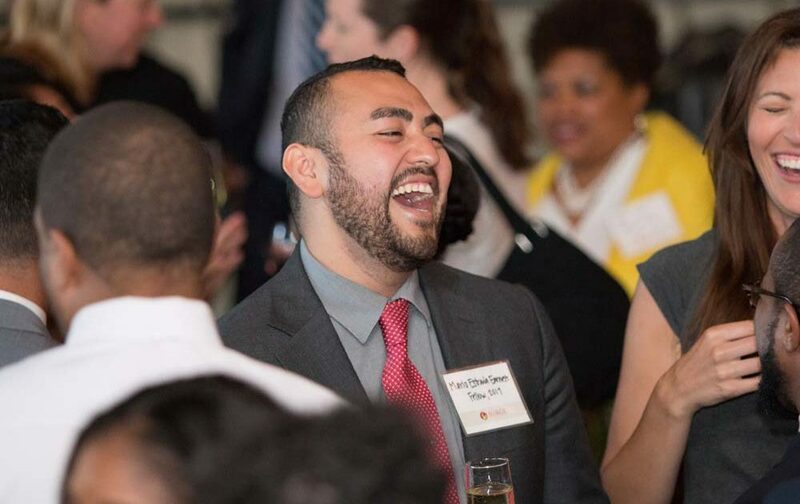 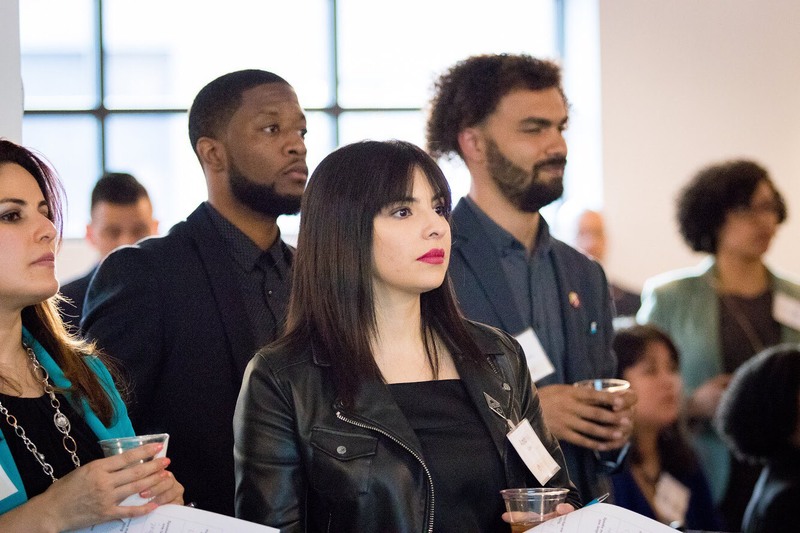 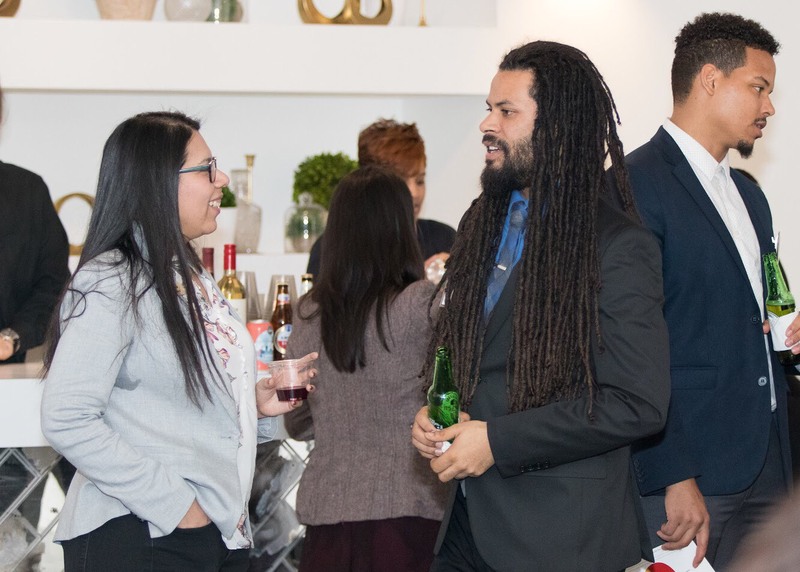 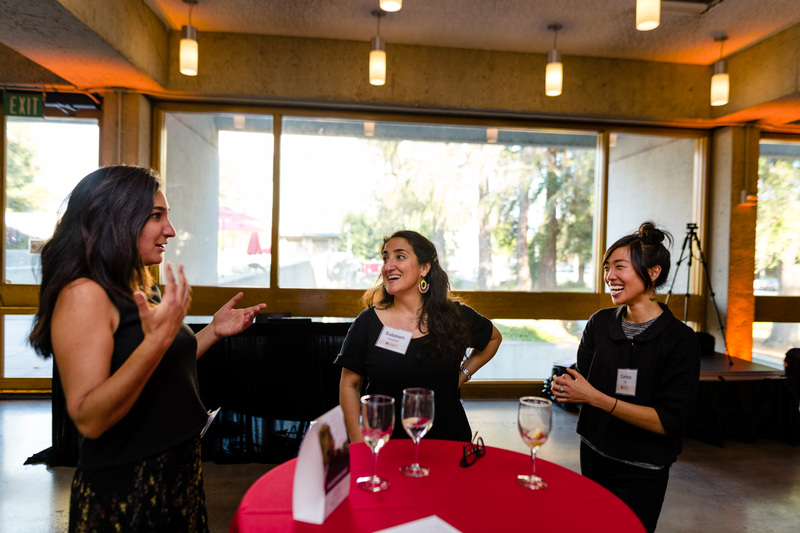 Among the guests were prospective Surge Fellows, partner organizations, and a broad community of education leaders connected to the Surge movement. 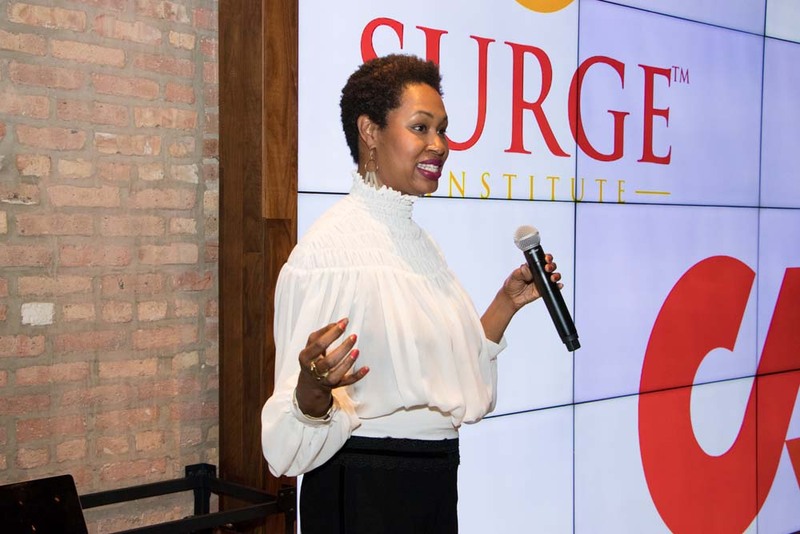 Surge Chicago Executive Director Tamara Prather opened the evening, remarking on the continued growth and evolution of the Surge movement with fellowship being a central key to that growth. 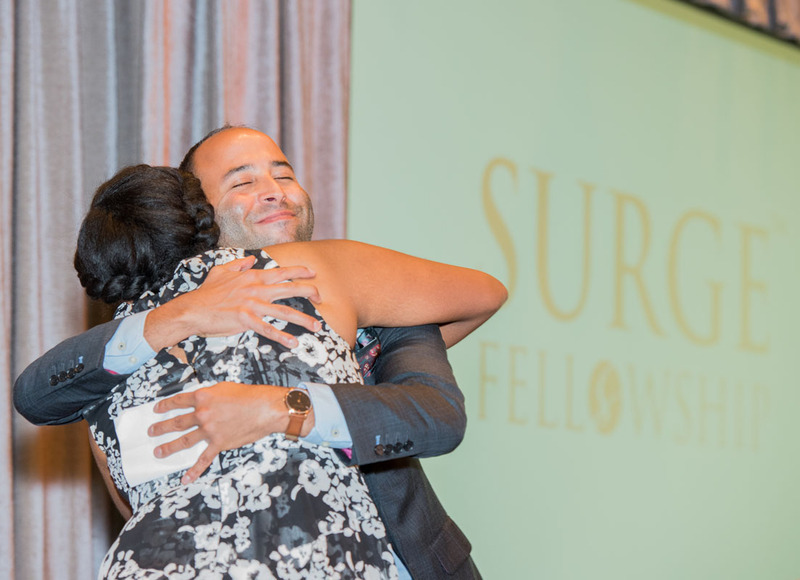 Adding to the story of the evening was 2018 Surge Fellow A.J. 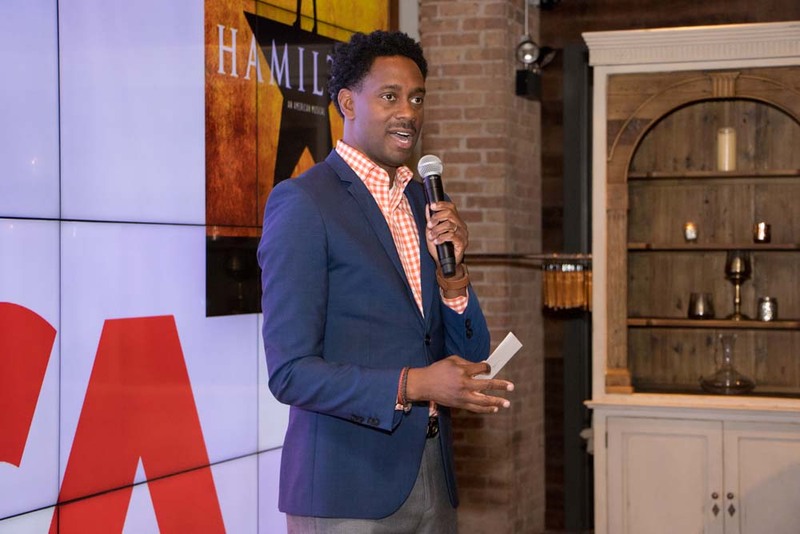 Watson, who remarked on the community of like-minded supporters and confidants he’s gained since joining the fellowship. 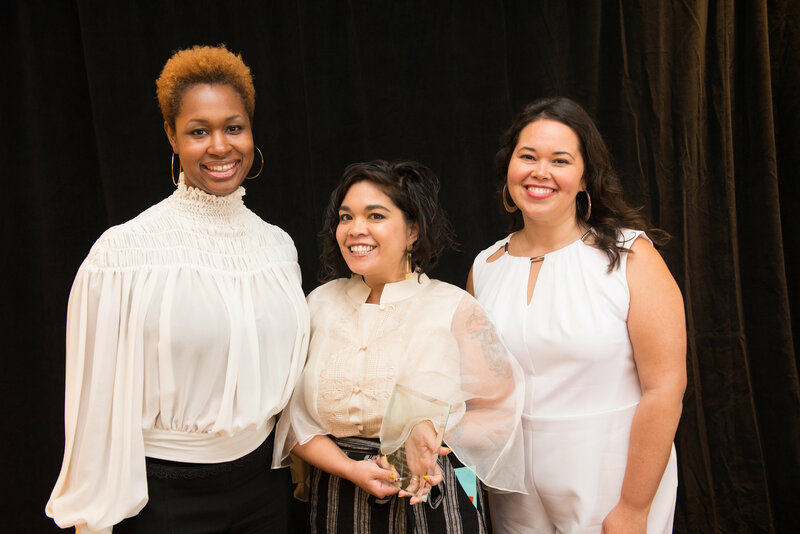 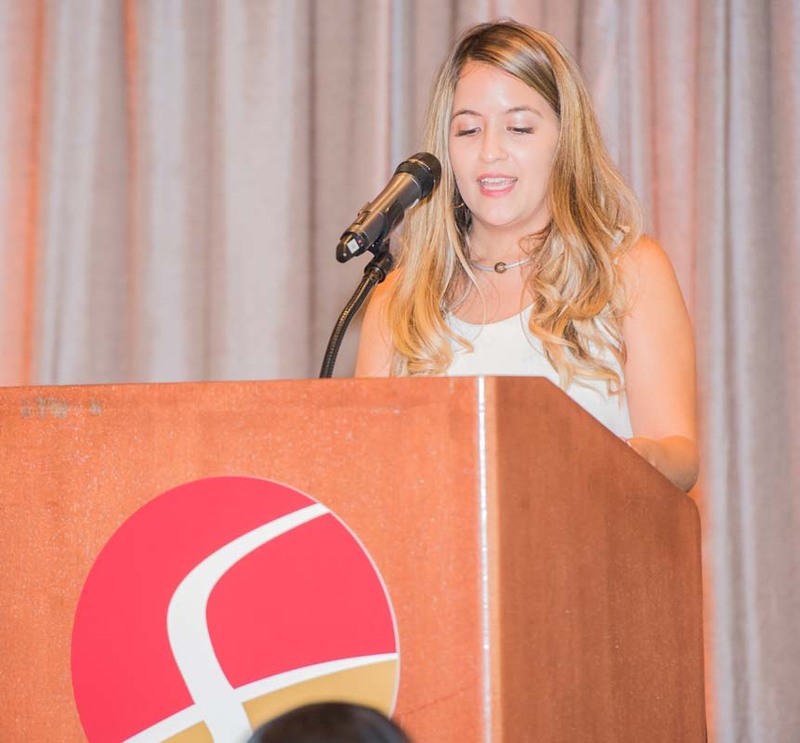 Nina Sanchez, a 2017 Surge Alumna, continued that through-line with her words, painting a vivid picture of the power of the collective. 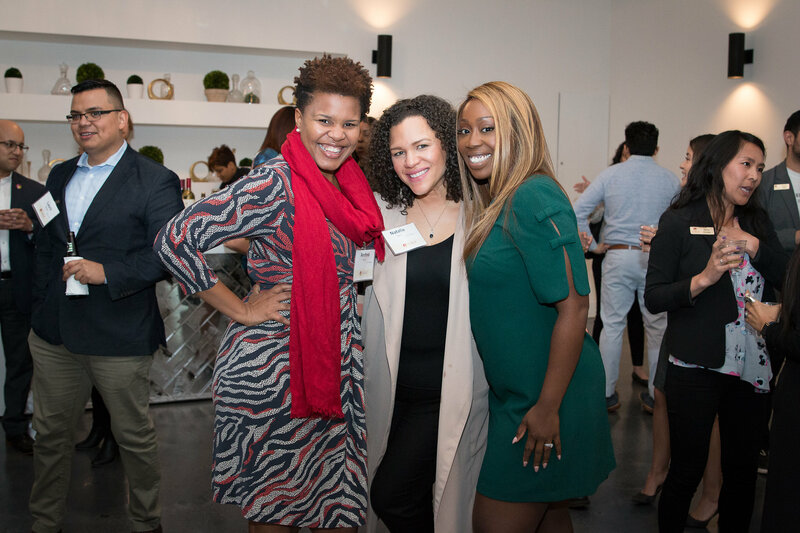 Watch the video below to see highlights from the evening! 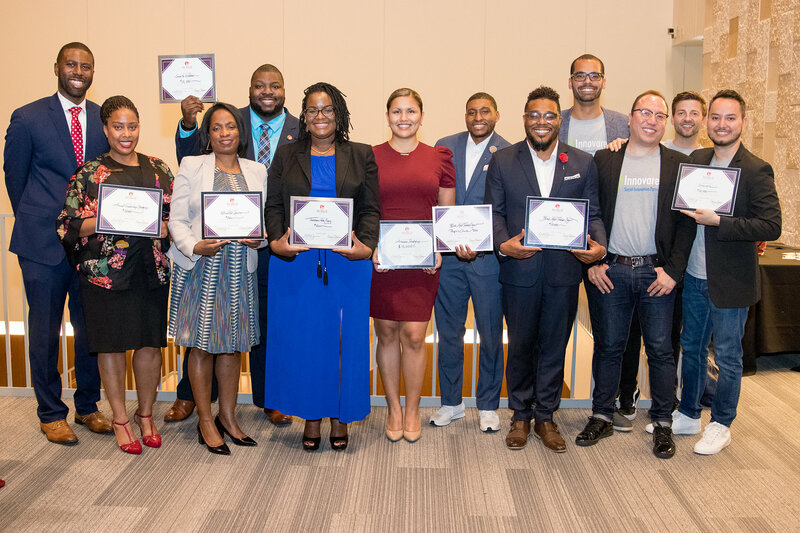 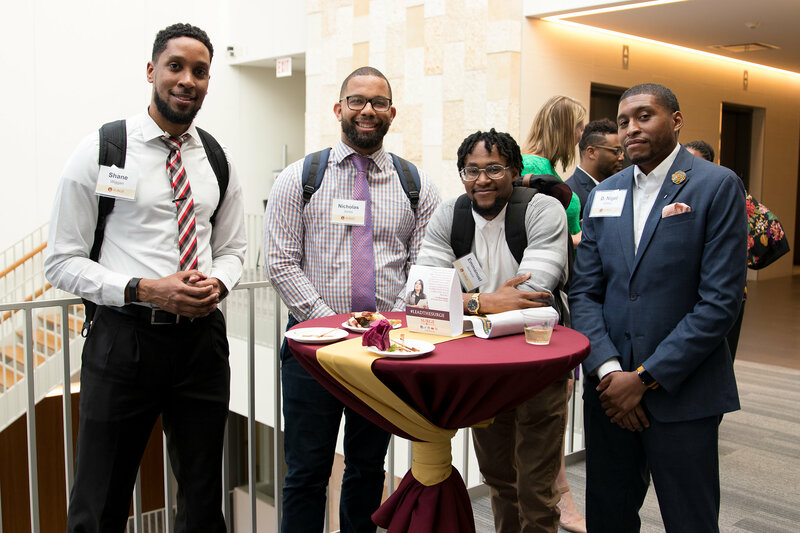 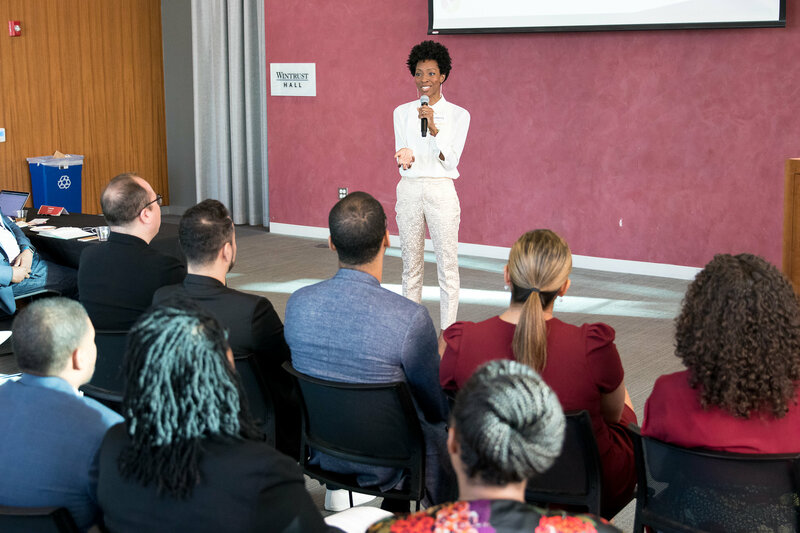 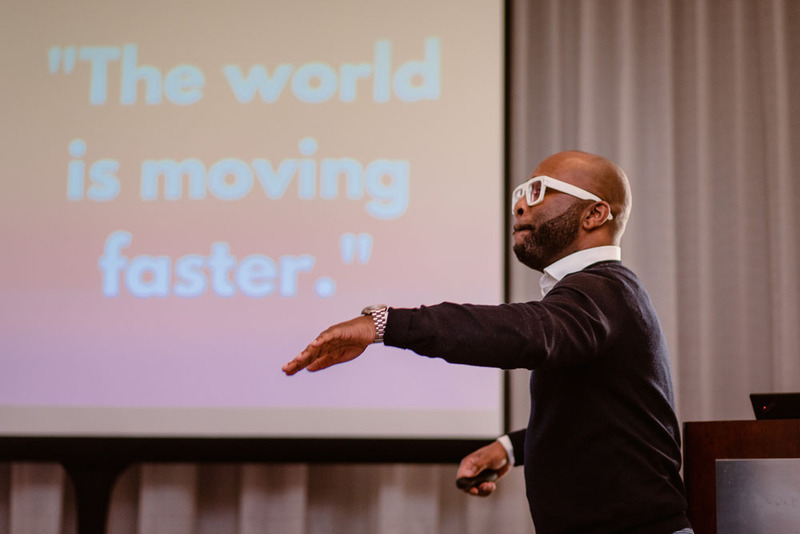 Held at Quinlan School of Business at Loyola University, Surge Angels Pitch Night was a celebration of the creative genius of our people and an elevation of ventures primed to make an impact for our youth and communities of color. 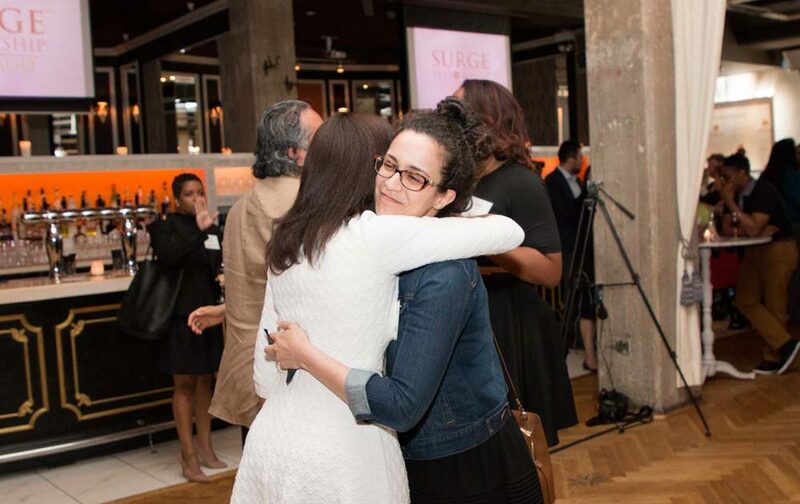 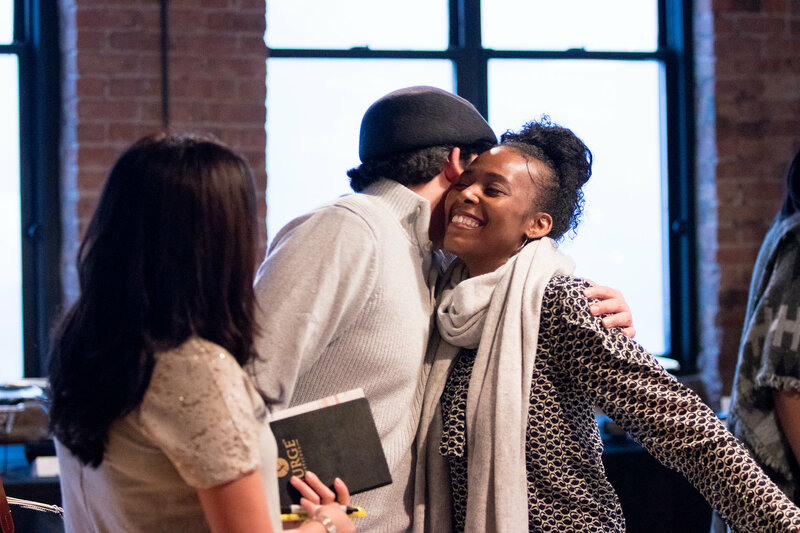 The Surge Angels pilot program served our mission of supporting and elevating the continued work of our growing network of Surge Fellowship Alumni. 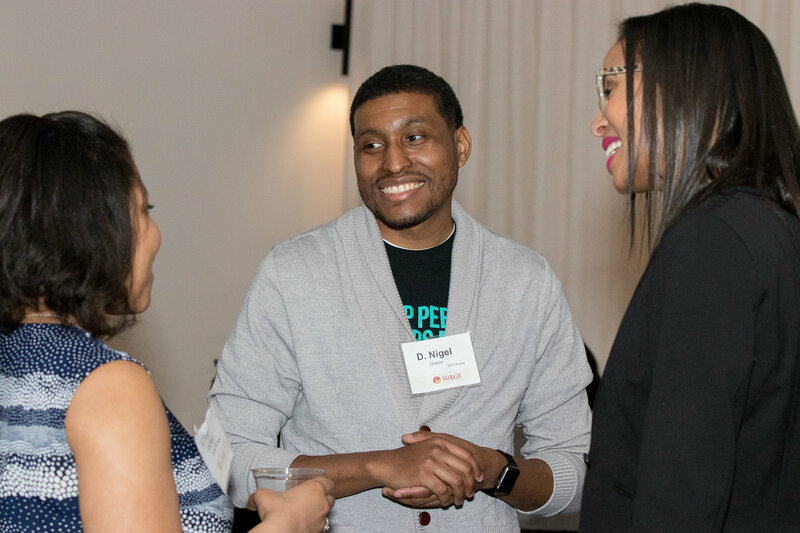 A Walton Family Foundation-funded pilot program, Angels allowed our more entrepreneurial alumni the opportunity to secure funding, guidance, and support in taking their innovative ventures to the next level. 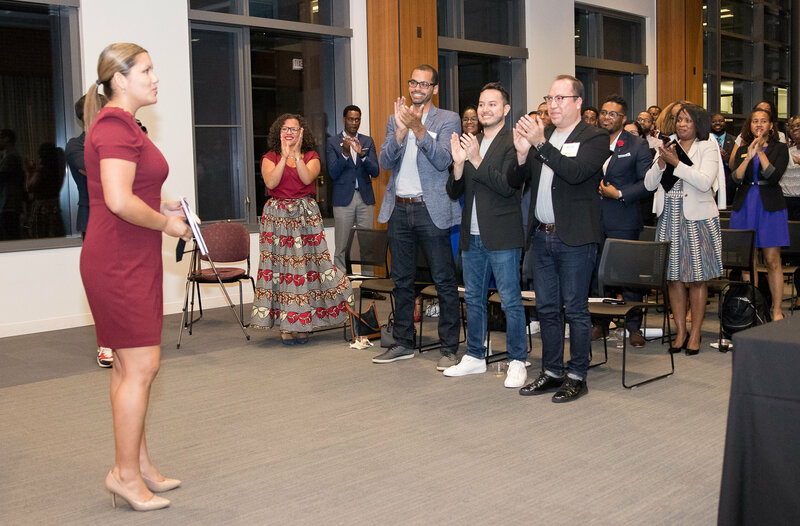 The program culminated in Pitch Night, where nine alums pitched their mapped-out venture plan to expert judges in hopes of securing funding. 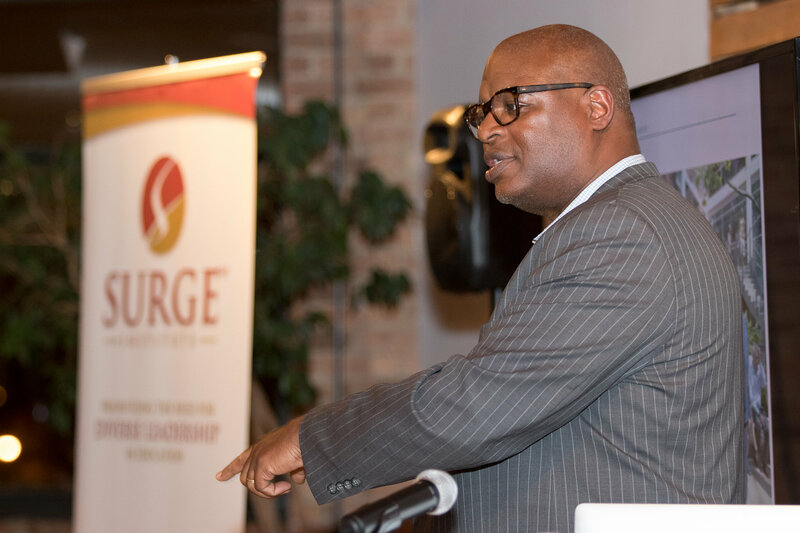 After seven pitches from nine Surge Alumni, we awarded $60,000 toward the growth and development of their ventures. 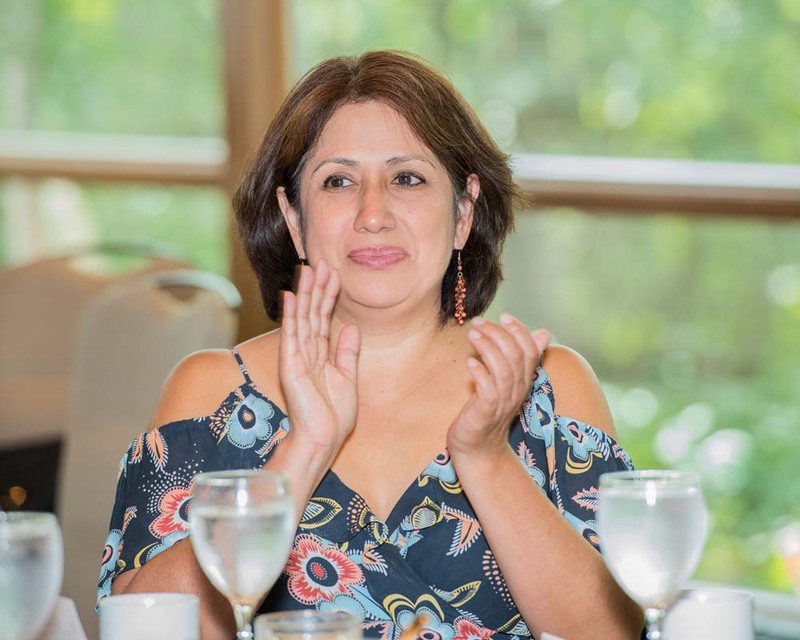 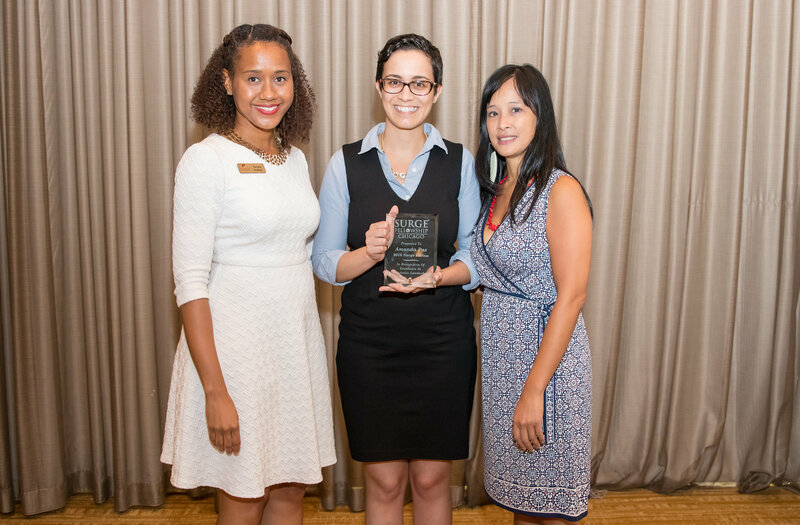 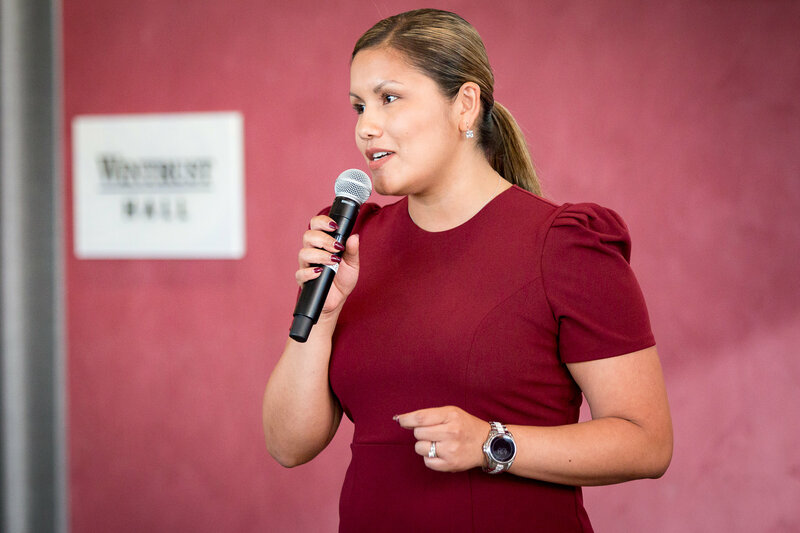 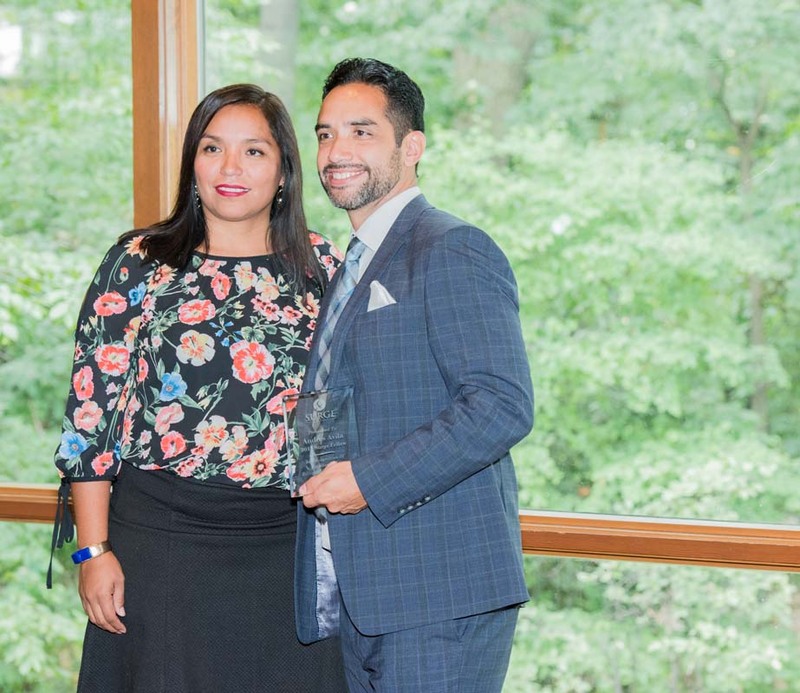 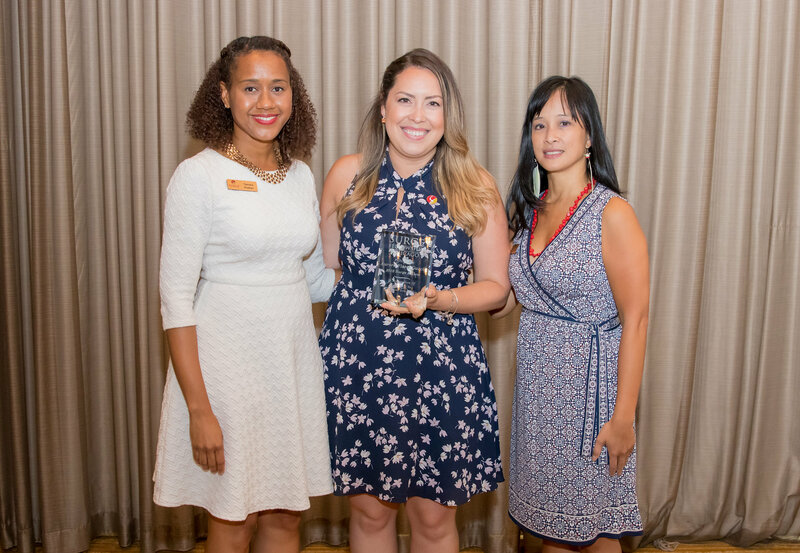 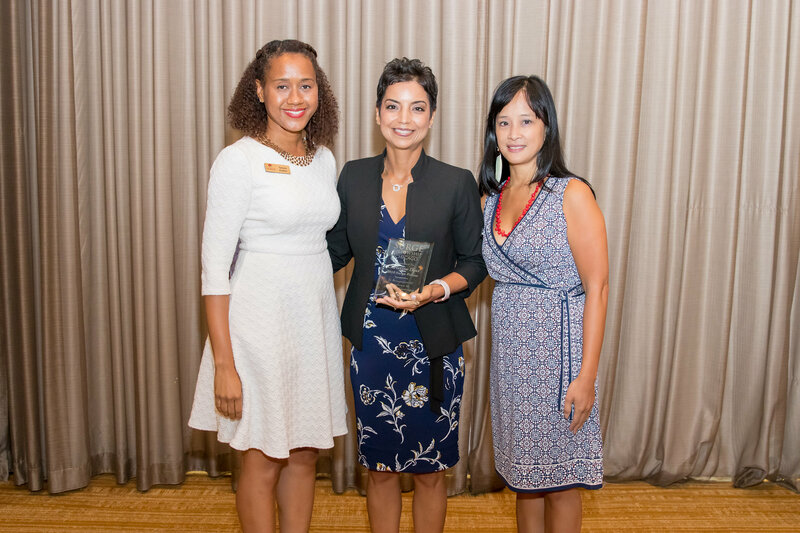 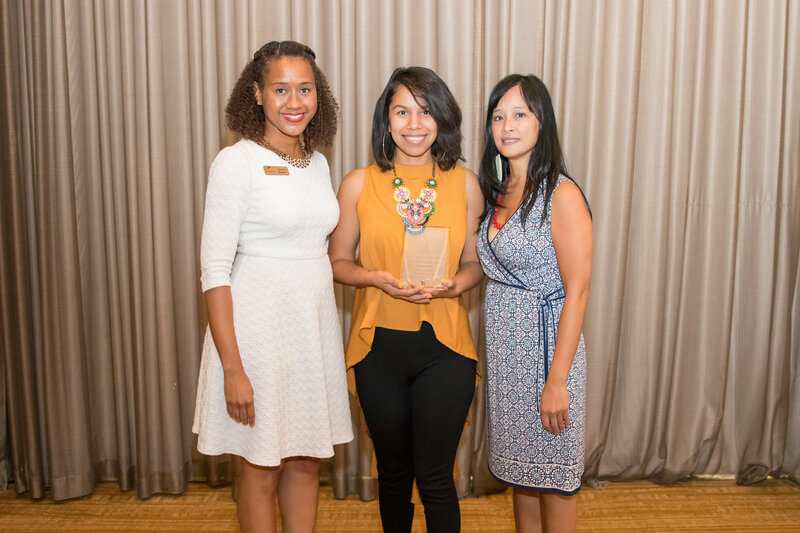 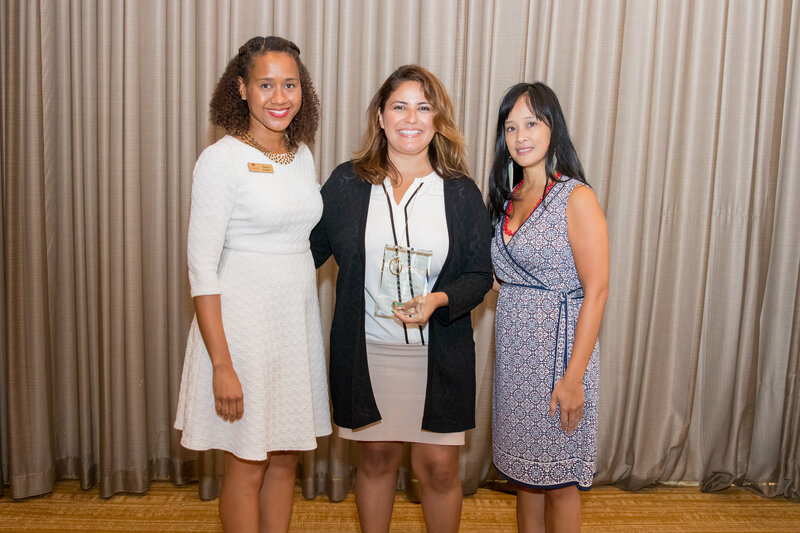 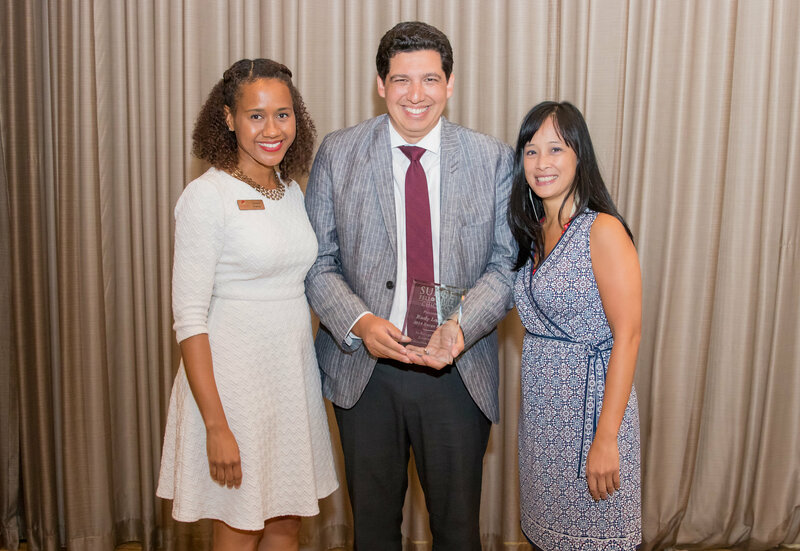 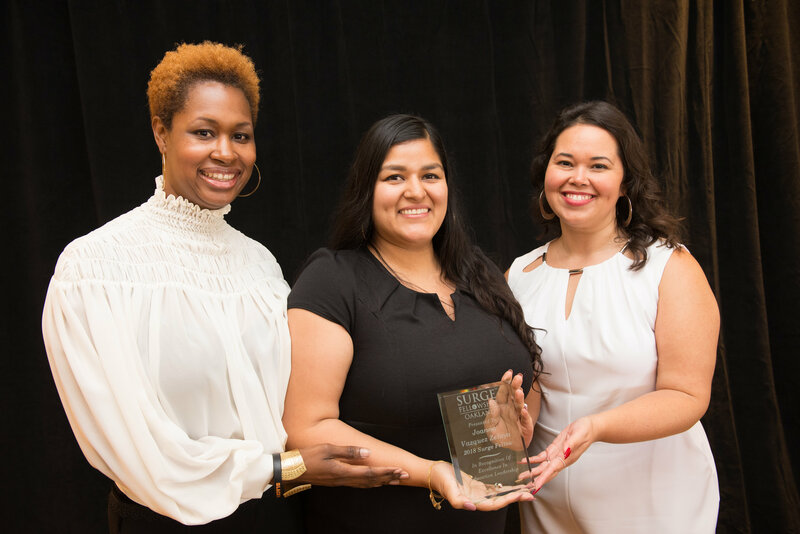 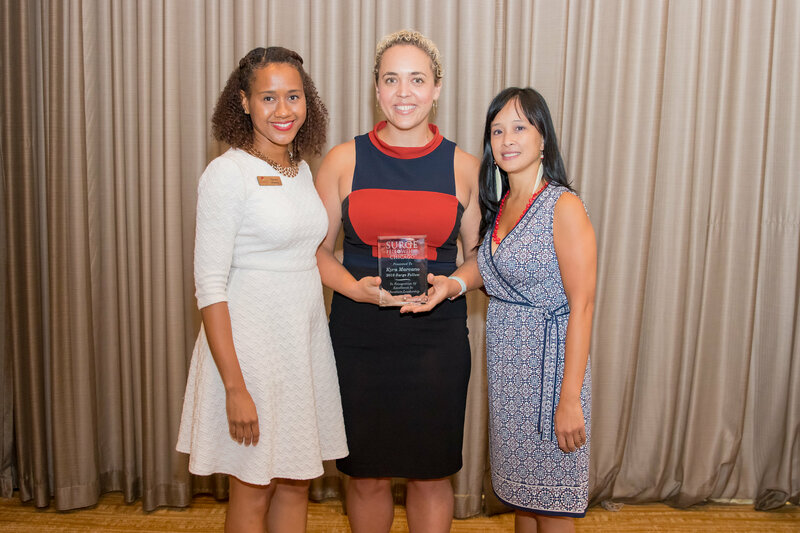 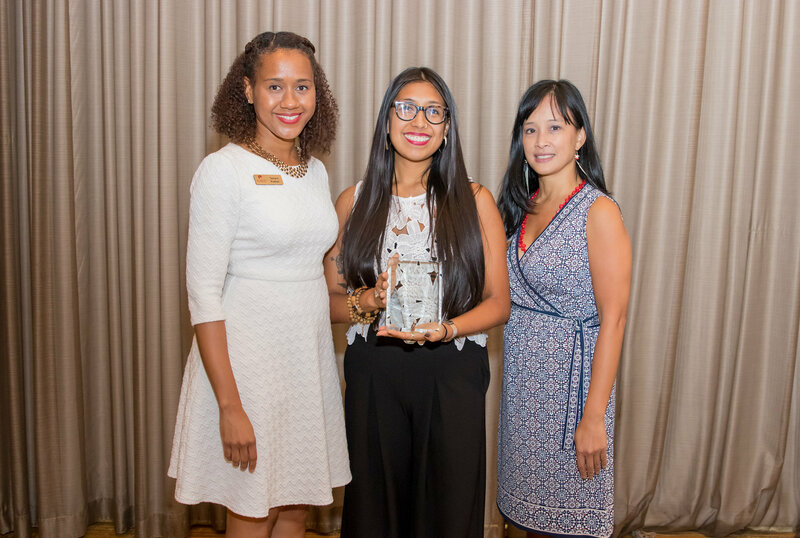 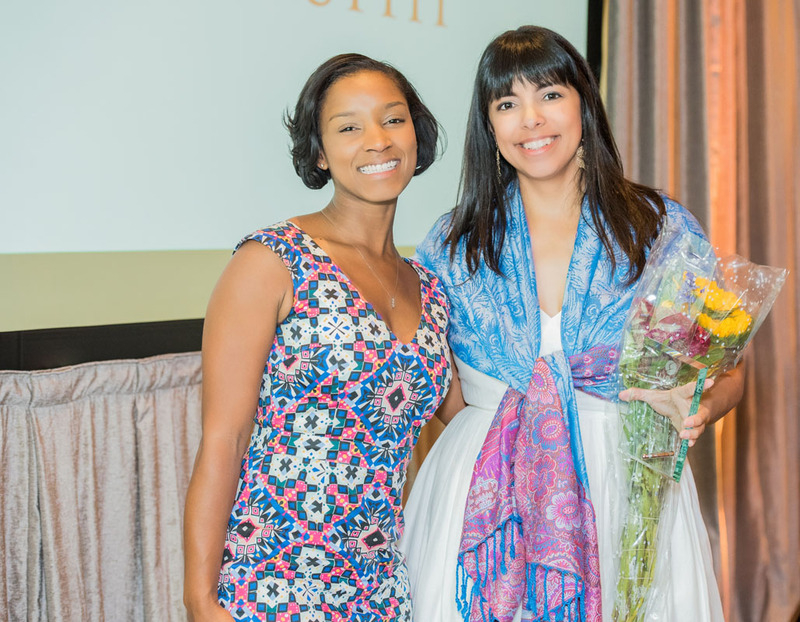 Our first place winner, Grisel Maldonado, was awarded $15,000 toward her plan to expand the scope of Avanza Strategies, her educational program strategy consulting firm, to serve 20,000 students across 10 cities by 2020. 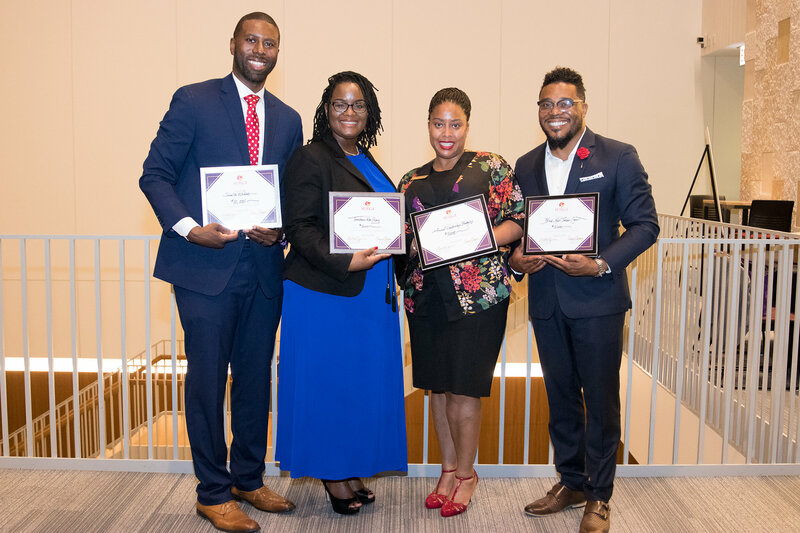 Among the ventures were education consultancy firms, youth counseling programs, and teacher development initiatives, all with the ultimate goal of improving education for our communities. 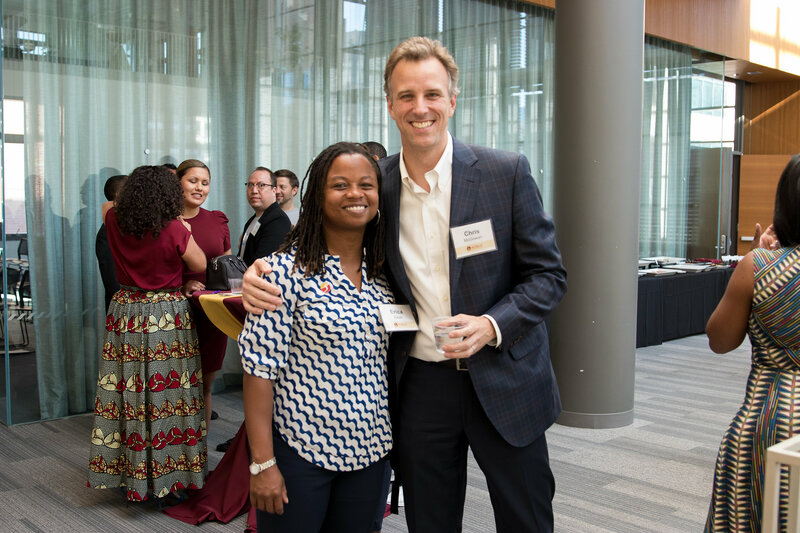 Foundations represented at the event included NewSchools Venture Fund, Bill & Melinda Gates Foundation, Camelback Ventures, and the Walton Family Foundation. 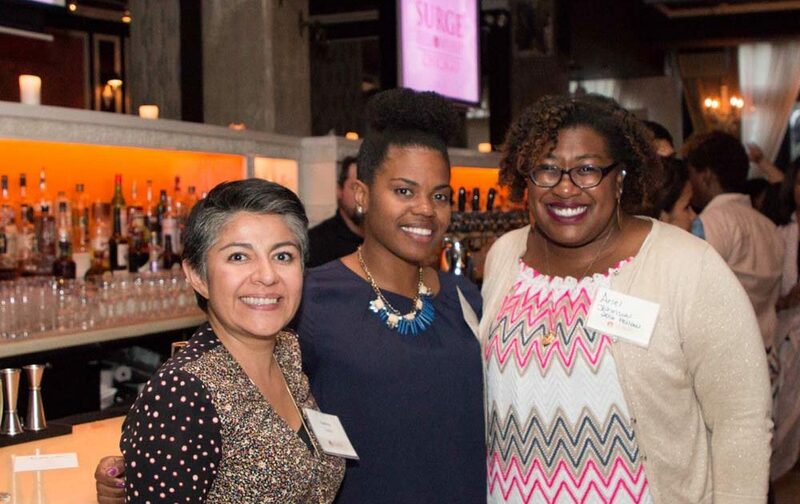 Surge Alumni from our first three cohorts participated. 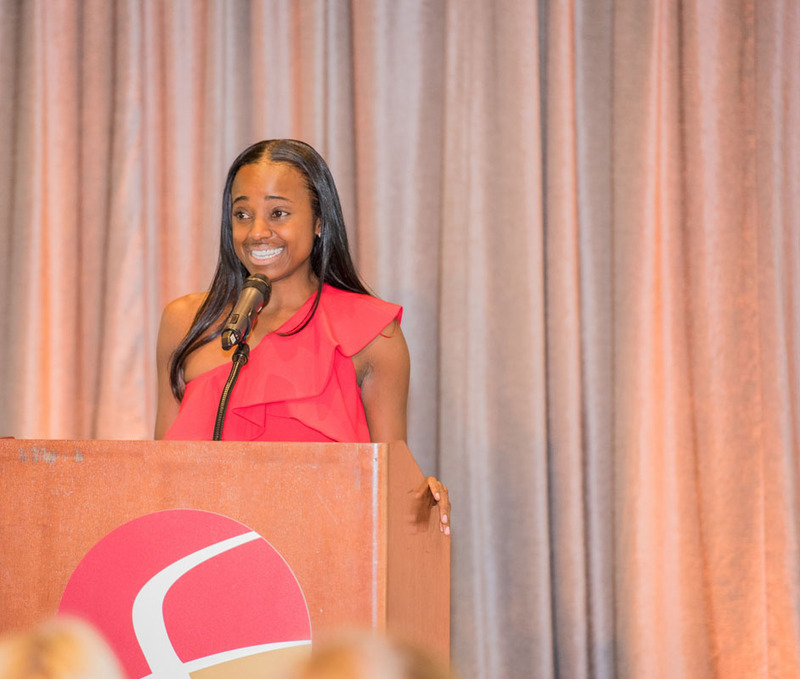 2017 Alumna Natalie Neris served as emcee for the evening. 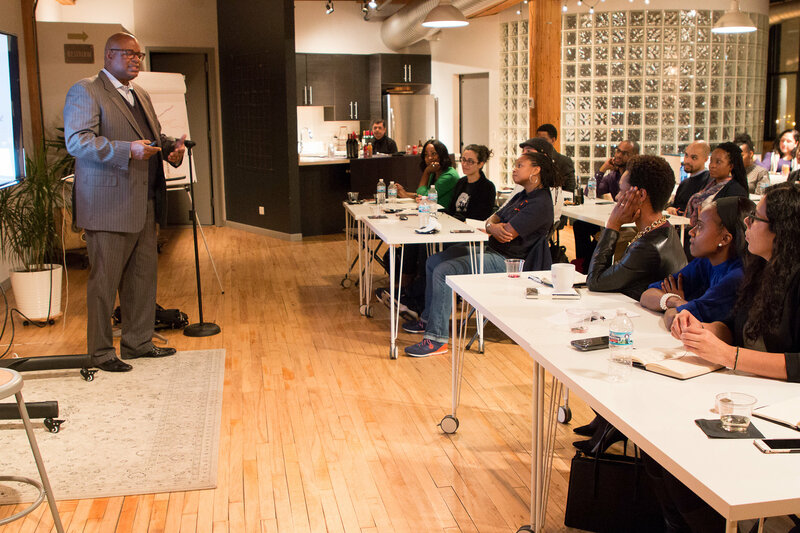 The Surge Angels program consisted of a series of four sessions, in which the participants gathered to engage with experts in business growth and social impact, such as Maslow Development founder and Surge Faculty member Derwin Sisnett and Megan Kashner, an assistant professor and Director of Social Impact at Northwestern University’s Kellogg School of Management. 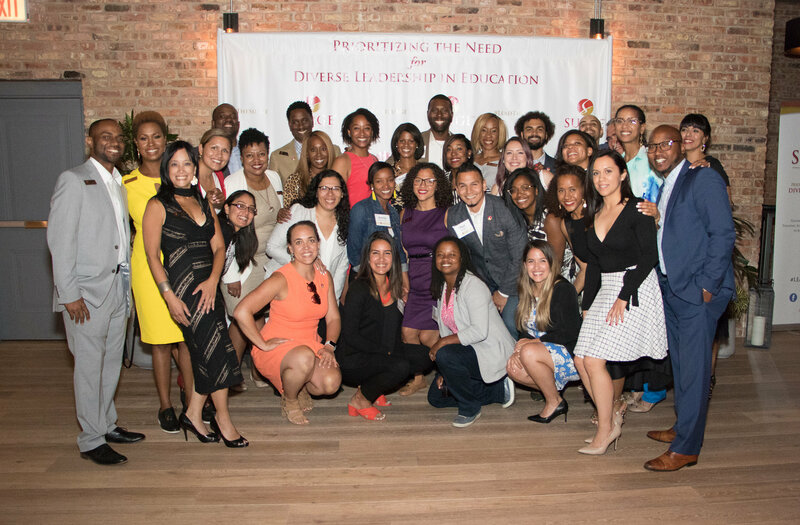 This was truly a celebration of our movement and we are proud to support our alumni in turning their dreams into impact. 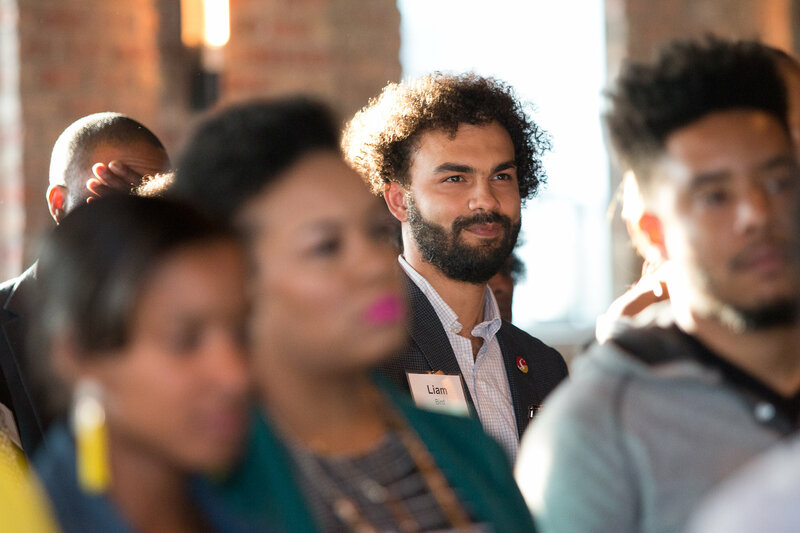 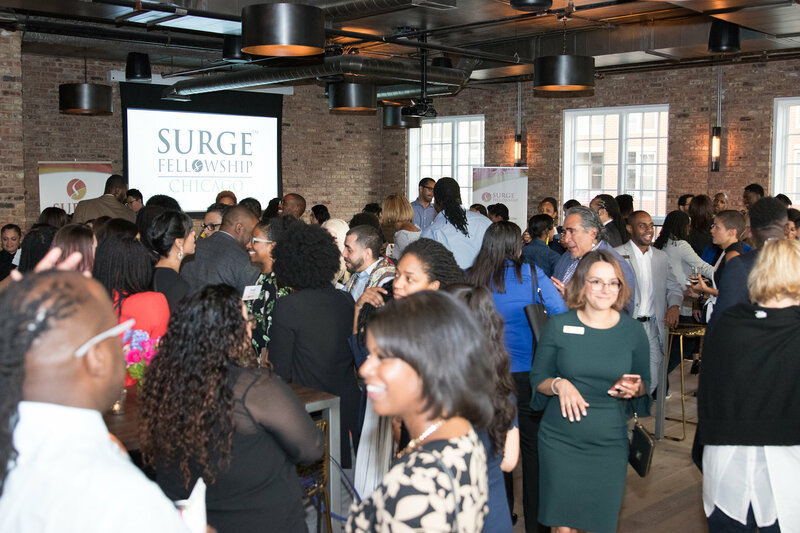 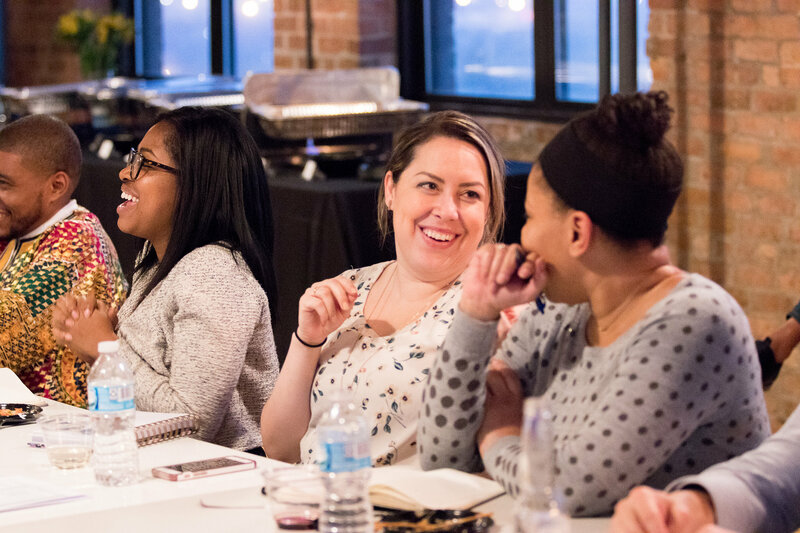 The Surge Fellowship Chicago began recruitment season with a mixer, inviting prospective fellows to connect with the Surge community and learn more about this movement from the people who helped build it. 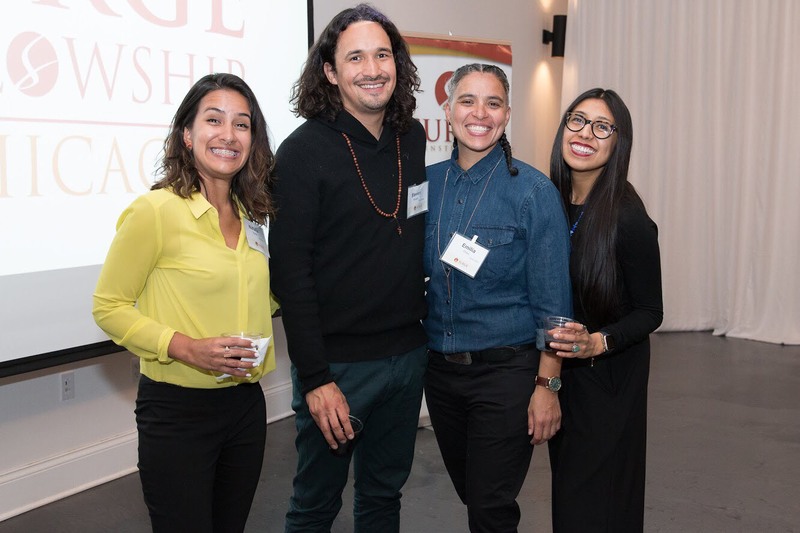 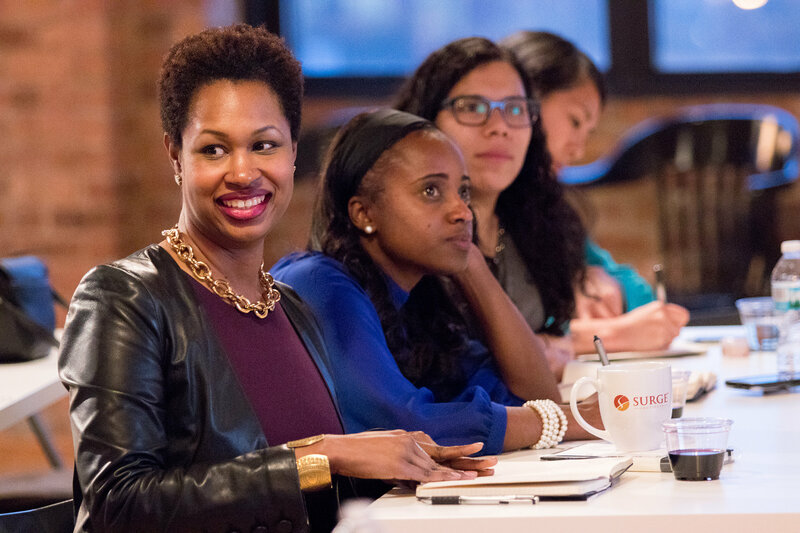 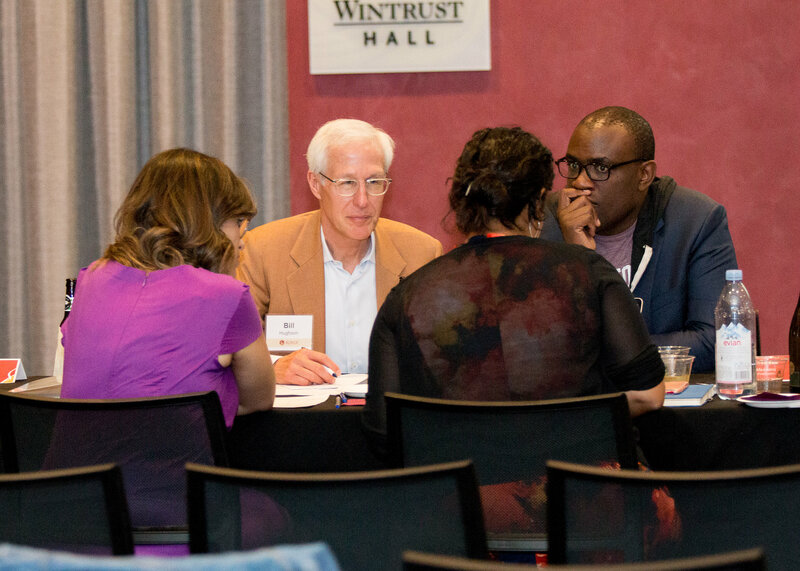 If you are interested in applying for the 2019 Surge Fellowship Chicago, please visit our Become a Fellow page to learn more. 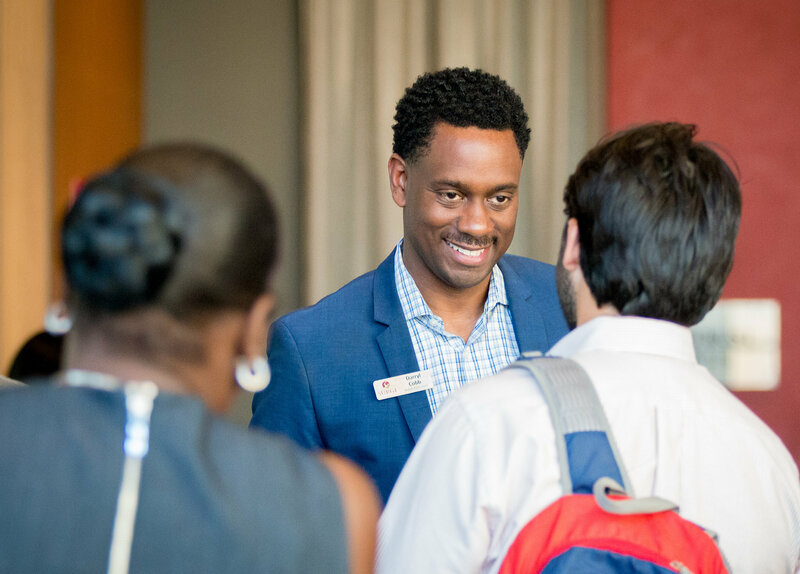 You can also register for one of our recruitment webinars to learn more about the application process. 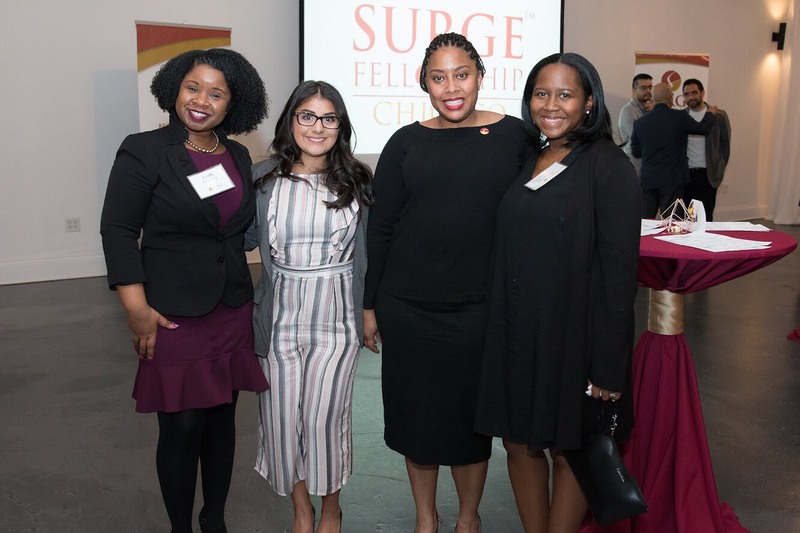 Applications for the 2019 Surge Fellowship May 14, 2018. 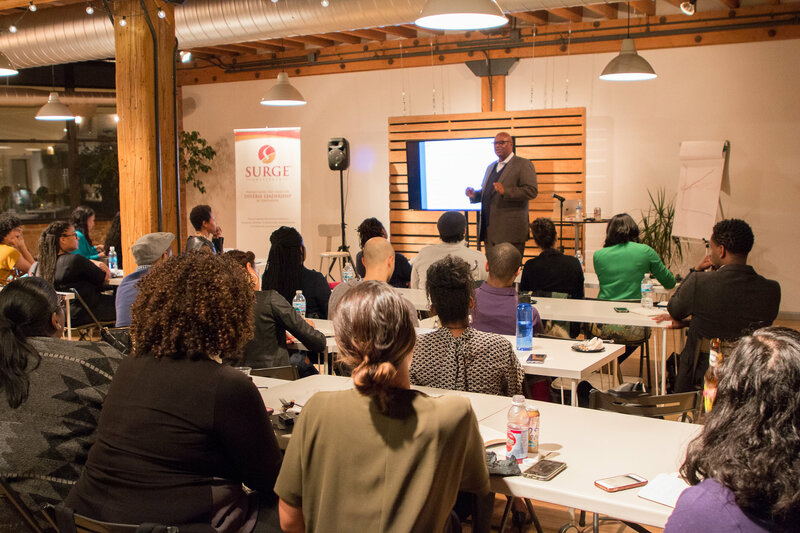 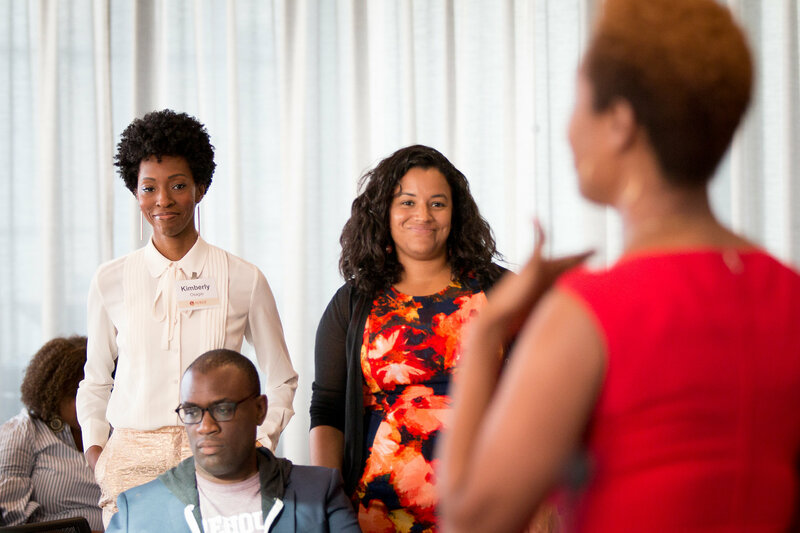 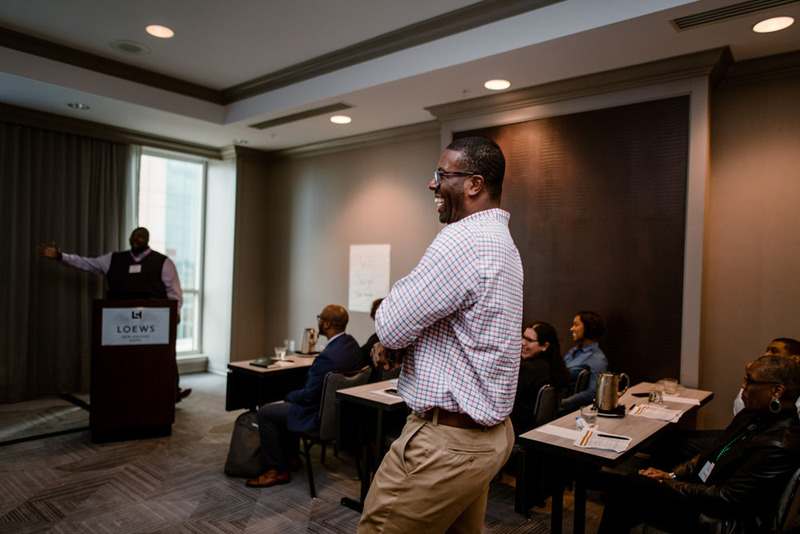 In our continued mission to unite and elevate leaders of color, the Surge leadership team came together with more than 40 Surge Fellows and Alumni to learn how to build wealth from financial guru Stuart A. Taylor, II. 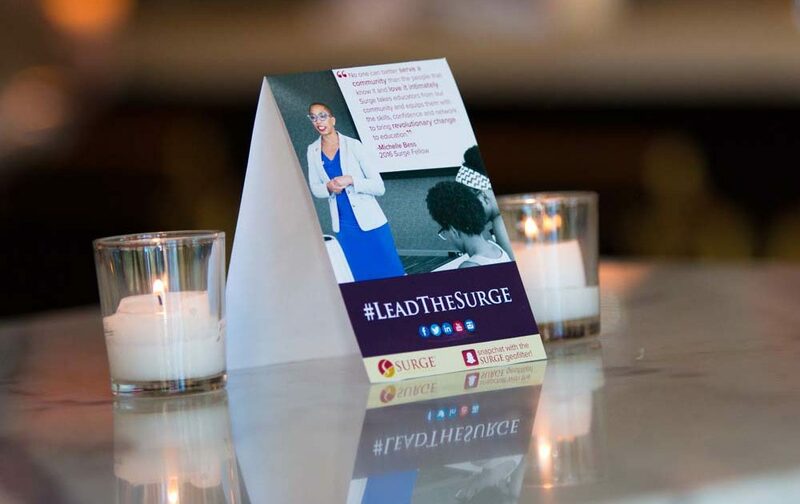 It was a relaxed and informal evening with Taylor, in which the Surge community asked thoughtful questions about how to build wealth and Taylor provided honest answers and proven strategies for success. 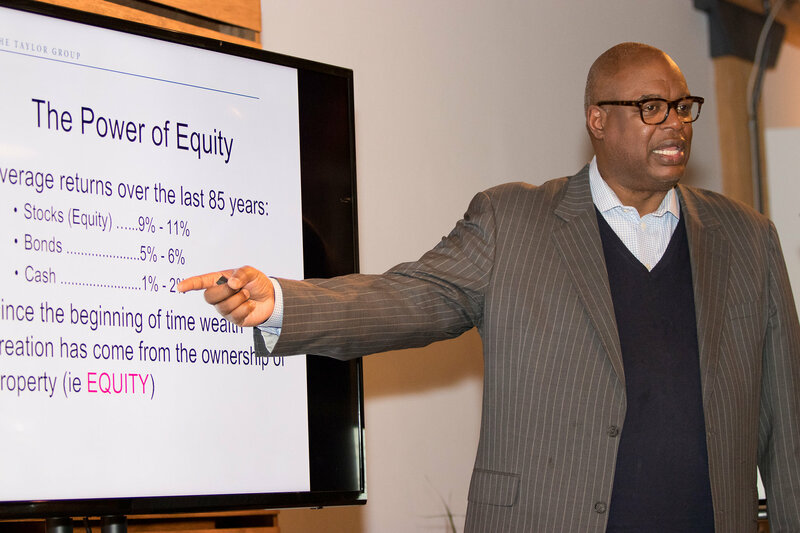 Stuart A. Taylor II has led a successful career in investment banking, proven by his execution of more than 50 major transactions in eight different countries. 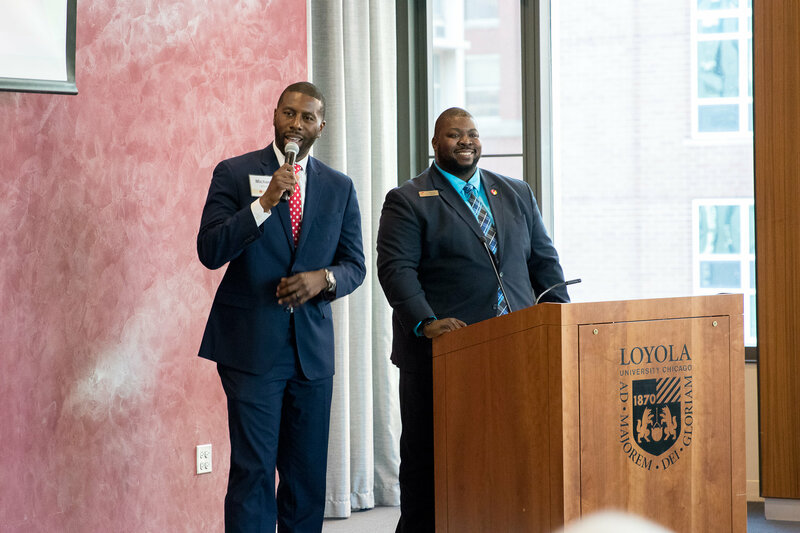 From 1999 to 2001, he served as Senior Managing Director of Bear, Stearns & Co. Inc., and Taylor serves as Chief Executive Officer and Chairman of the Board of Analytic Innovations, LLC. 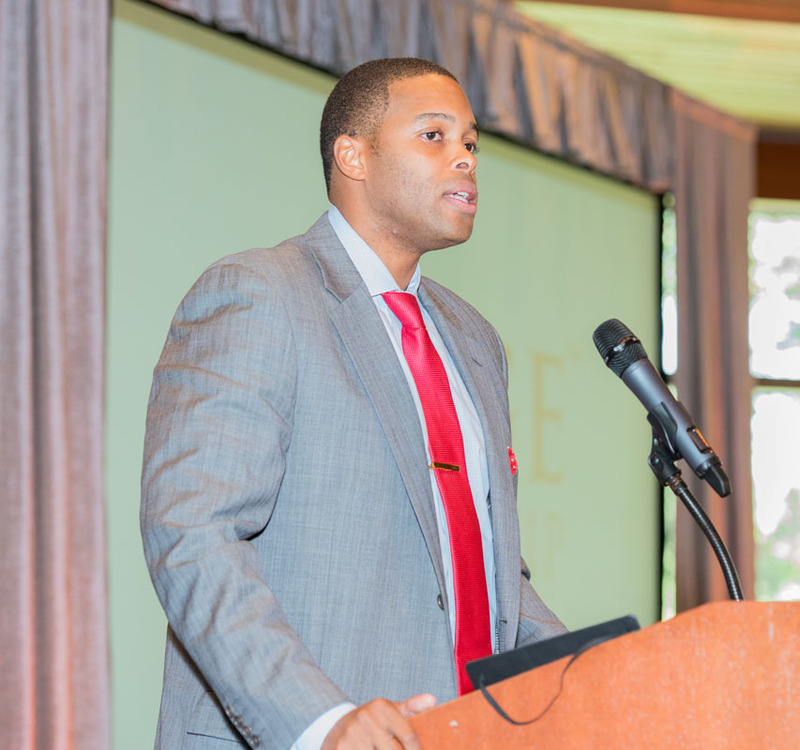 Taylor has been the Chief Executive Officer of The Taylor Group LLC since June 2001. 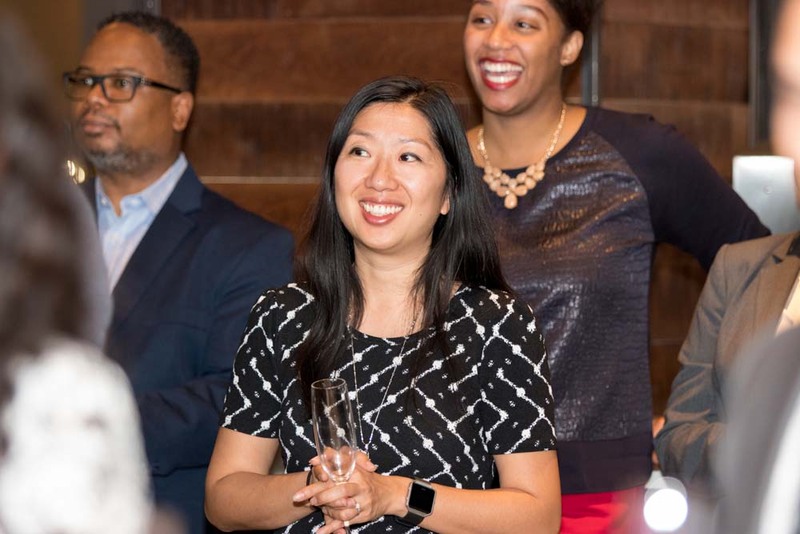 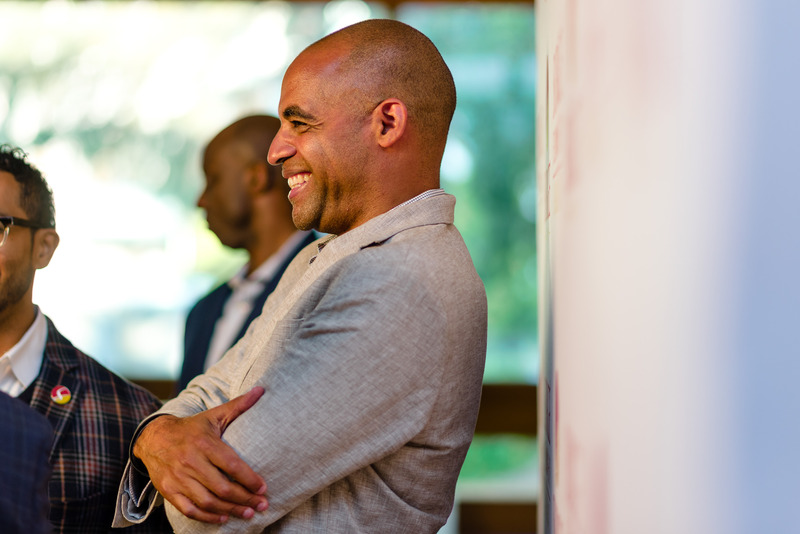 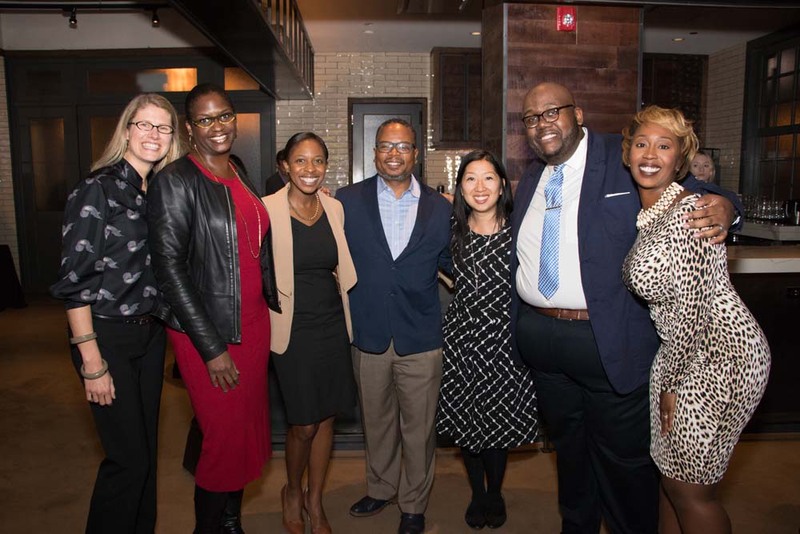 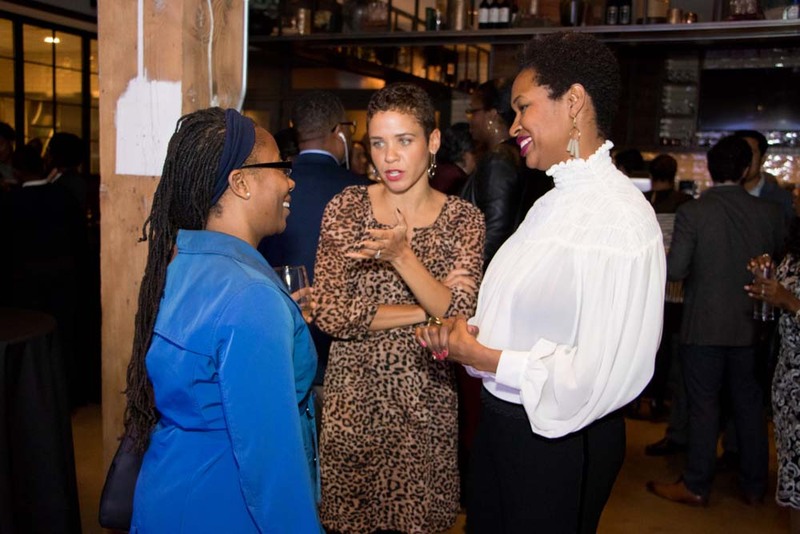 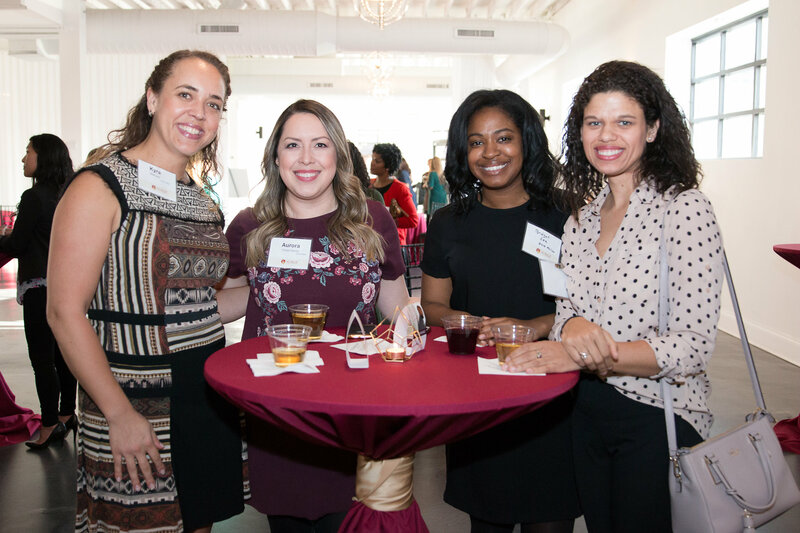 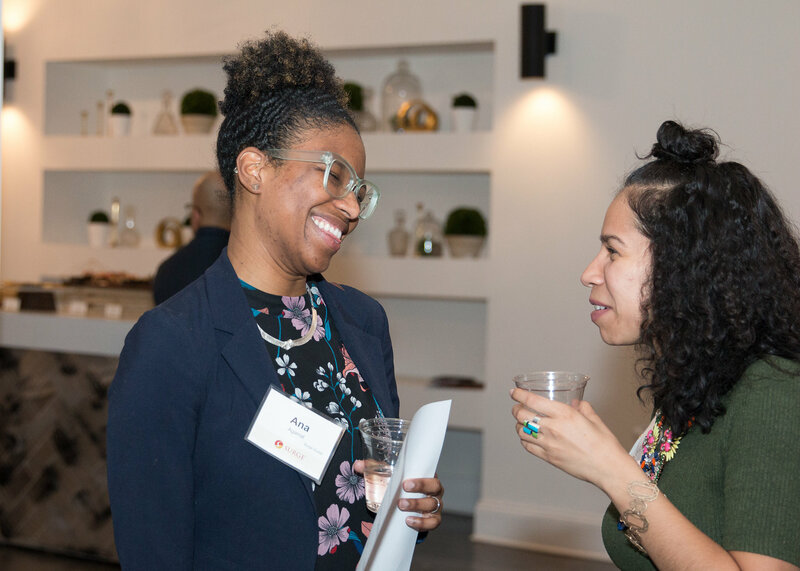 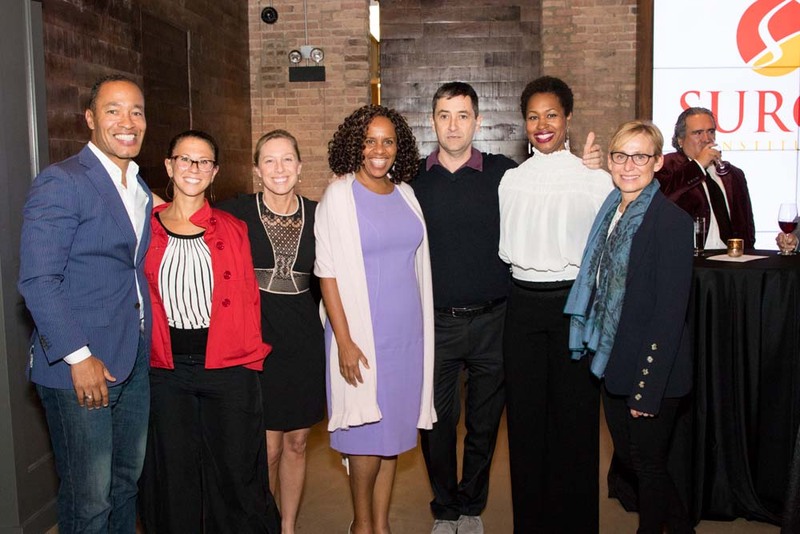 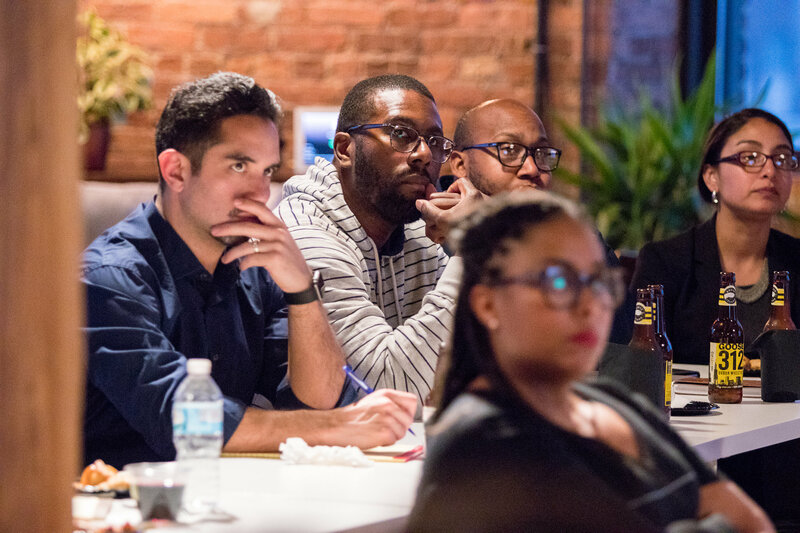 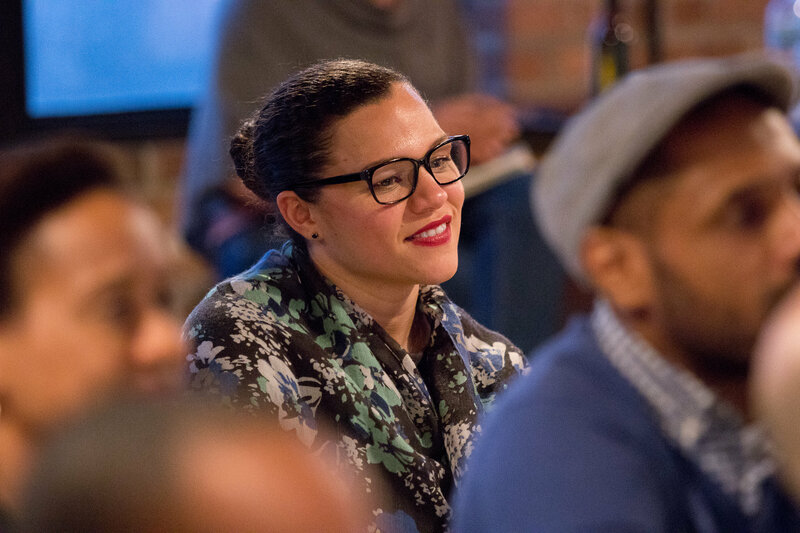 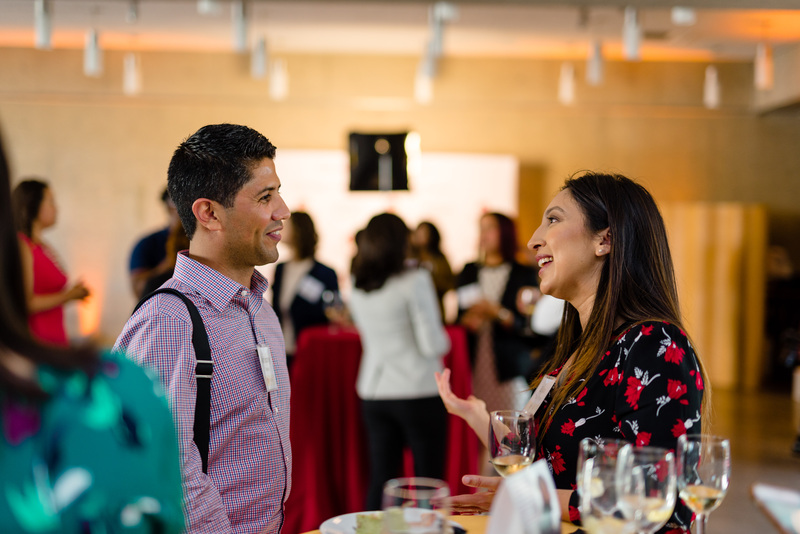 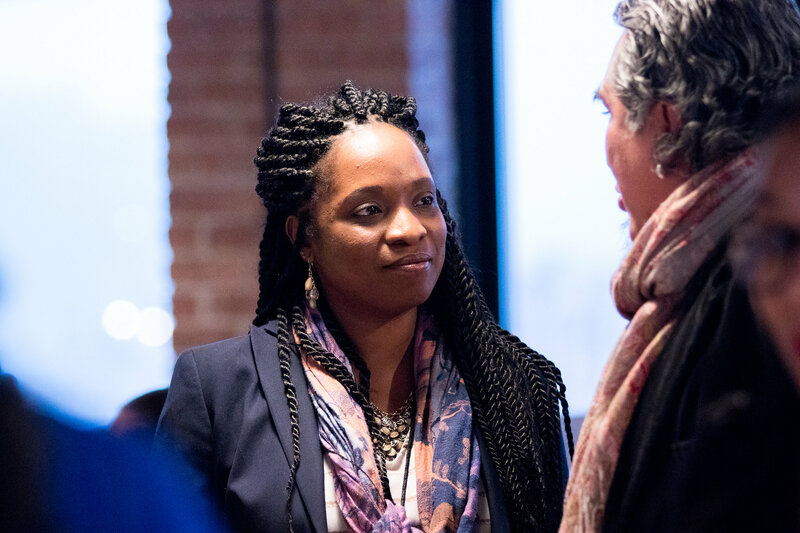 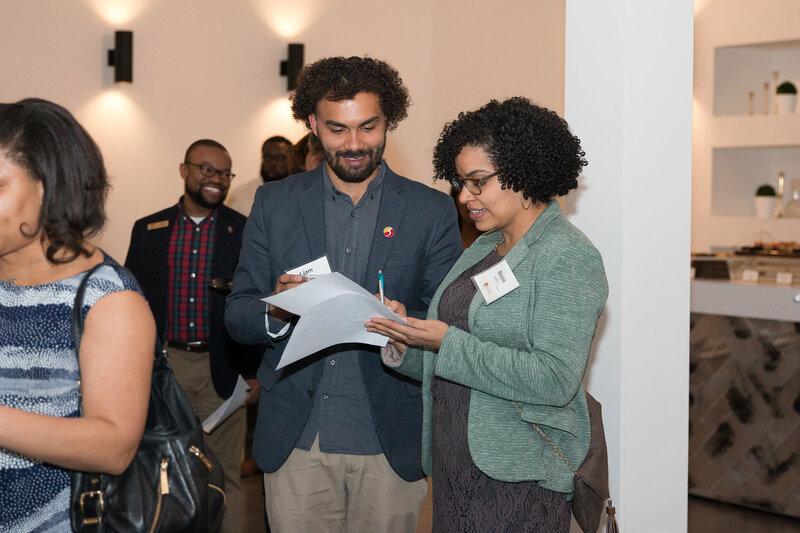 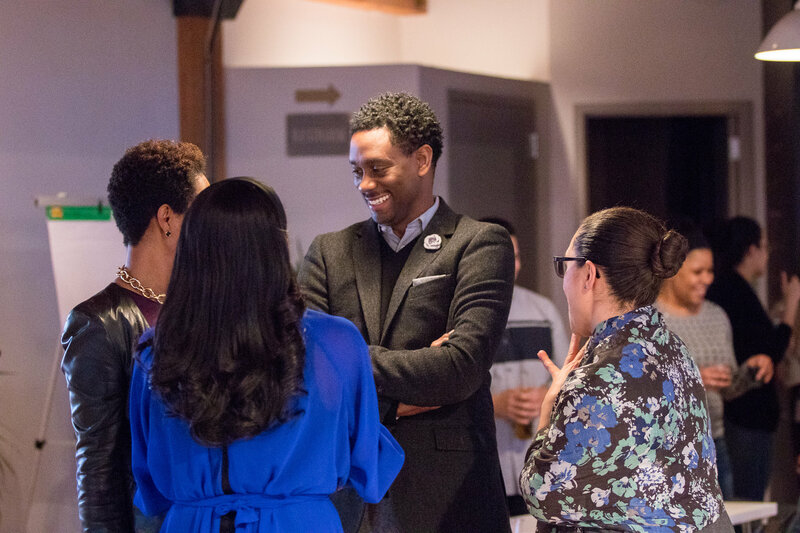 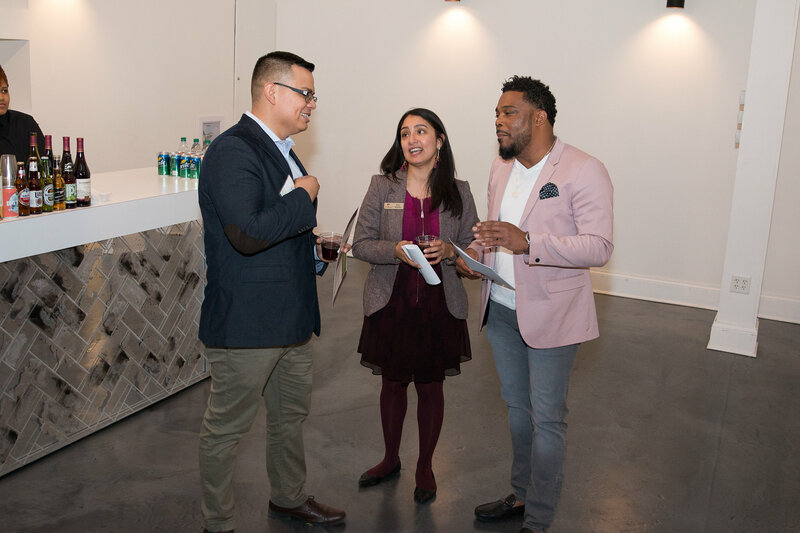 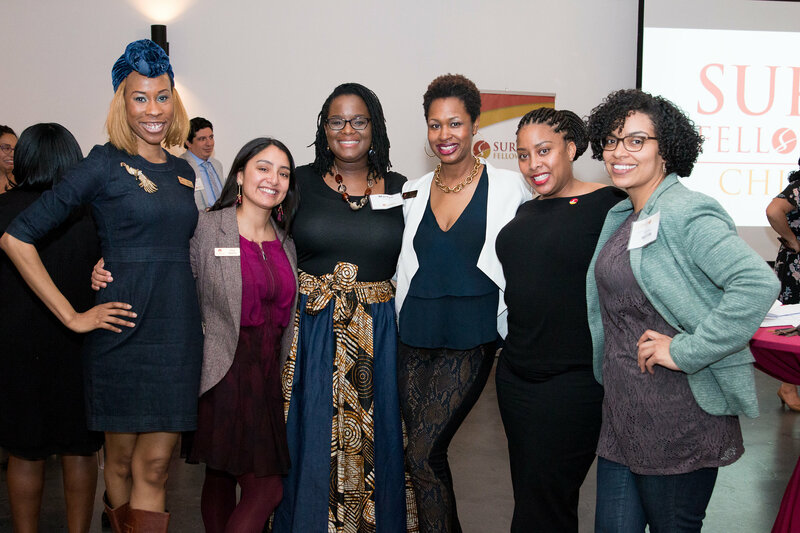 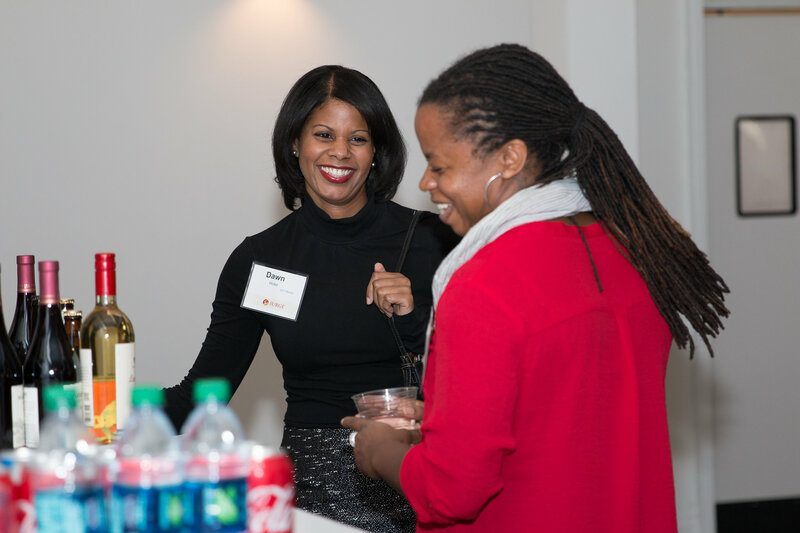 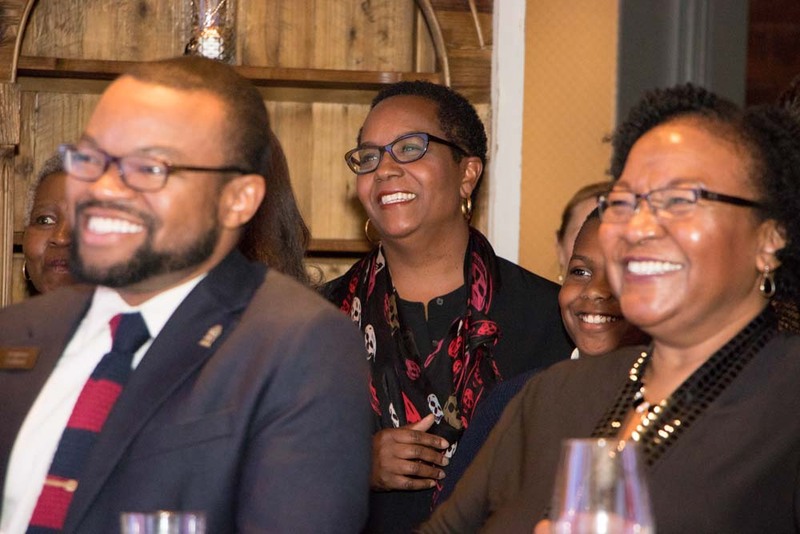 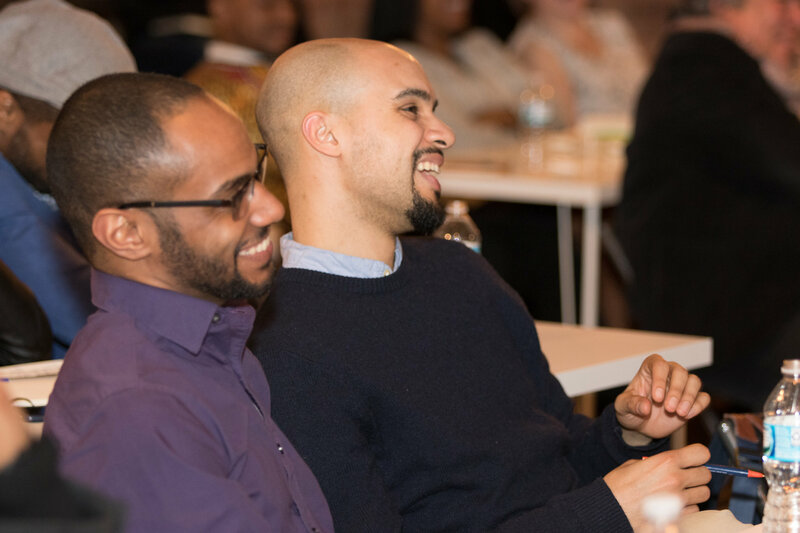 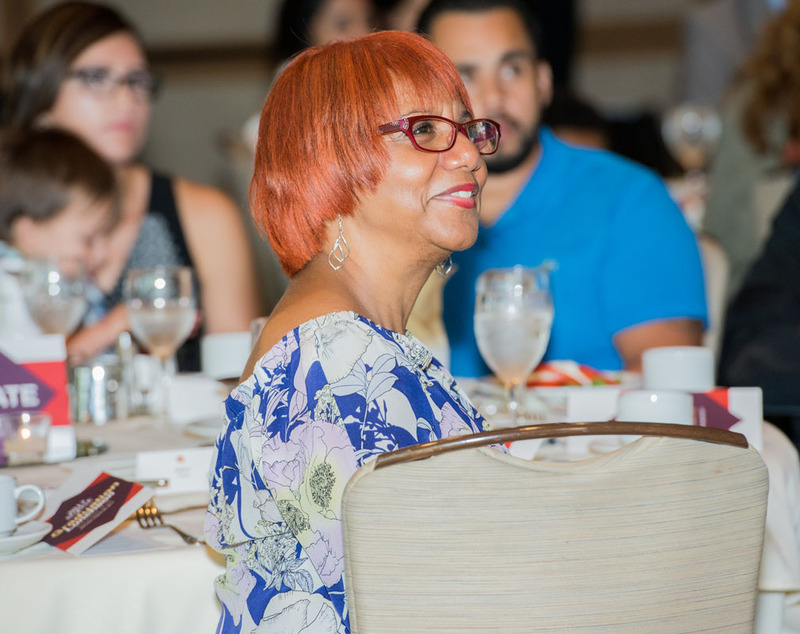 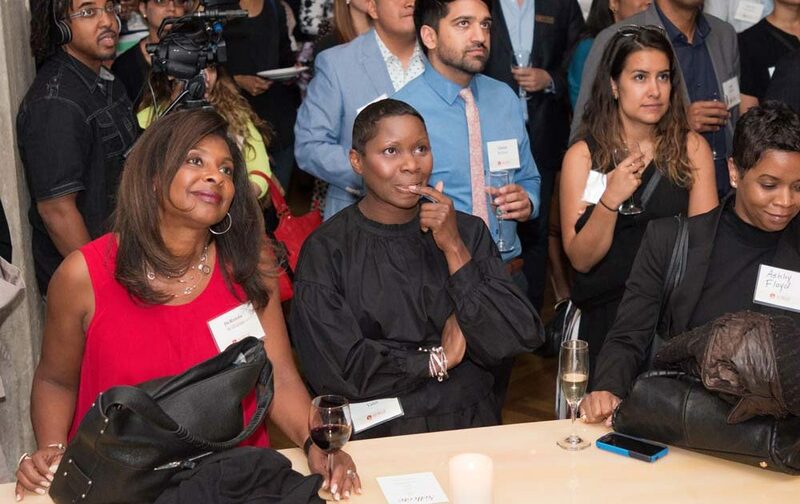 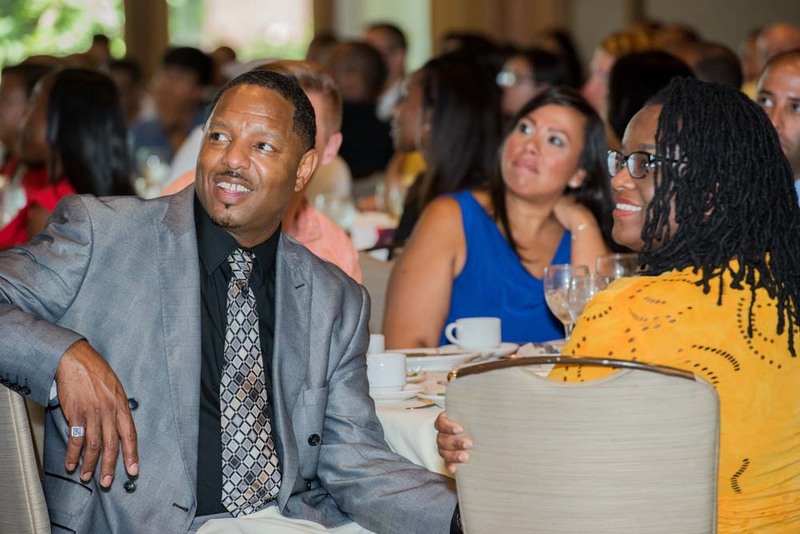 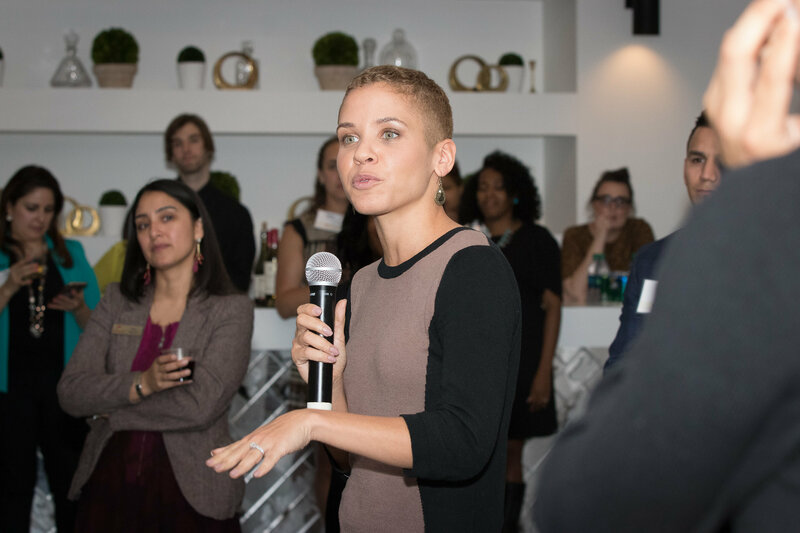 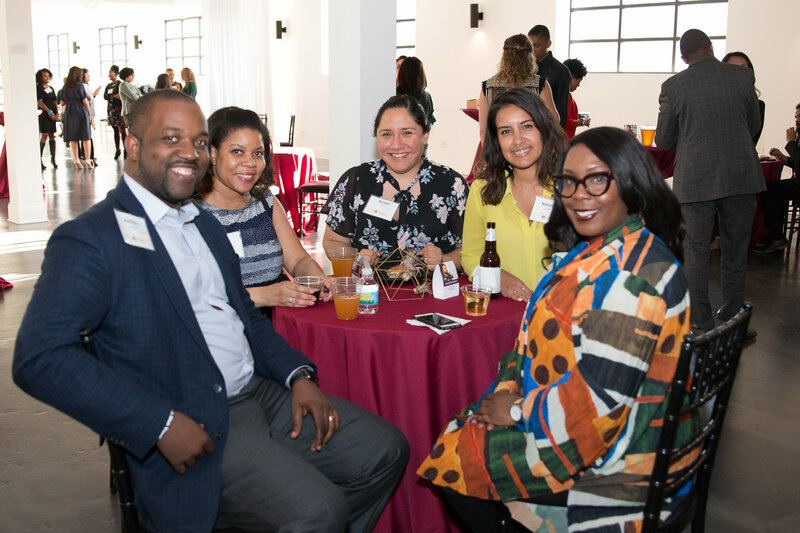 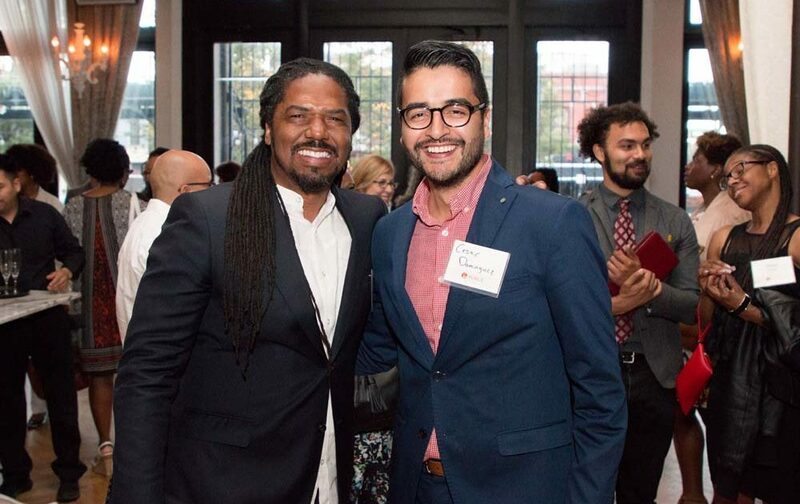 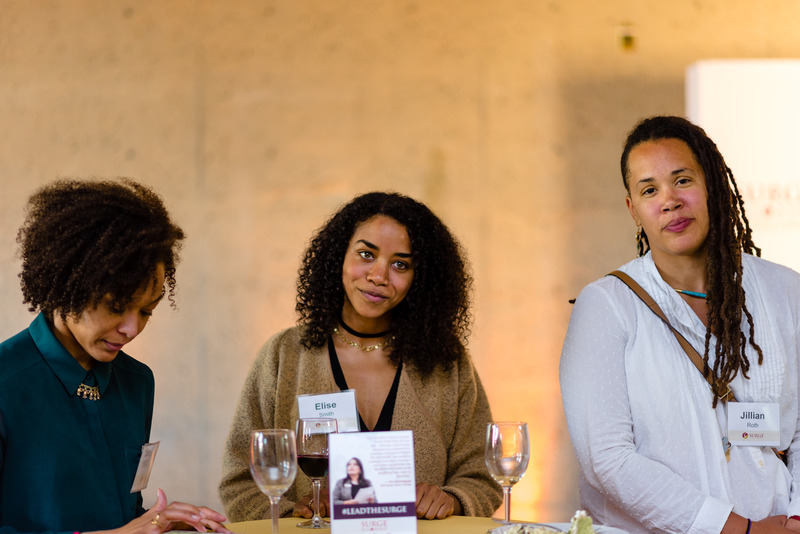 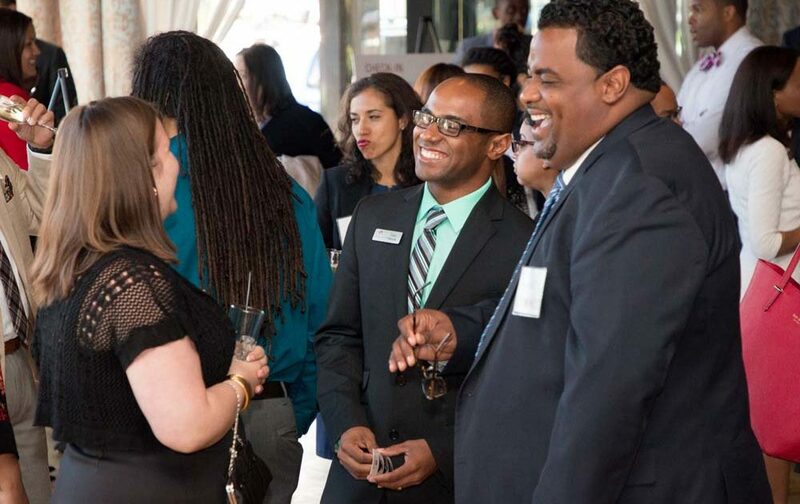 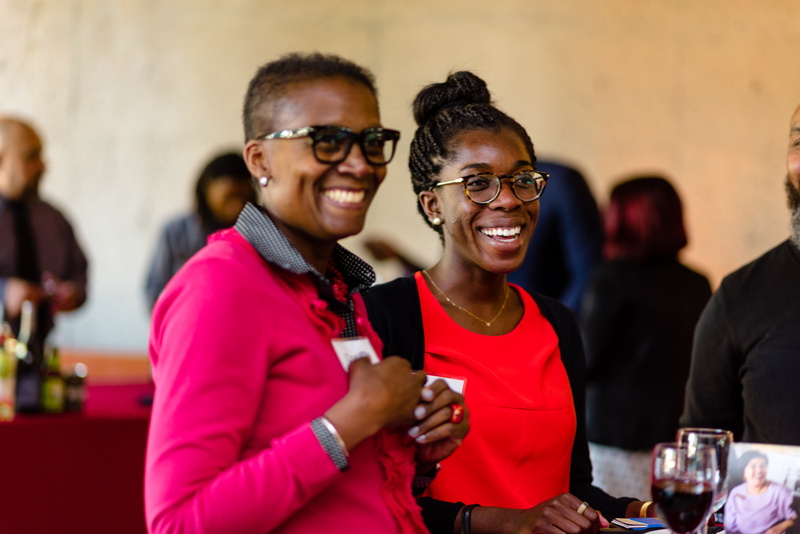 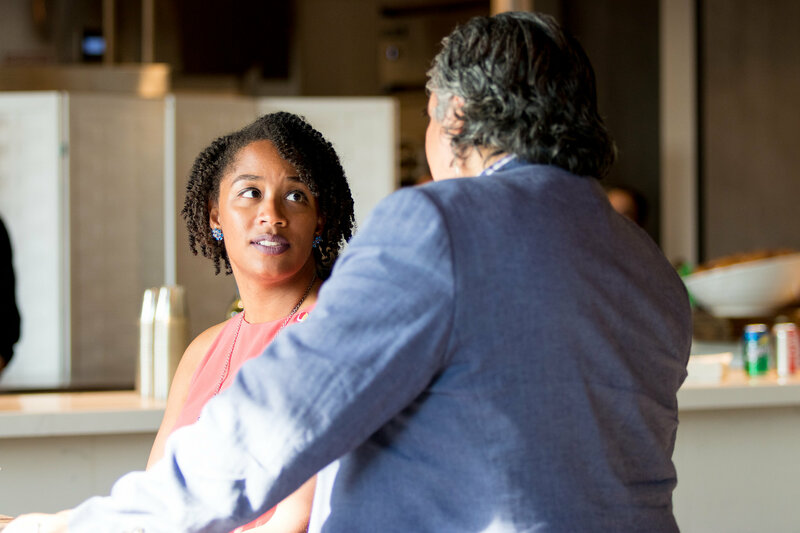 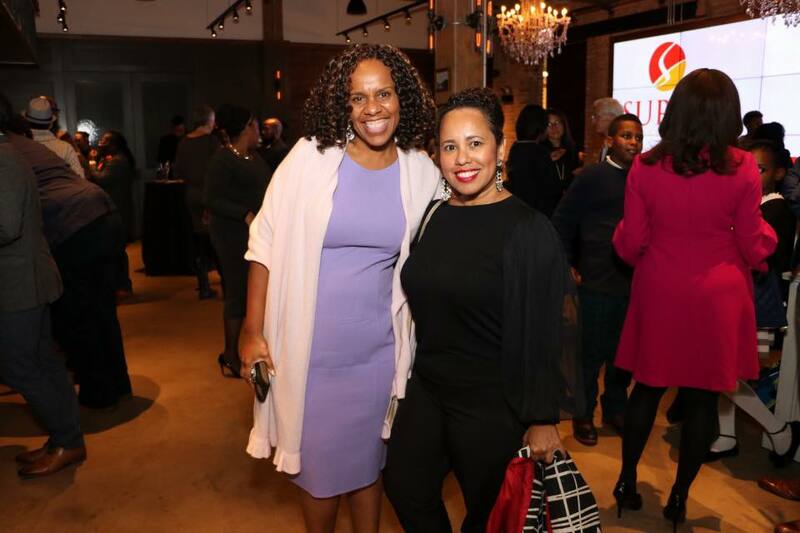 On Thursday, October 26, the Surge community convened to celebrate and share about the ongoing effort to expand diversity in the education leadership pipeline. 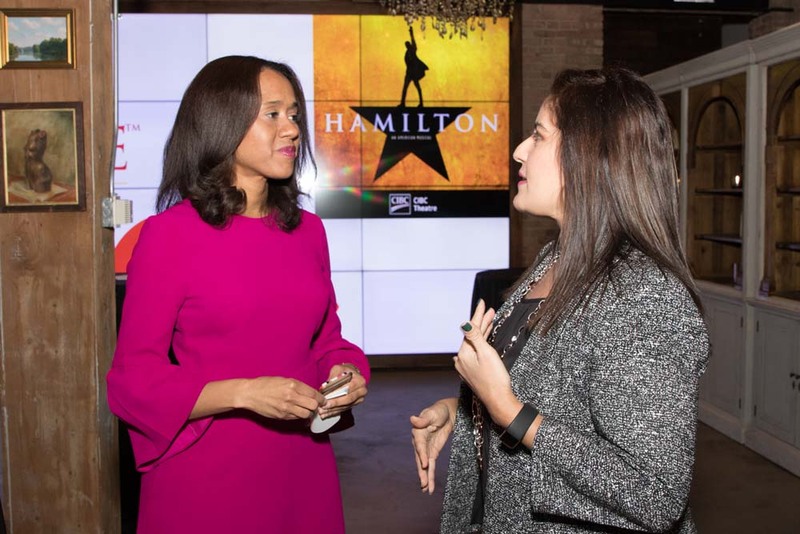 Part of that celebration included attending Broadway in Chicago’s production of Hamilton as a family! 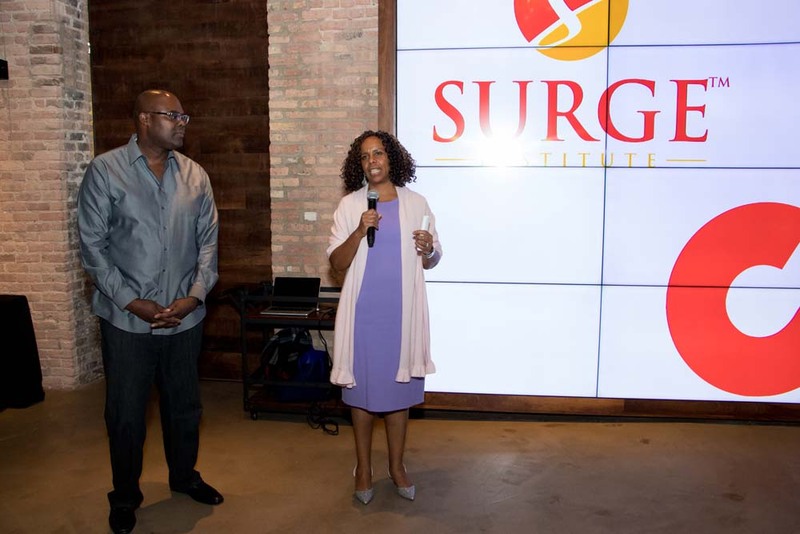 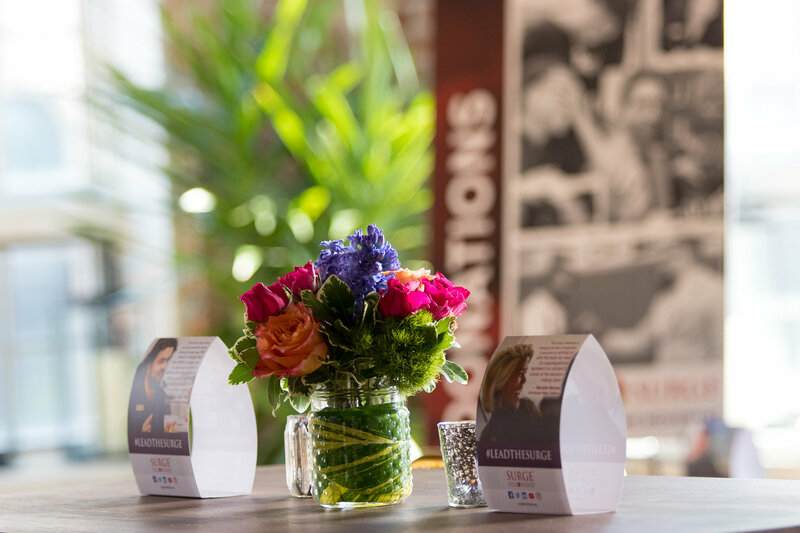 The evening was the result of fundraising and awareness effort in partnership with Broadway in Chicago and made possible by a generous donation from the Surge Institute Leadership Circle: Darryl and Angela Cobb, Nneka Rimmer and the Cleveland Avenue Foundation for Education. 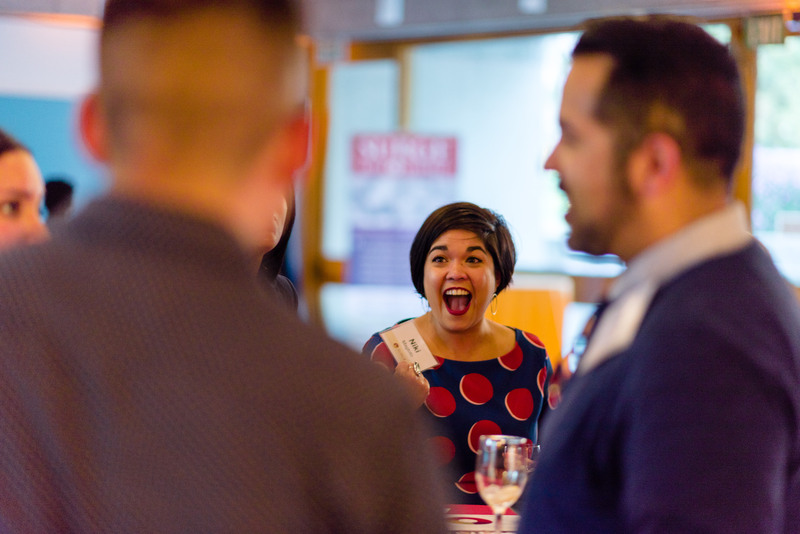 We did more than raise thousands of dollars toward this work. 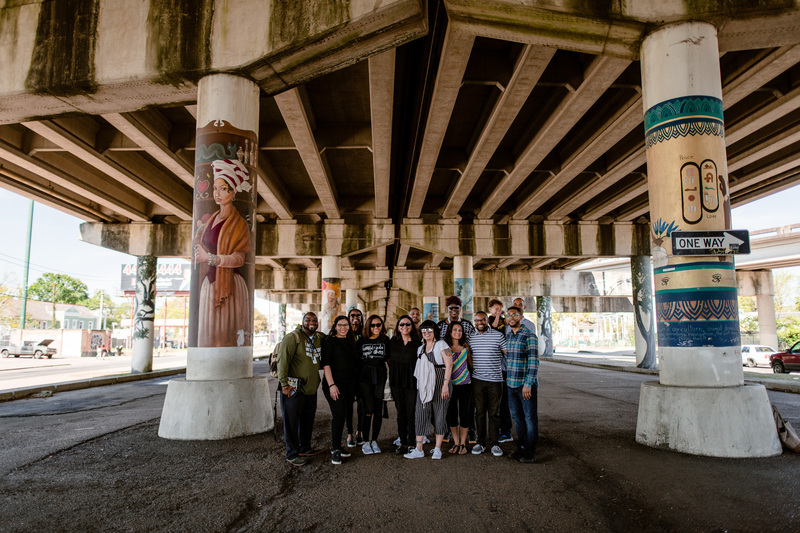 We built bridges and grew community. 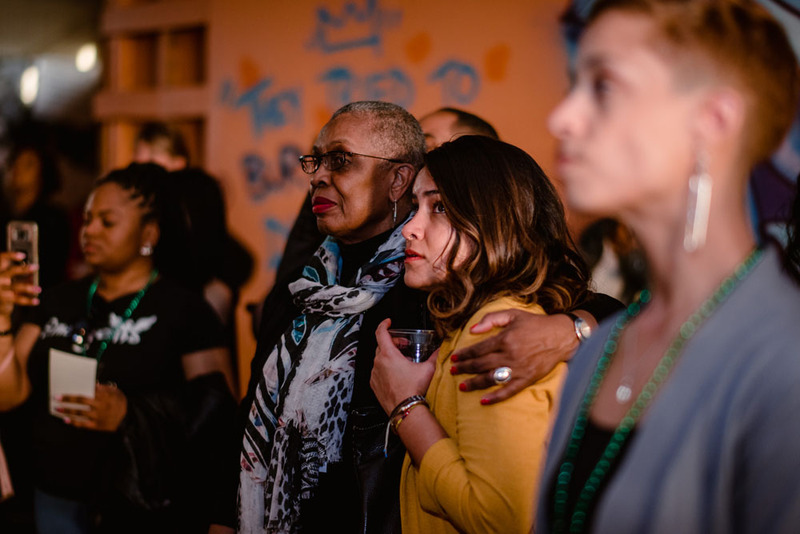 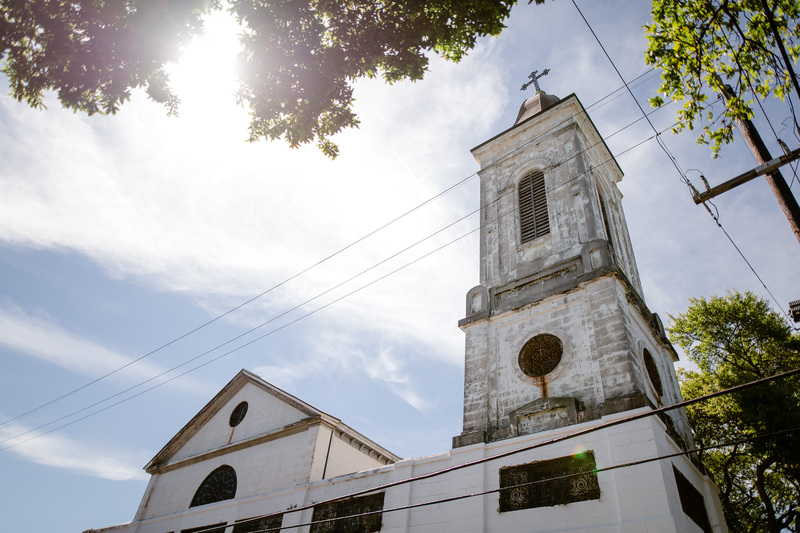 The evening, in many ways, encapsulated the mission, the work and the significance of replacing the status quo with voices and cultures that understand the communities being served. 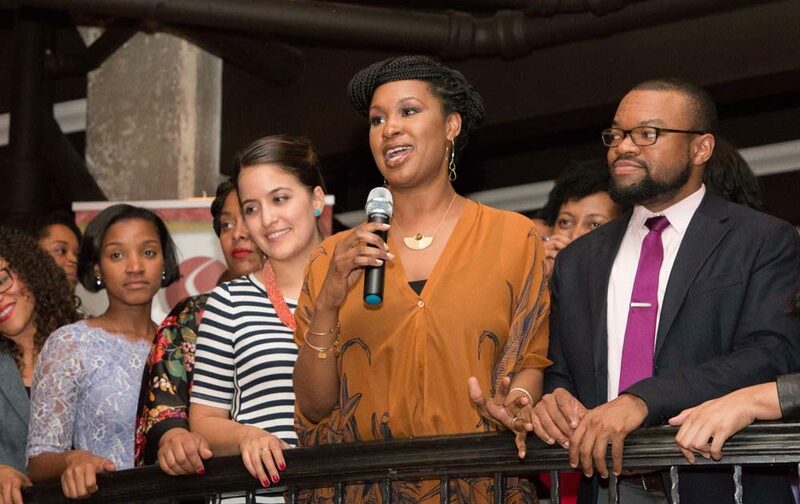 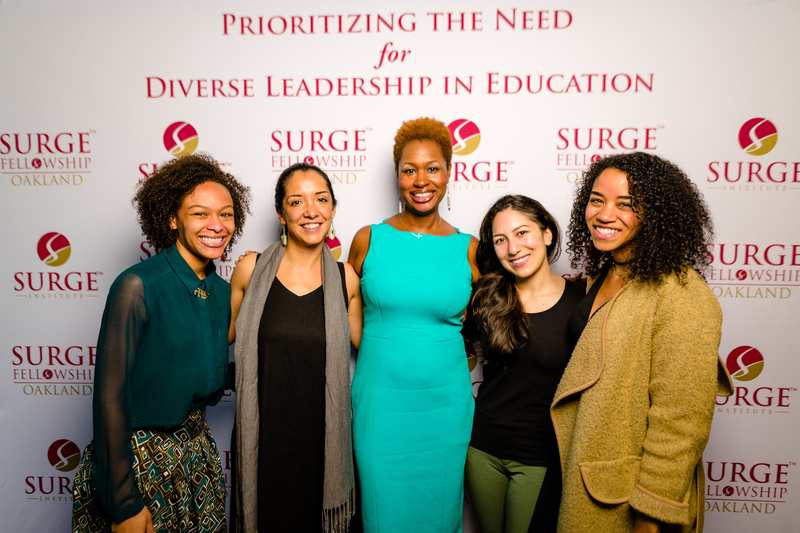 If you would like to support Surge and the work we do to bring more leaders of color to the decision making tables in education, please make a donation. 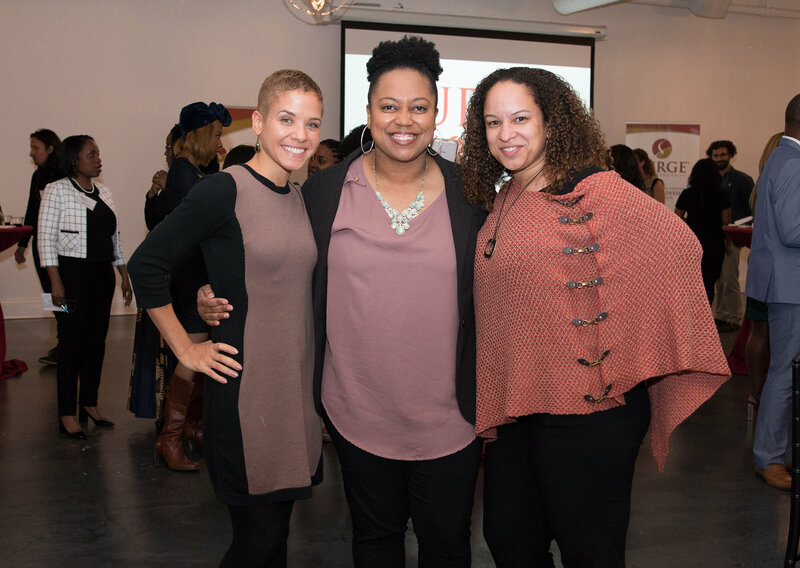 Thank you to all who attended and supported The Power of Us! 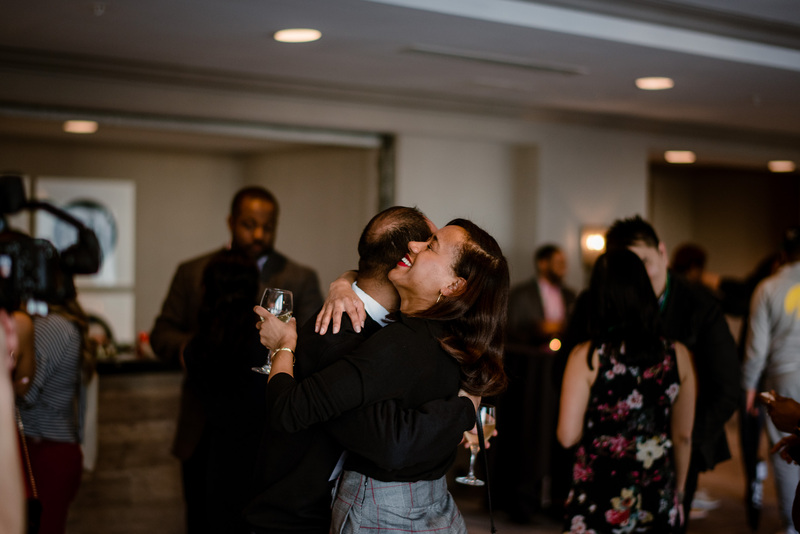 Their moment has come! 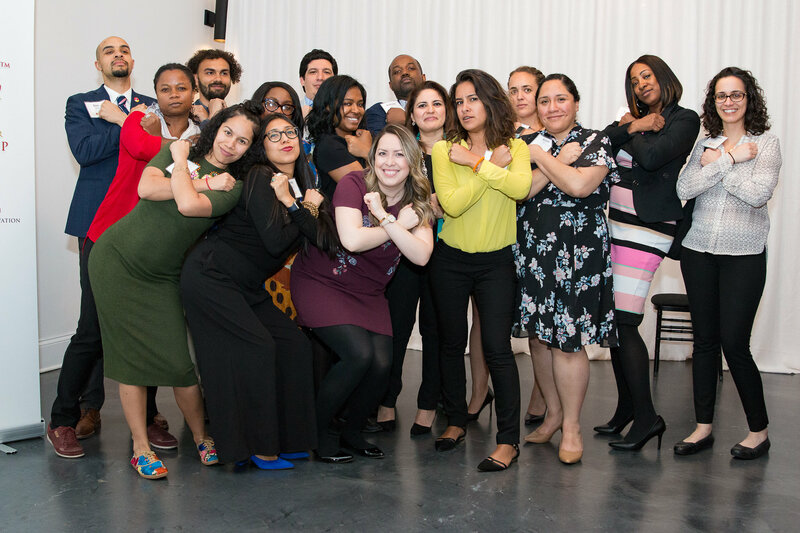 We proudly announce our 2017 Surge Fellowship graduates…The Guardians! 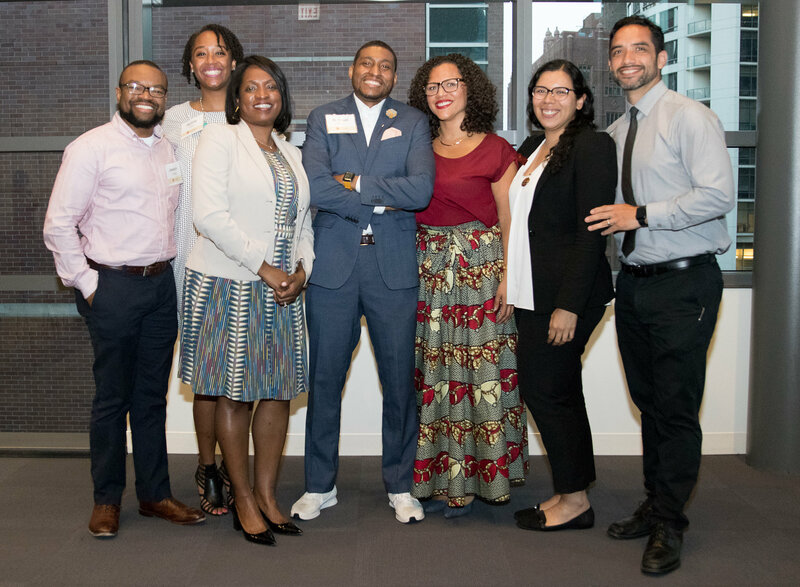 After a year of empowerment, enlightenment and engagement, the Fellowship ended with a fireside chat with Sylvia Puentes as well as inspiring and deeply impactful lessons from education leaders and friends of Surge, including Dr. Howard Fuller, Dr. Andre Perry, Ernesto Matias and Terra Winston. 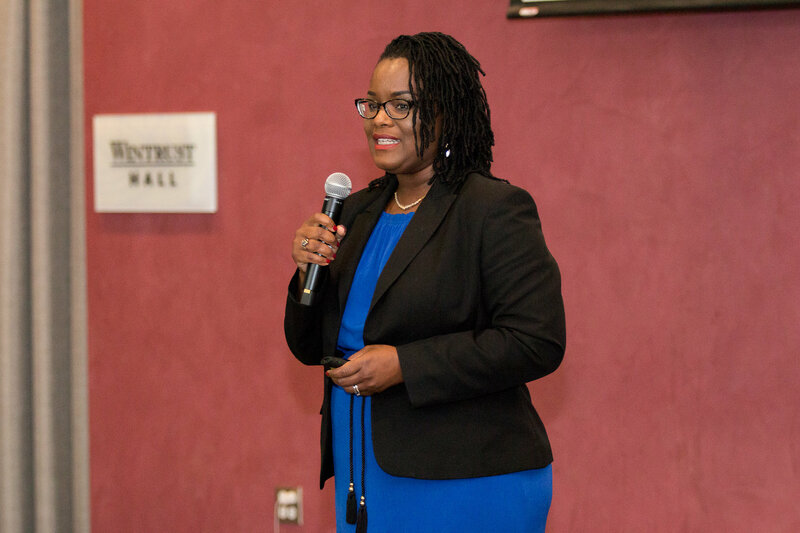 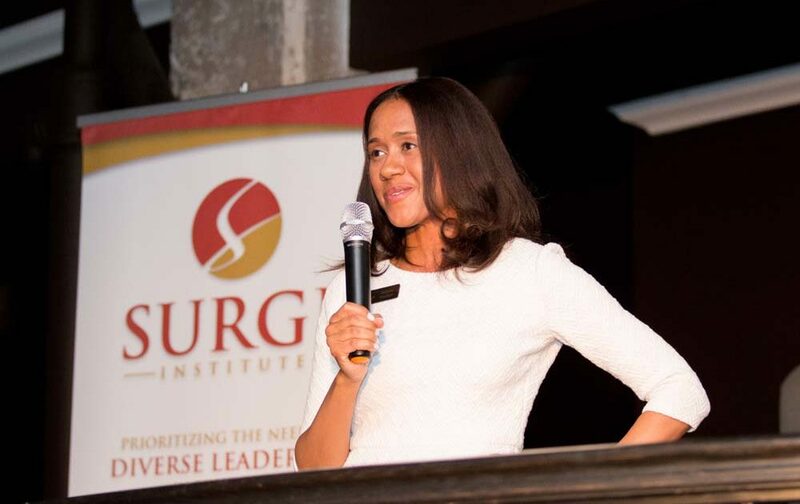 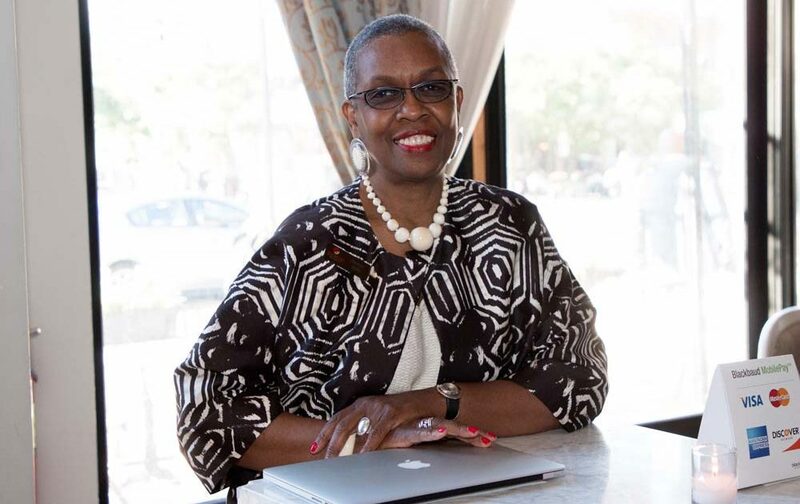 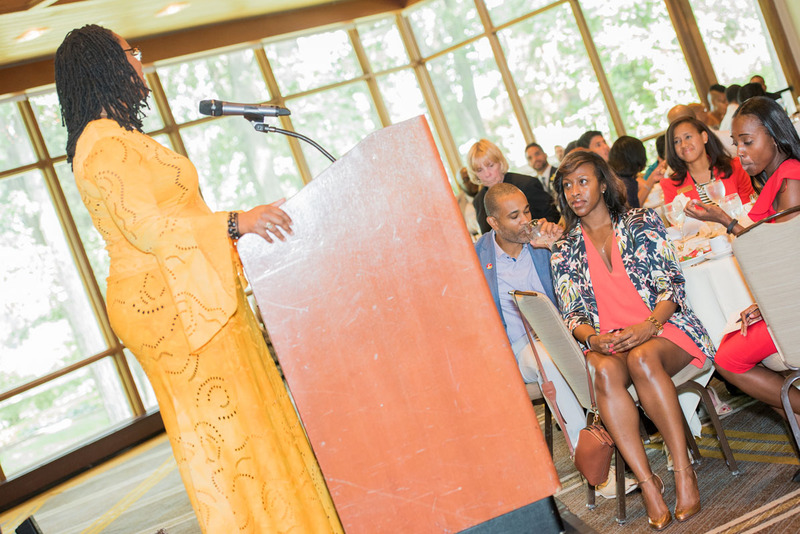 Also providing a charge to the graduates was 2016 Surge Alum Marilyn Rhames, who shed light on her transformative Surge experience and her subsequent upward trajectory as a voice in education thought leadership. 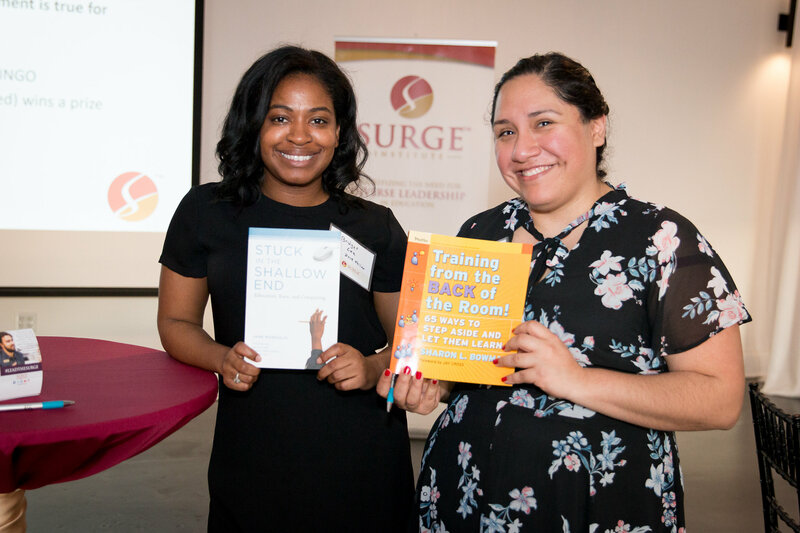 Marilyn spoke of taking her own Teachers Who Pray movement to the next level and attributed her amazing strides to the lessons she learned as a Surge Fellow. 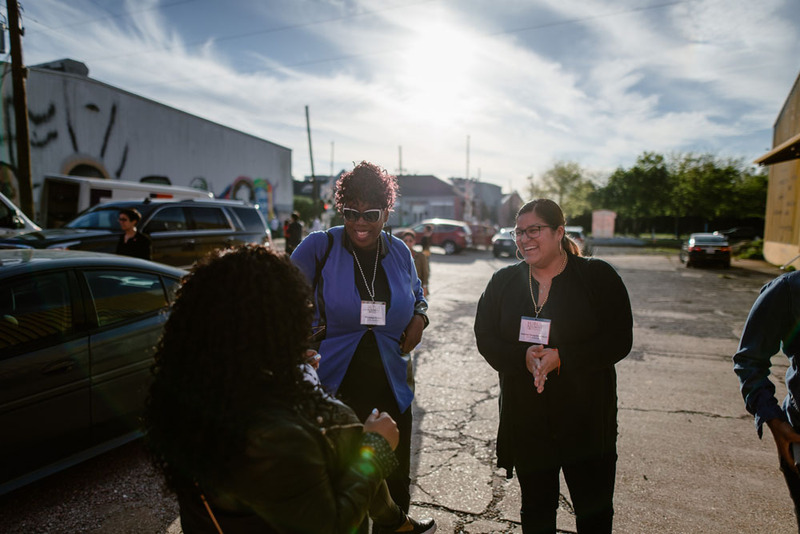 The Guardians are onto the next step — changing systems to drive those improved outcomes —and your support of this movement has helped make it so. 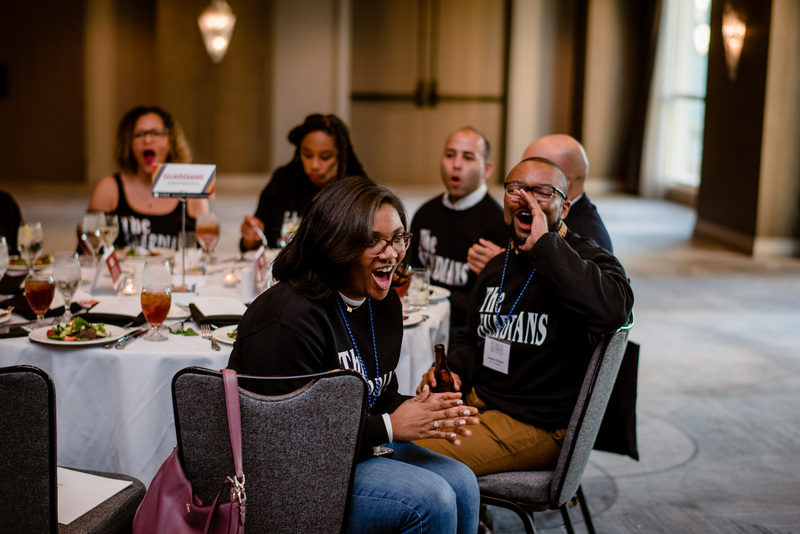 Our young people are not simply in good hands with the Guardians; they are in authentic, excellent, and prepared hands, as well. 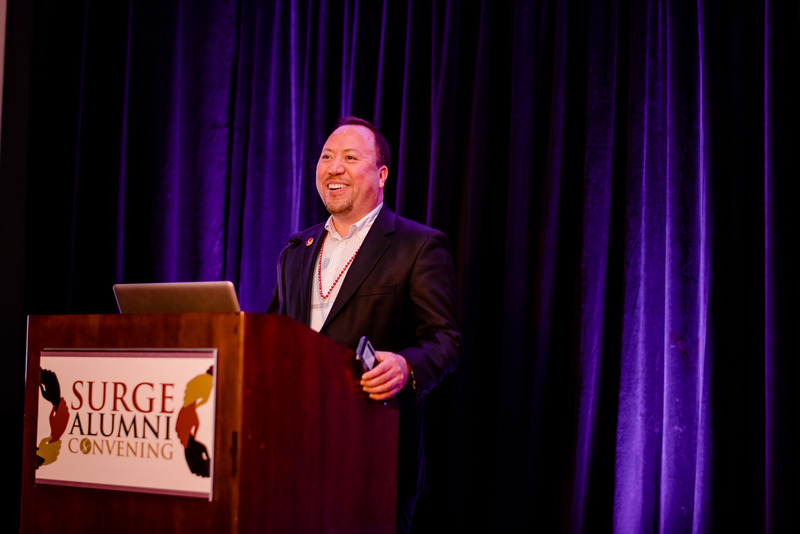 https://www.surgeinstitute.org/wp-content/uploads/2015/04/logo.png 0 0 Chris Paicely https://www.surgeinstitute.org/wp-content/uploads/2015/04/logo.png Chris Paicely2017-08-30 16:45:082018-11-05 16:58:392017 Surge Fellows Graduate! 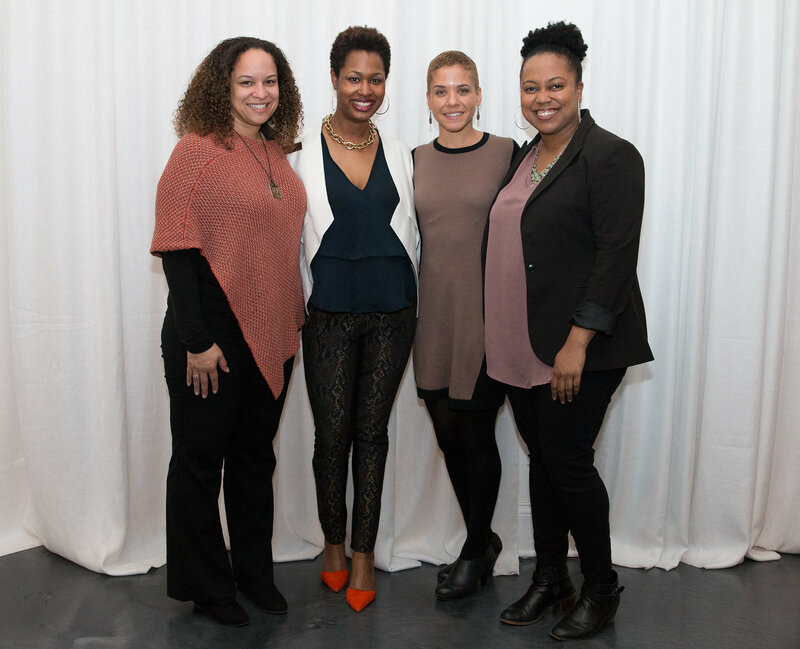 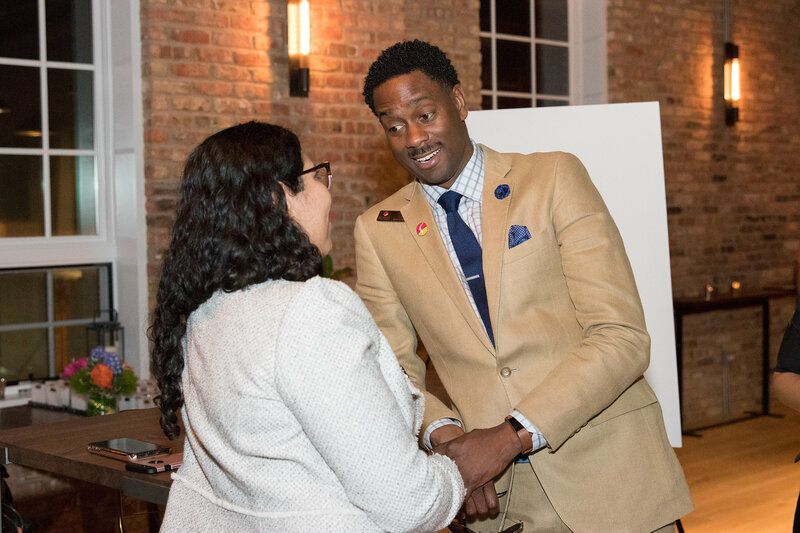 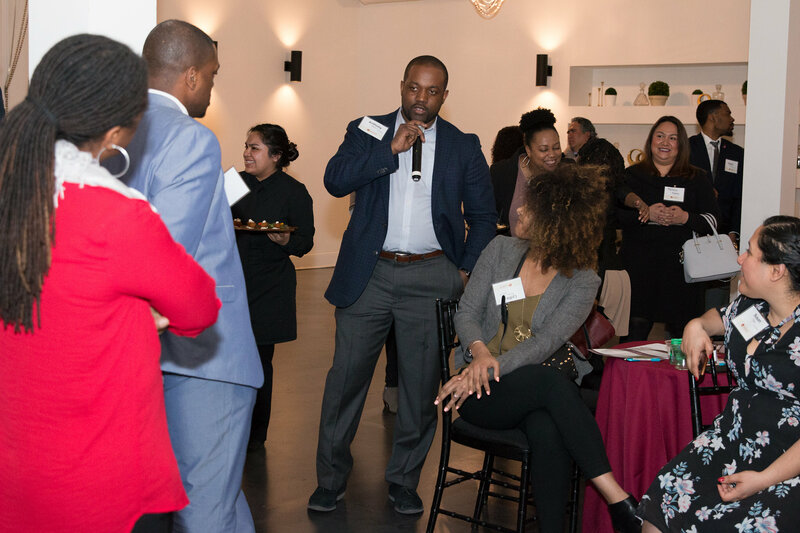 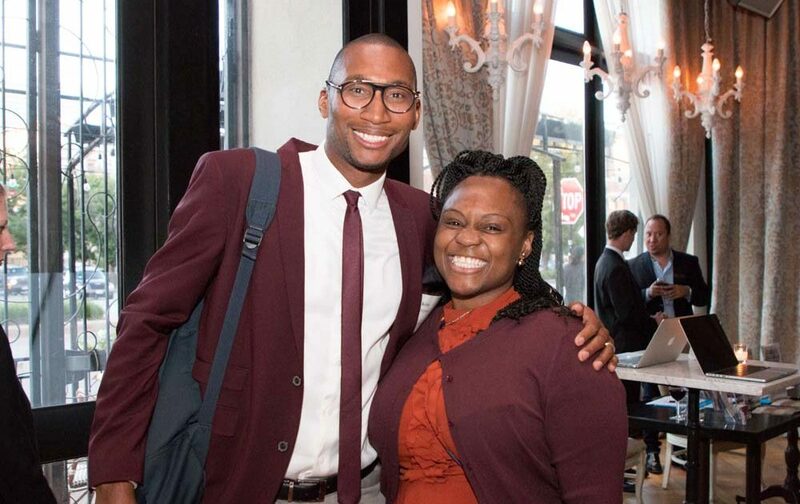 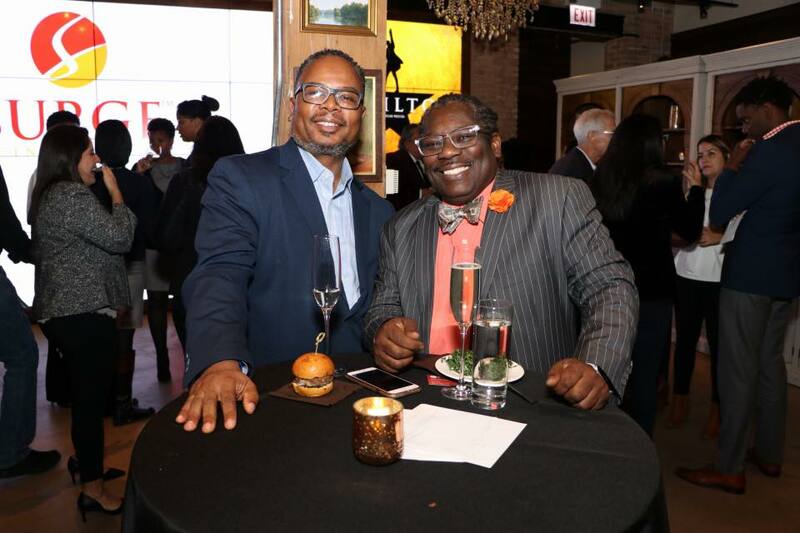 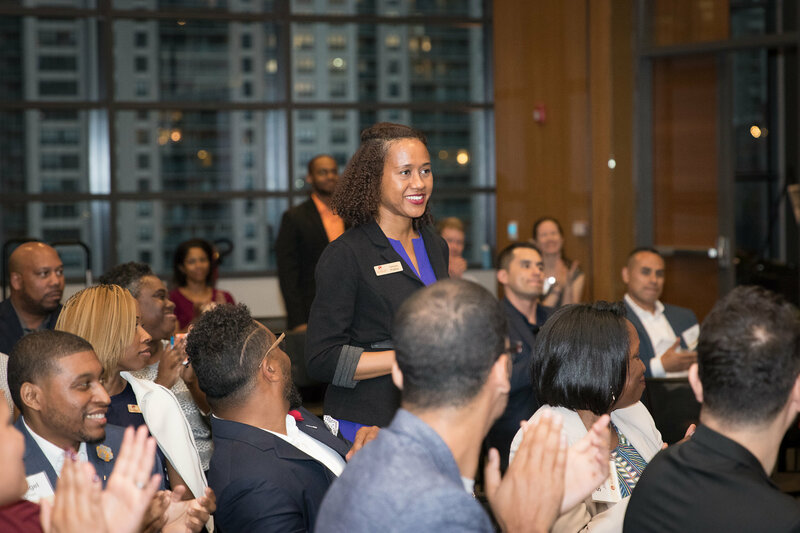 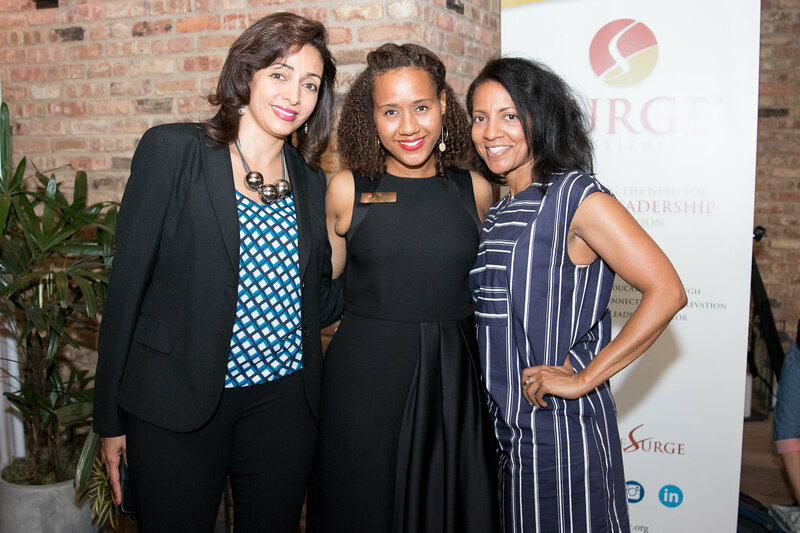 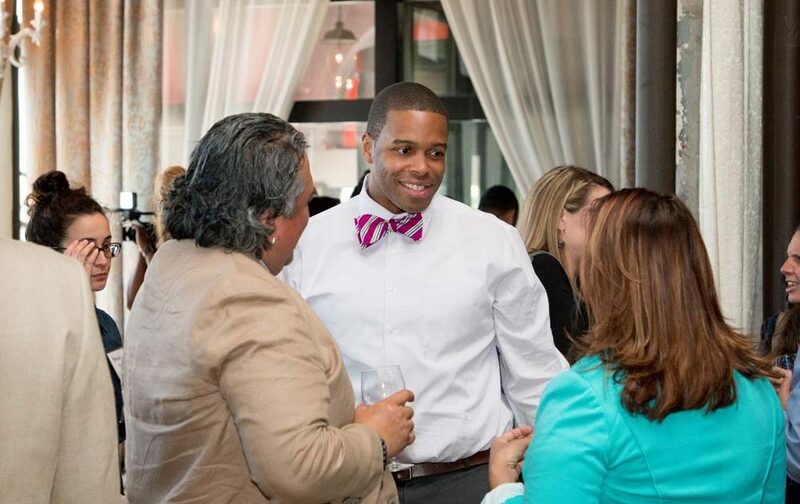 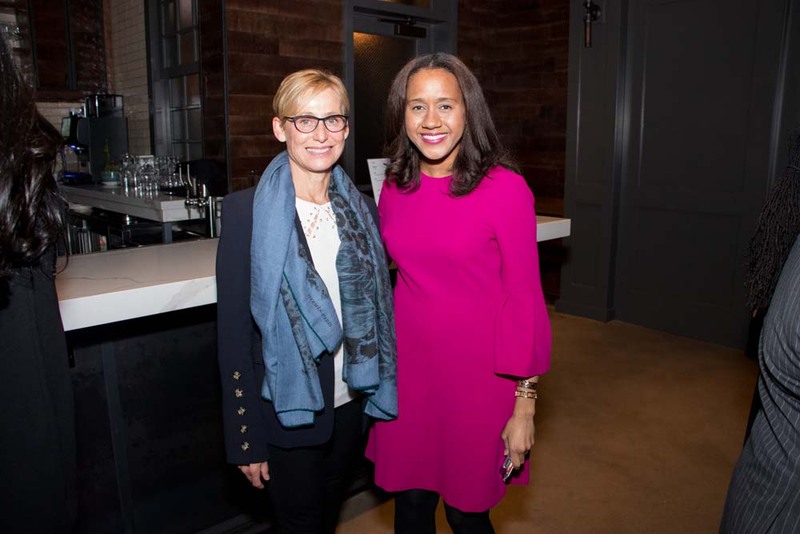 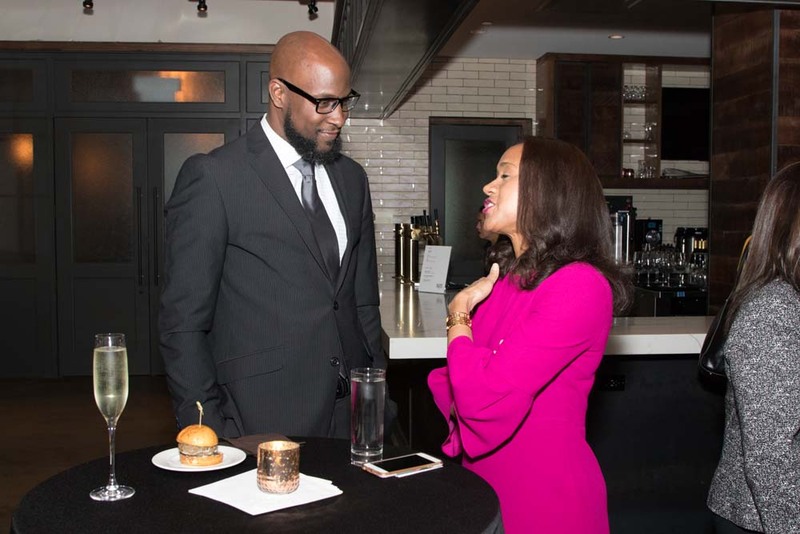 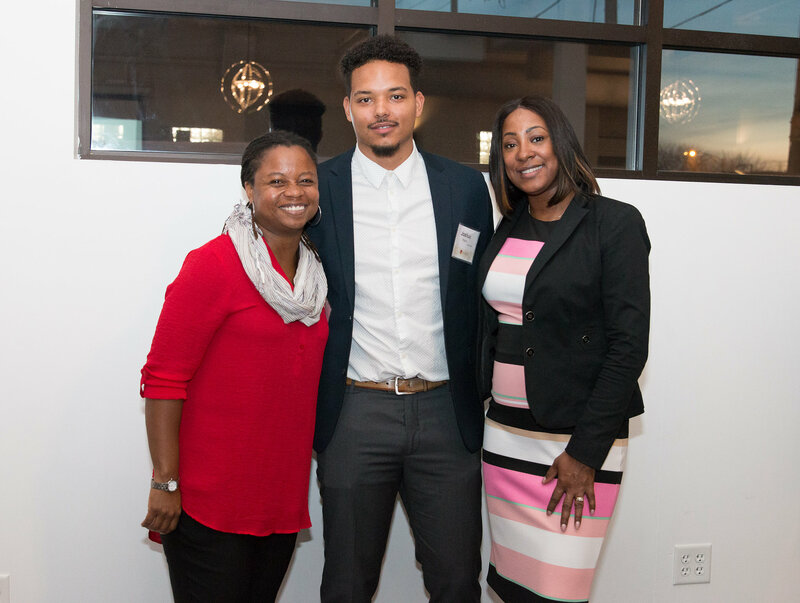 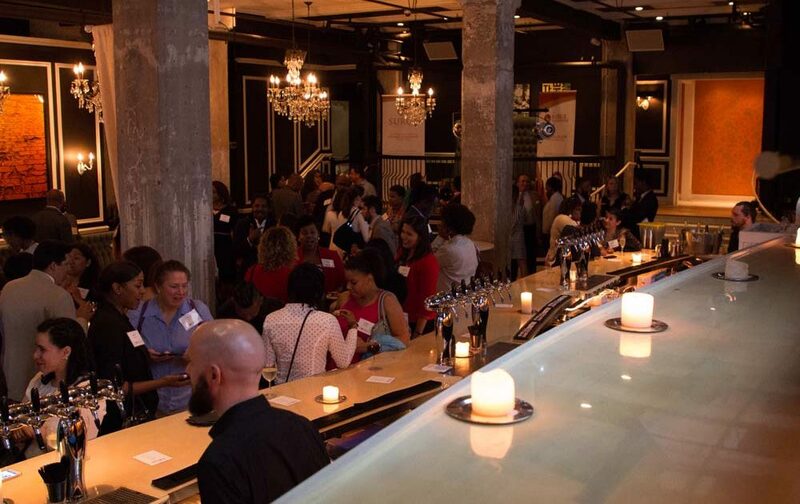 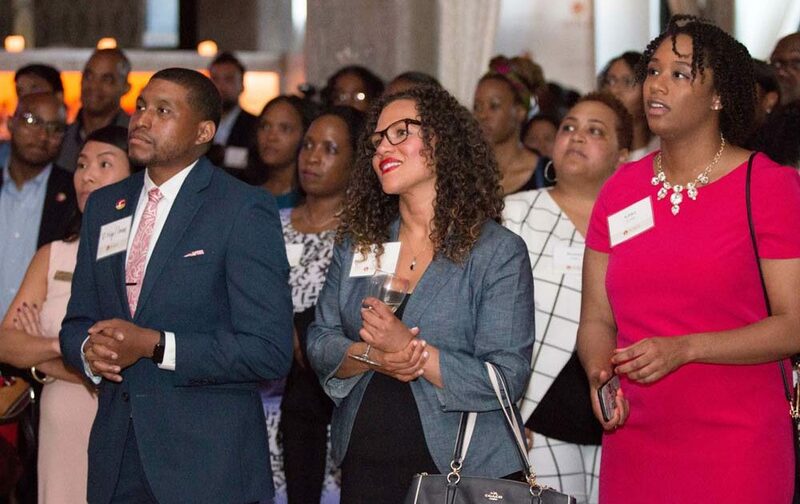 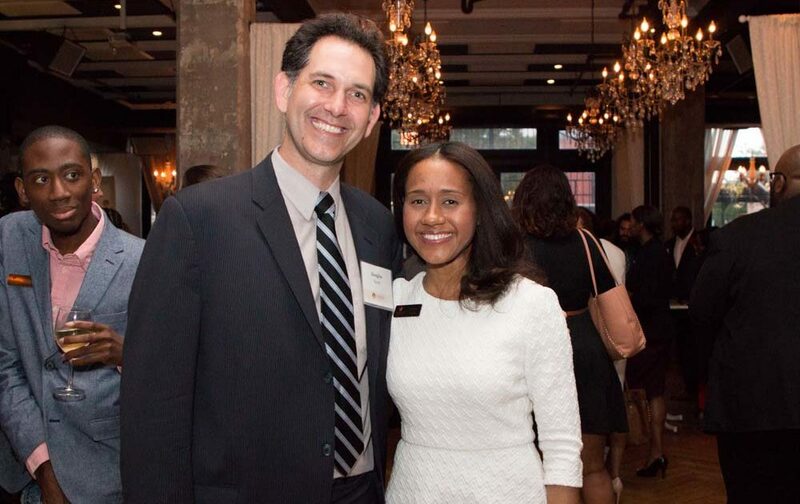 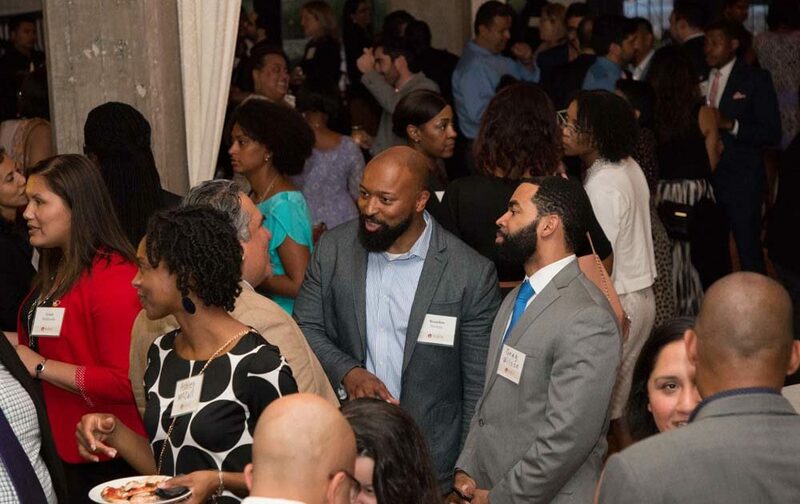 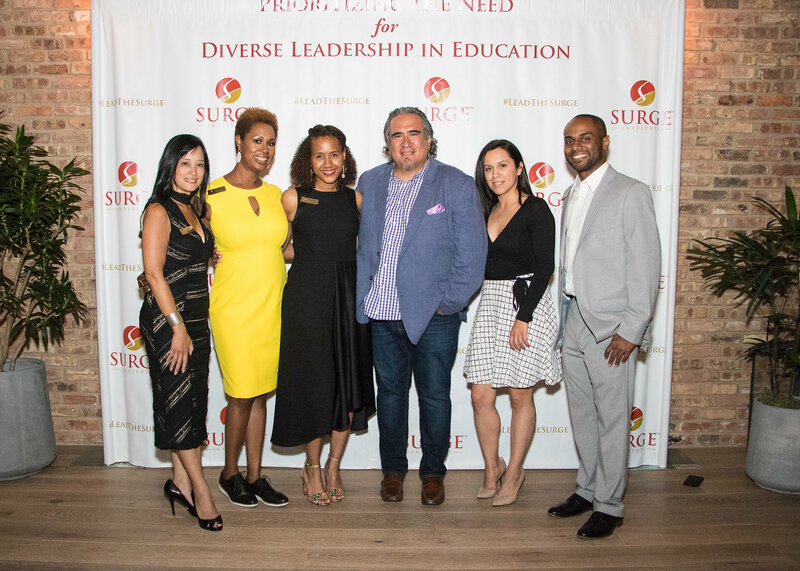 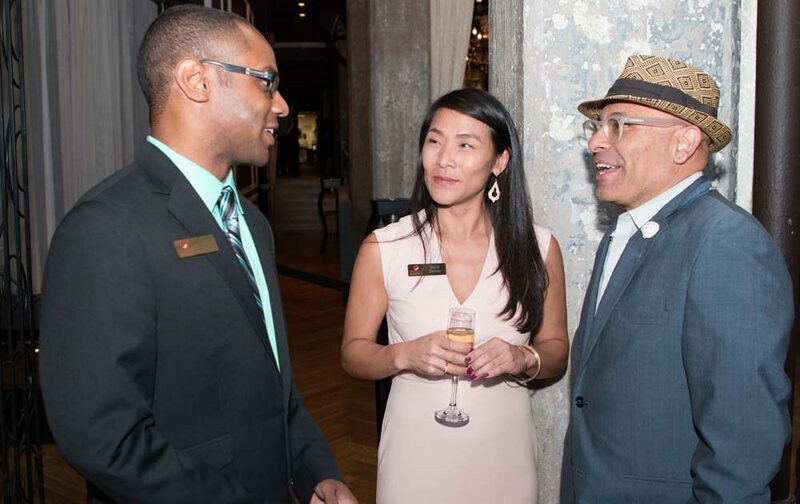 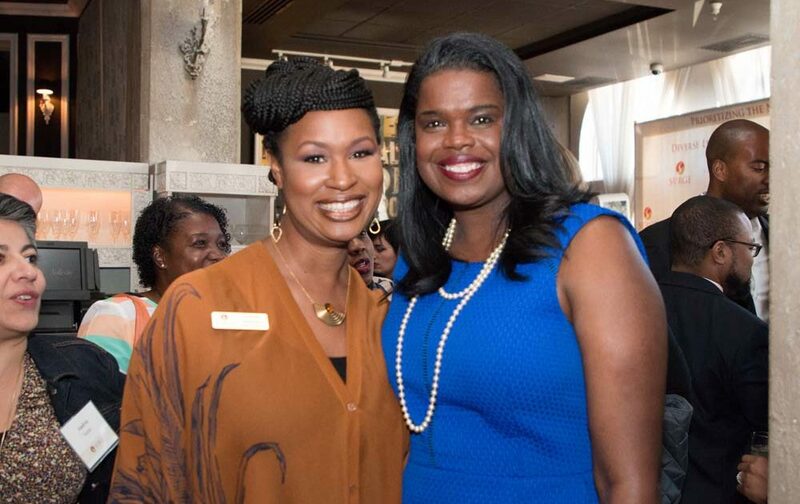 On June 6th, 2017, the Surge community packed Nellcôte for an inspiring night in support of expanding diversity in Chicago’s education leadership pipeline. 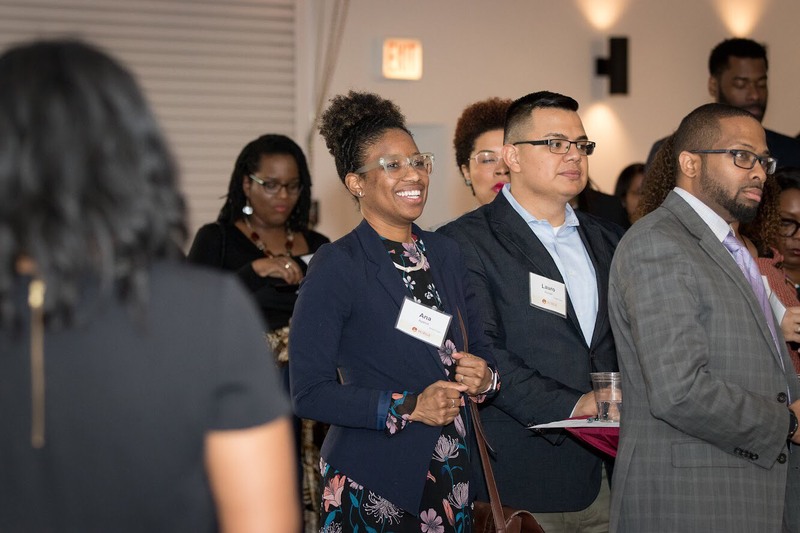 Among the guests were prospective Surge Fellows, partner organizations, and a broad community of education leaders connected to the Surge movement. 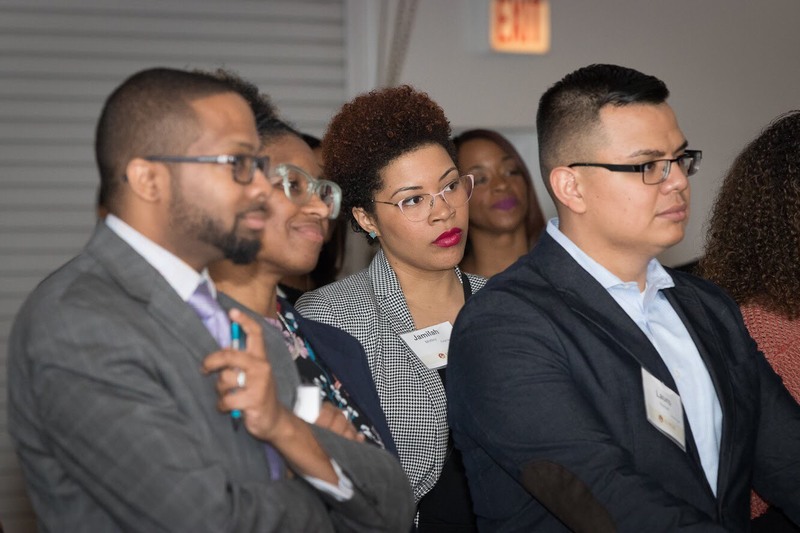 Speakers included Senior Vice President of Community Investment for United Way Jose Rico, 2016 Surge Fellow Khadeejah Lasuc-Lewis, 2017 Surge Fellow Andres Avila, Surge Board Chair Darryl Cobb and Surge Chicago Executive Director Tamara Prather.